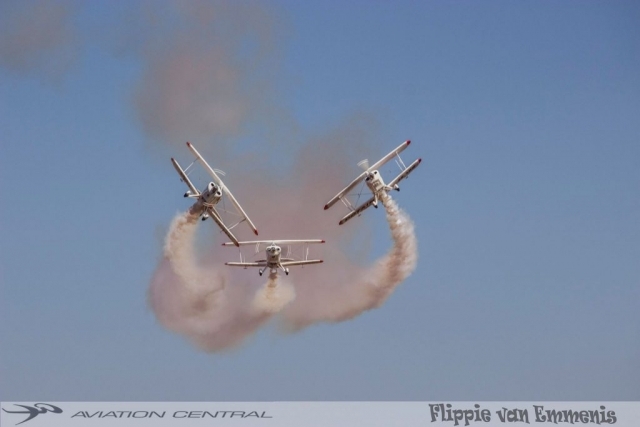 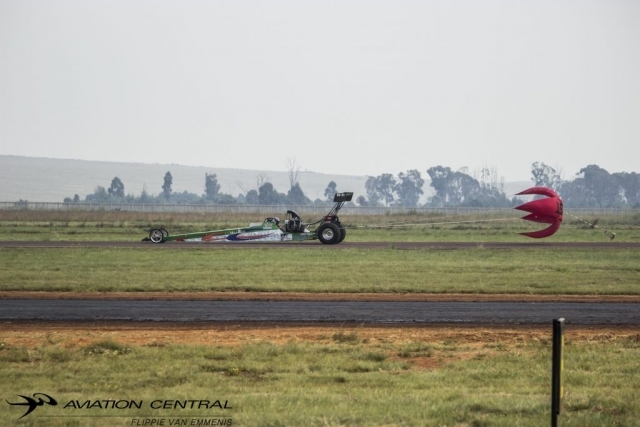 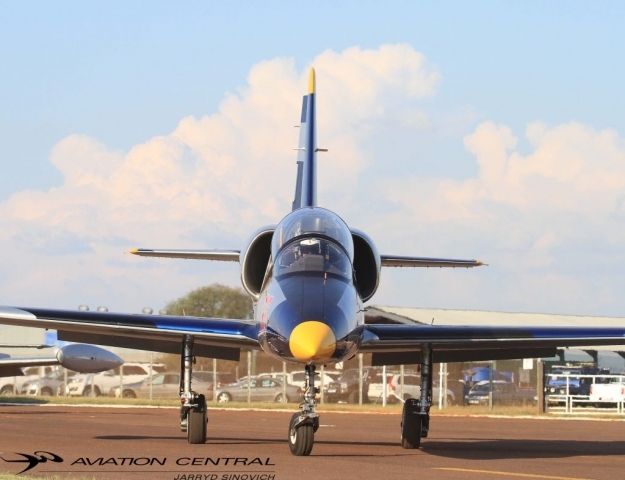 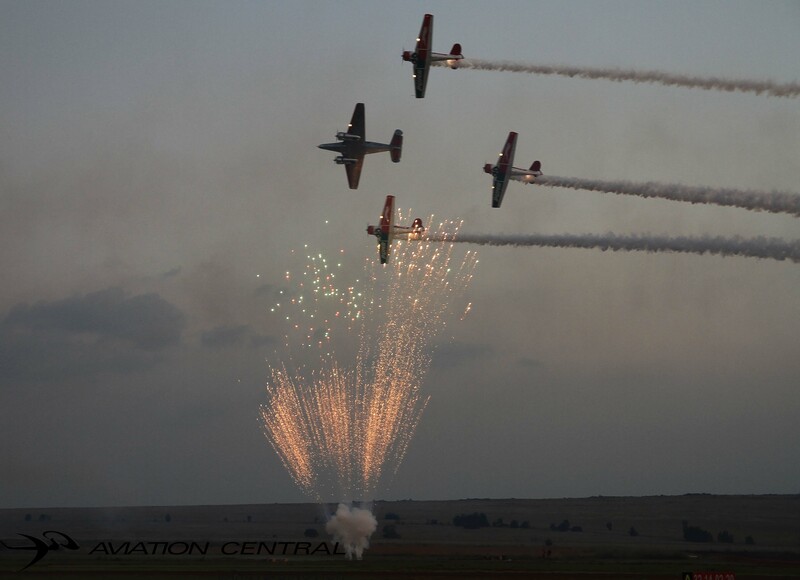 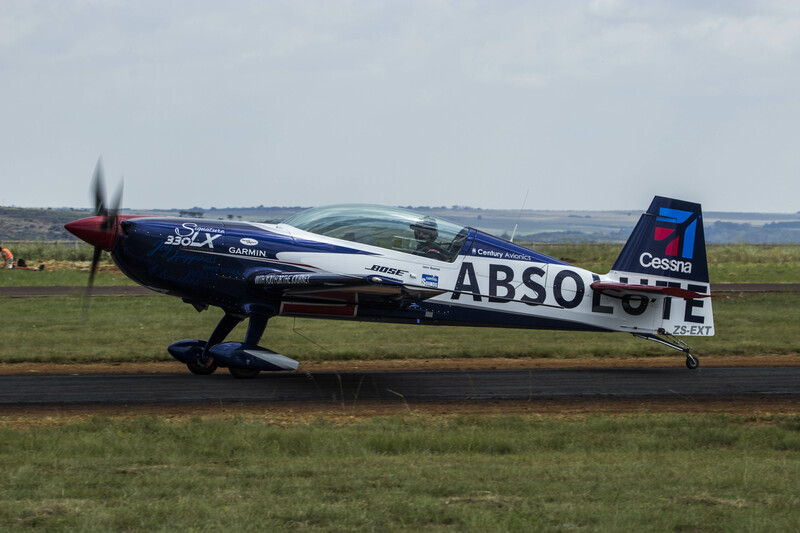 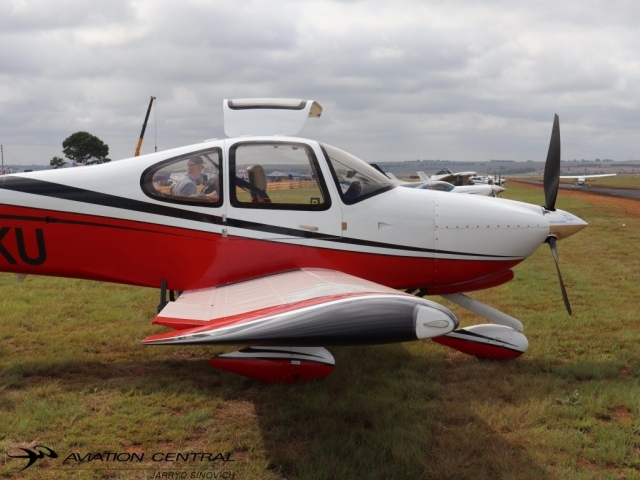 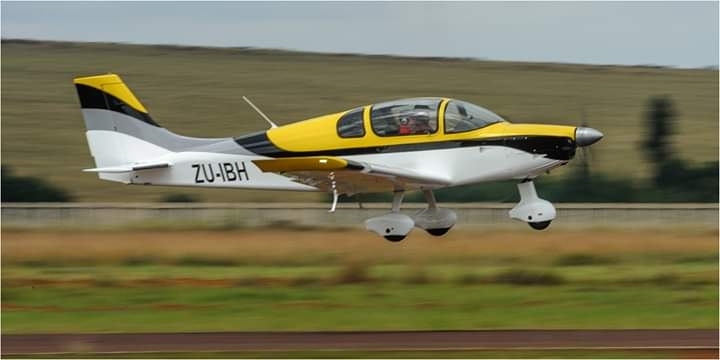 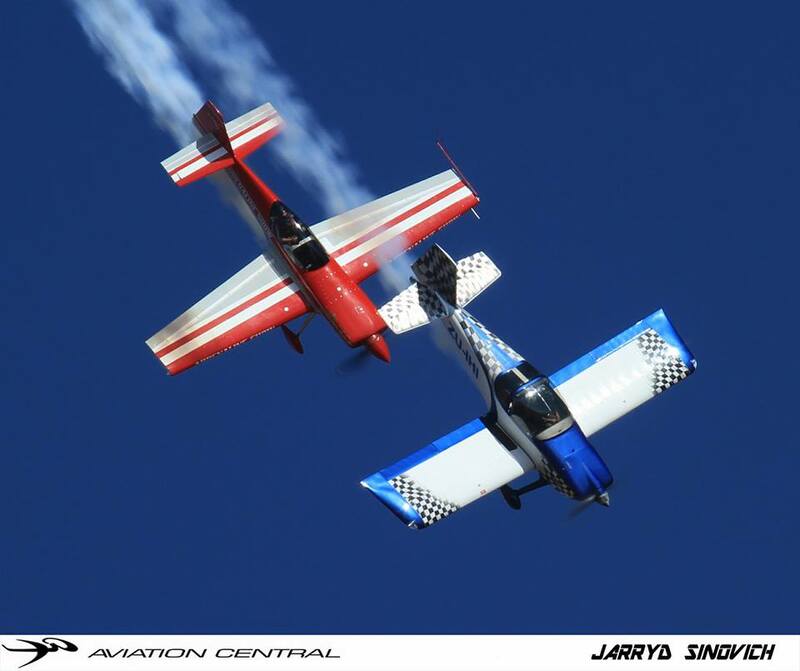 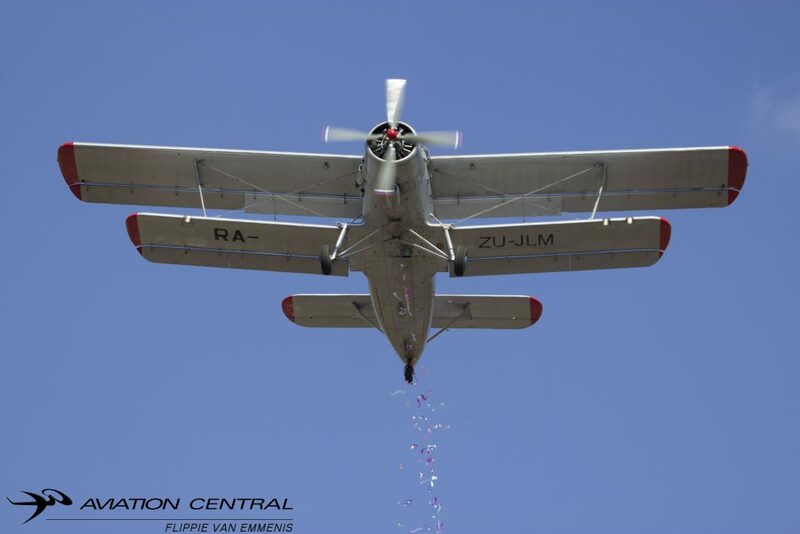 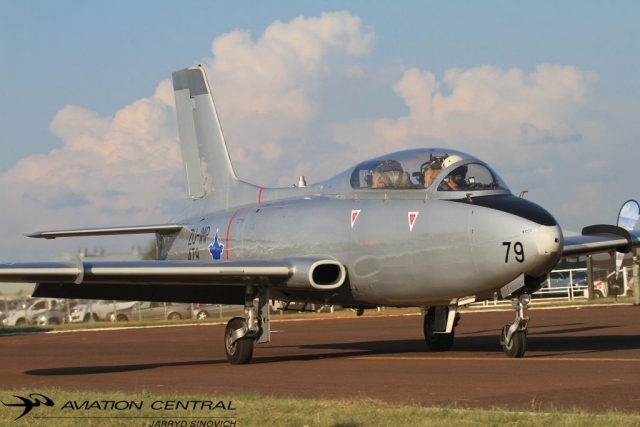 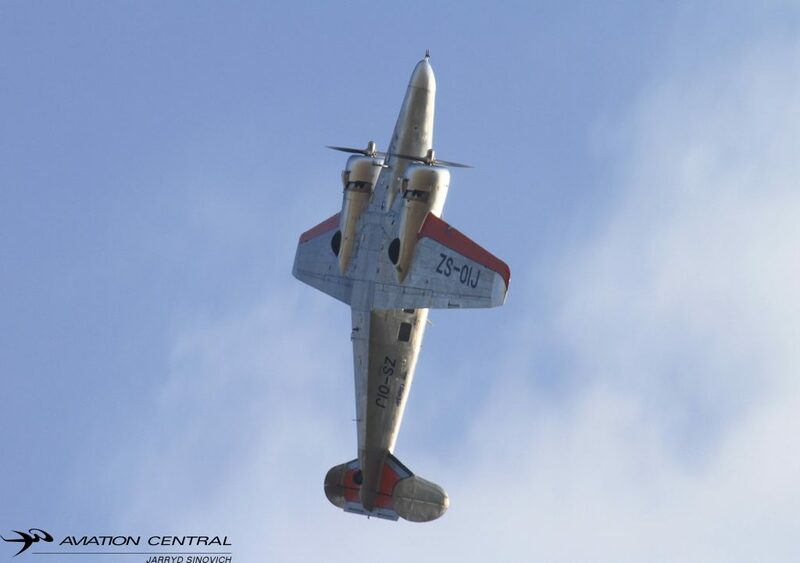 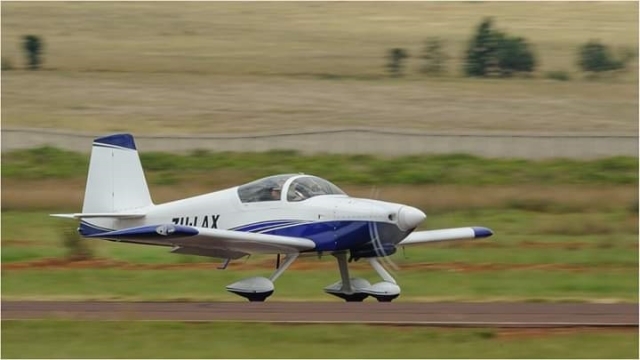 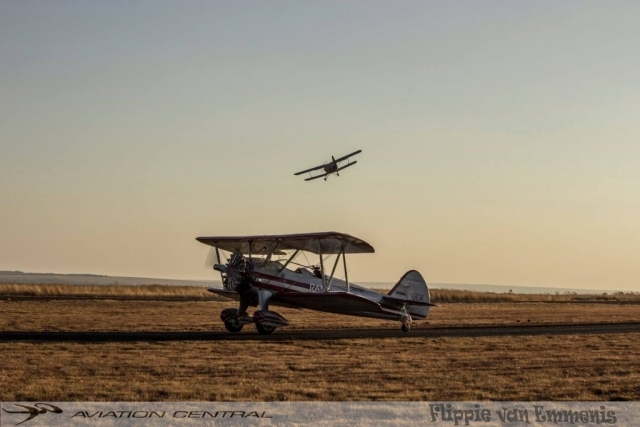 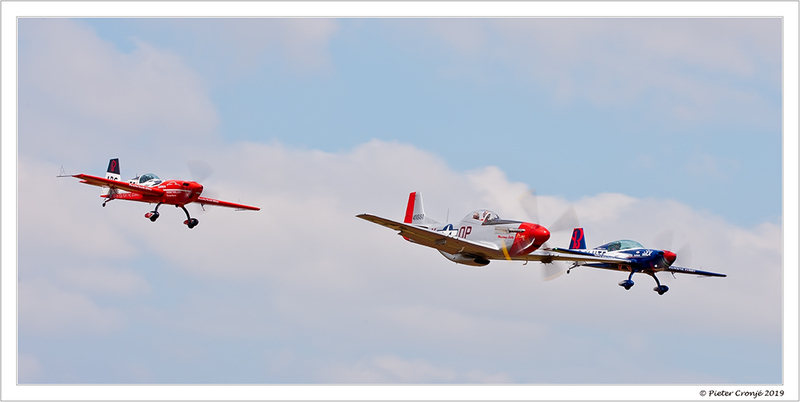 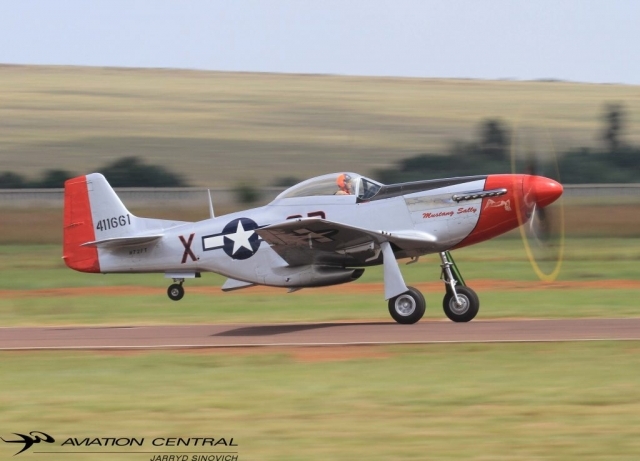 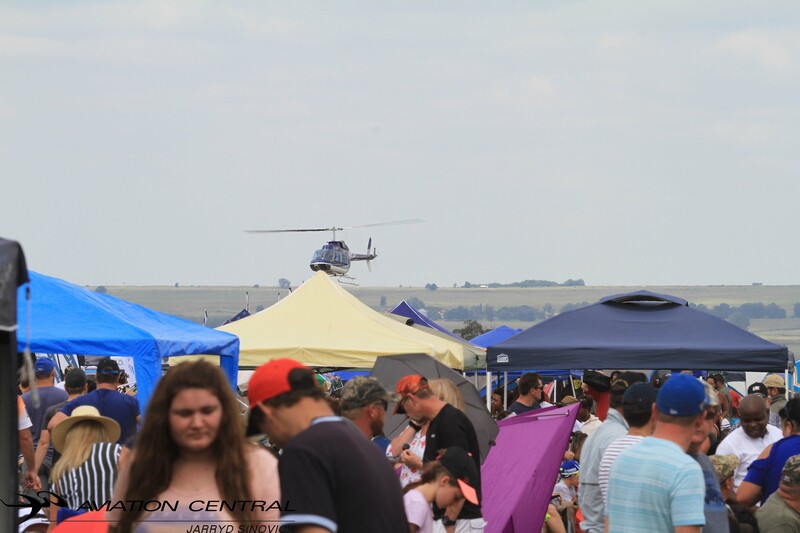 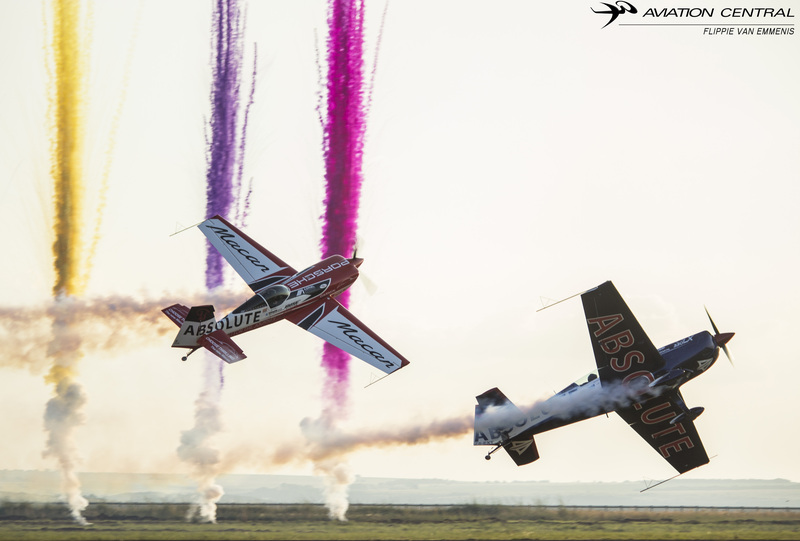 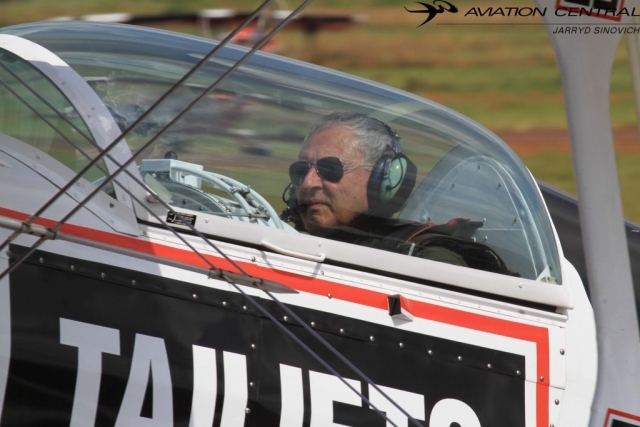 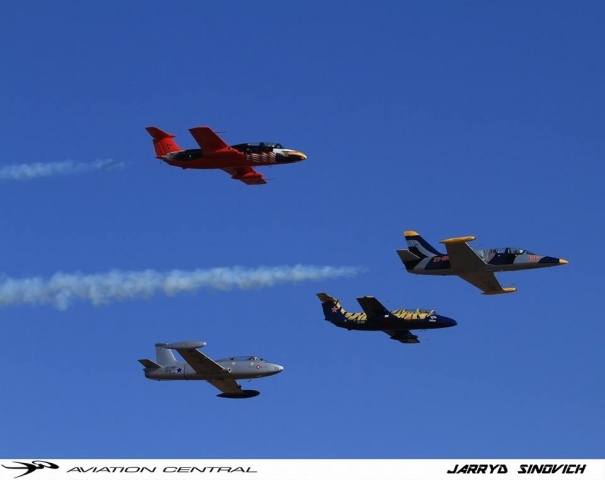 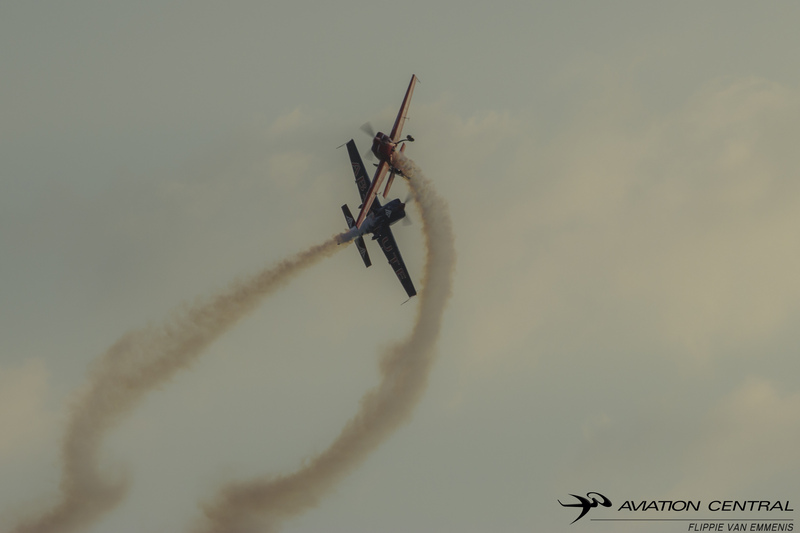 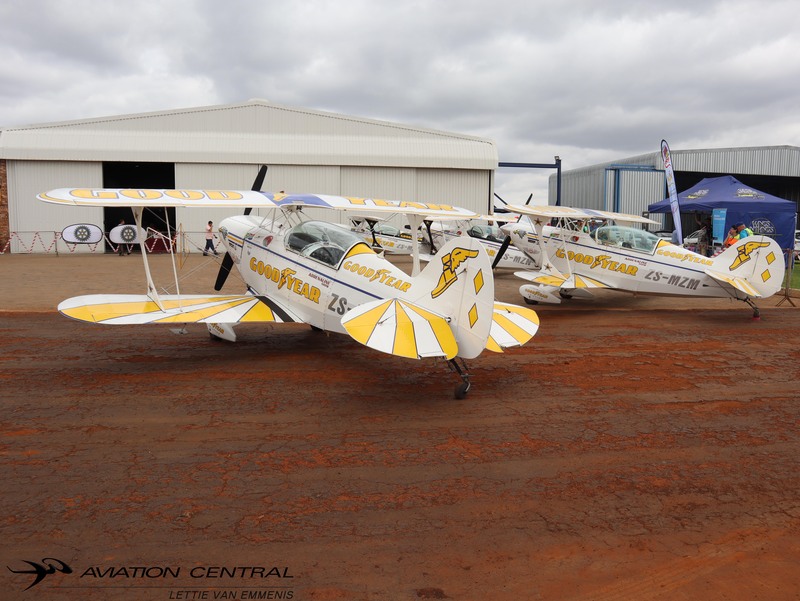 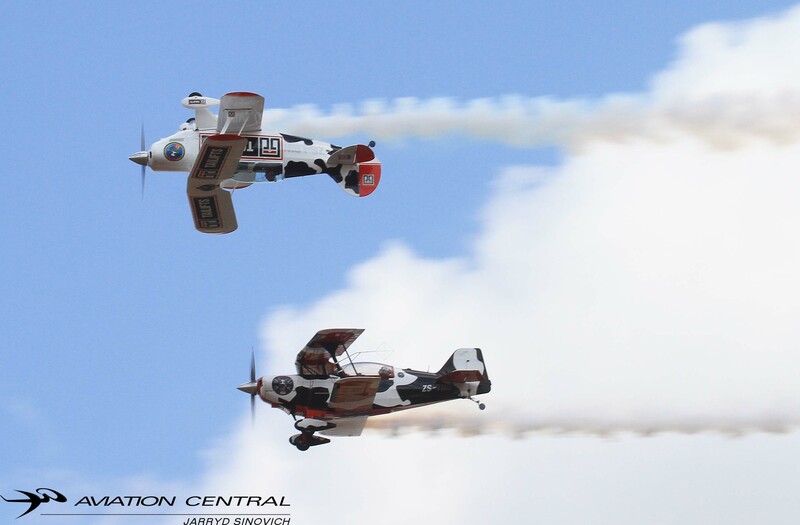 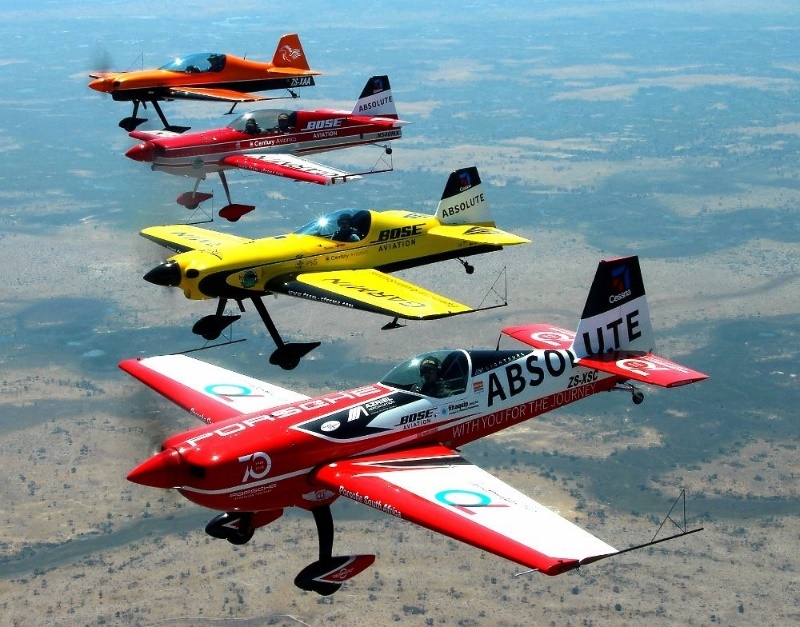 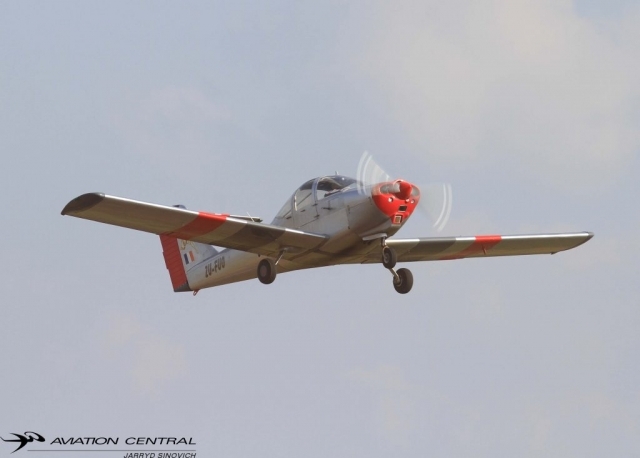 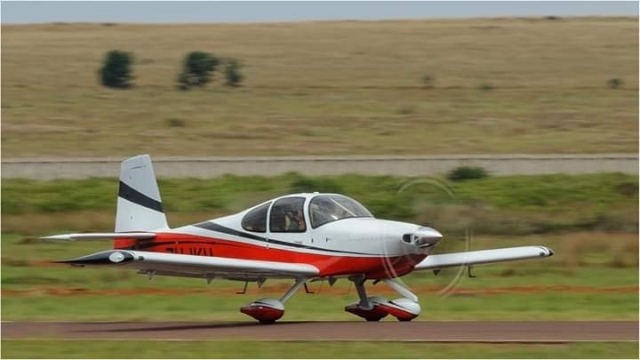 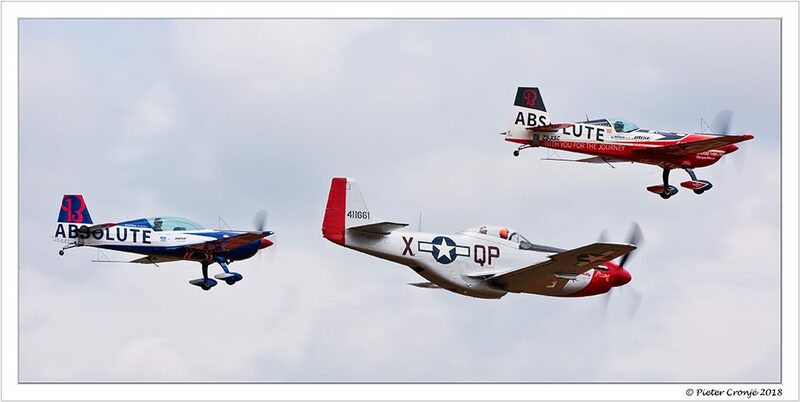 The smell of Avgas, Mogas and Jet A1 filled the skies over Middelburg this past weekend with the first of two Mpumalanga Airshows to take place this year. 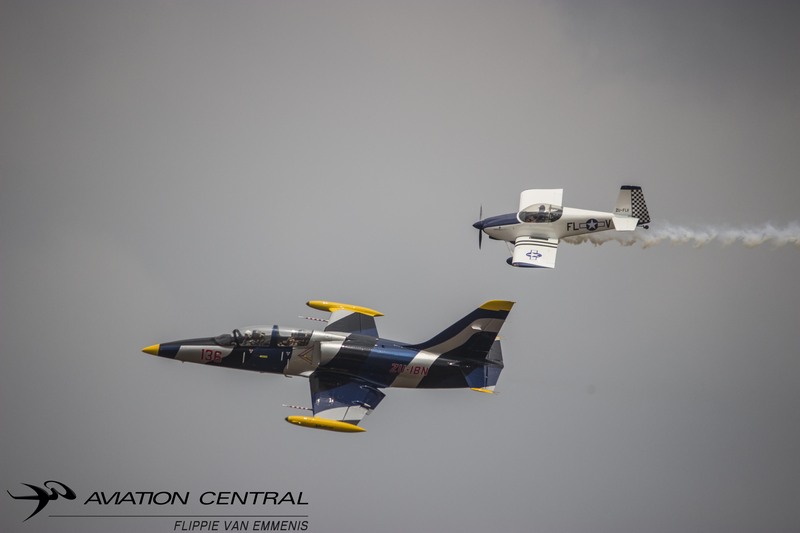 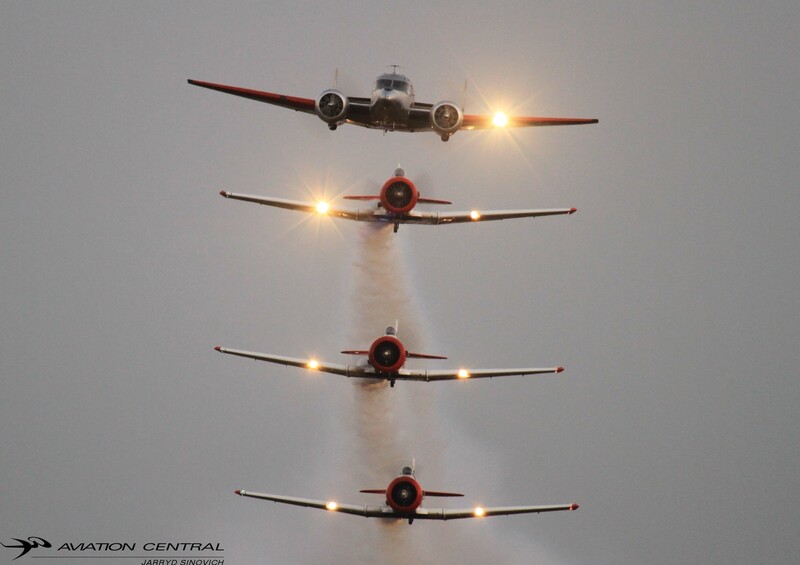 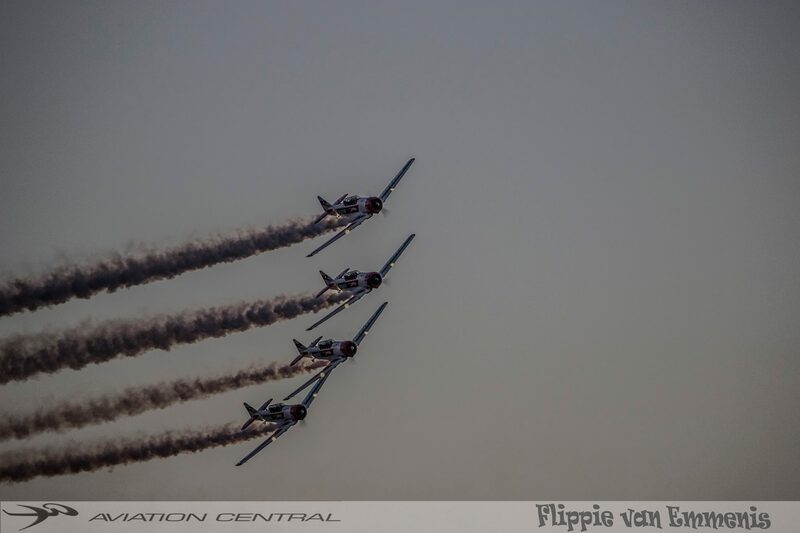 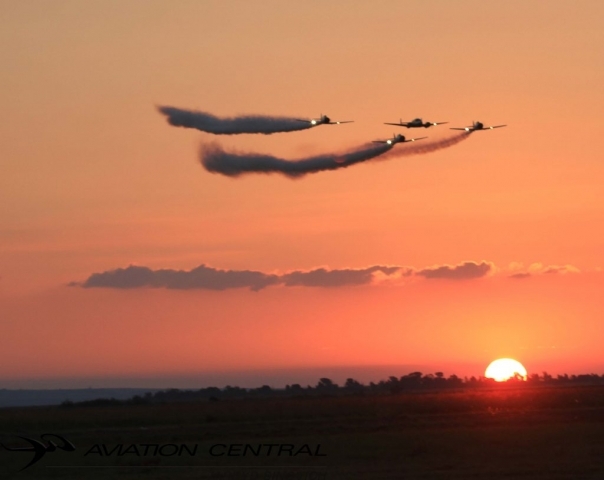 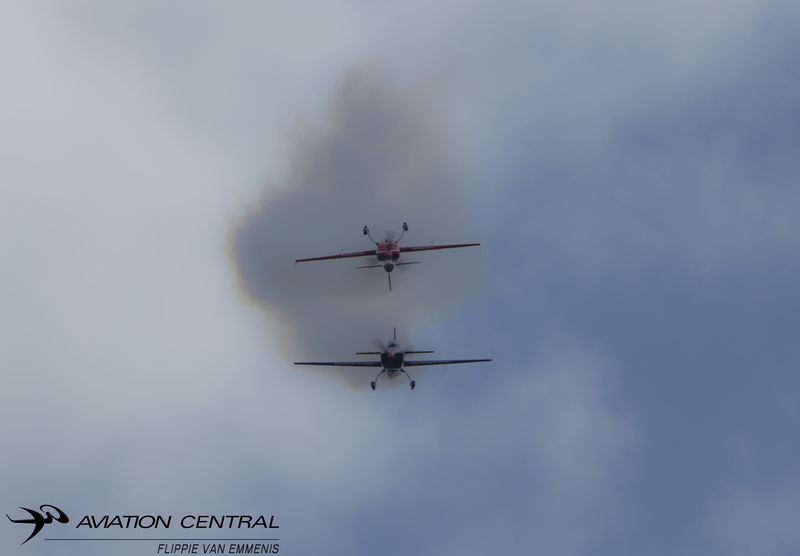 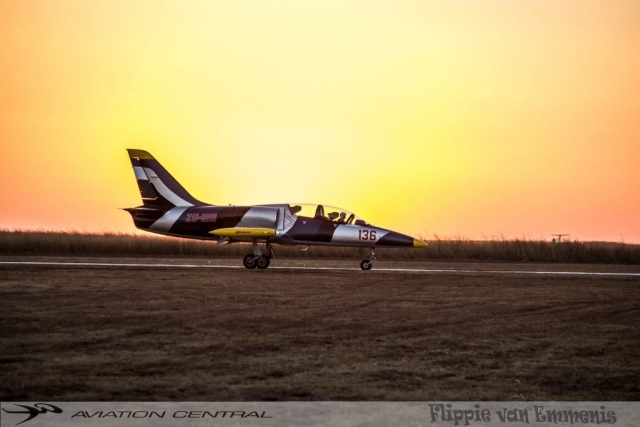 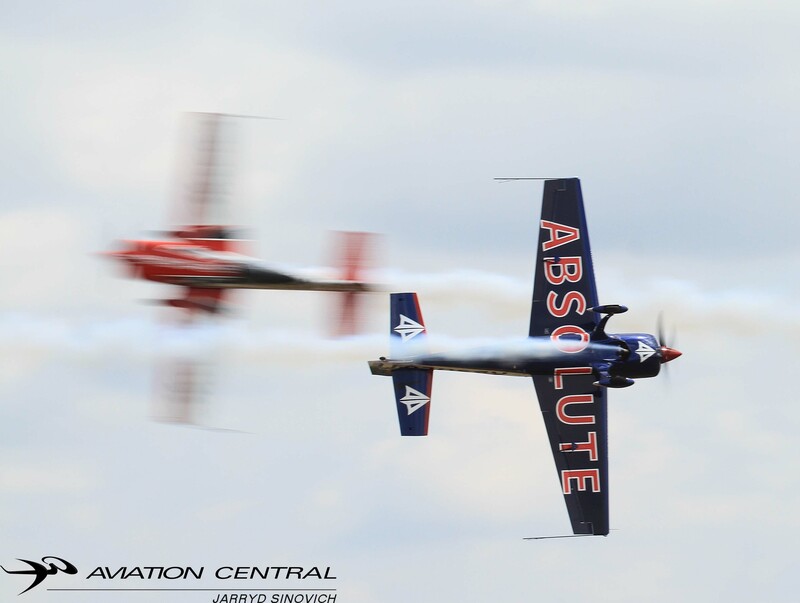 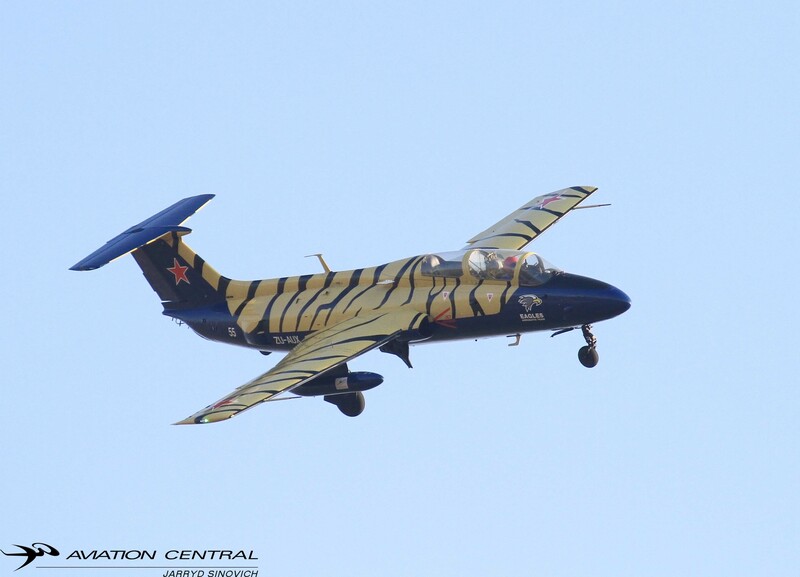 The 2019 Middelburg Airshow returned this year after the planning phase taking place last year with the absence of the show. 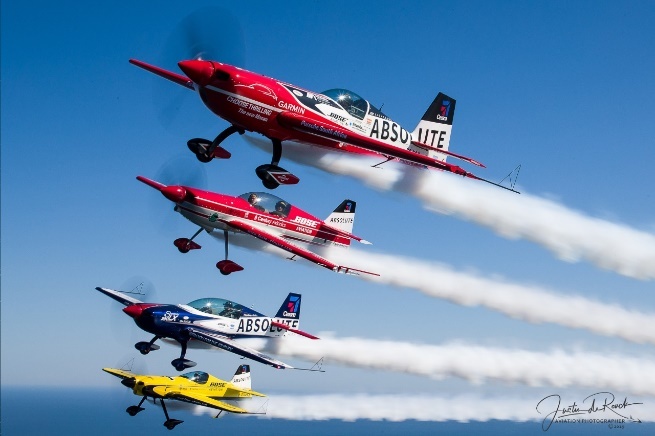 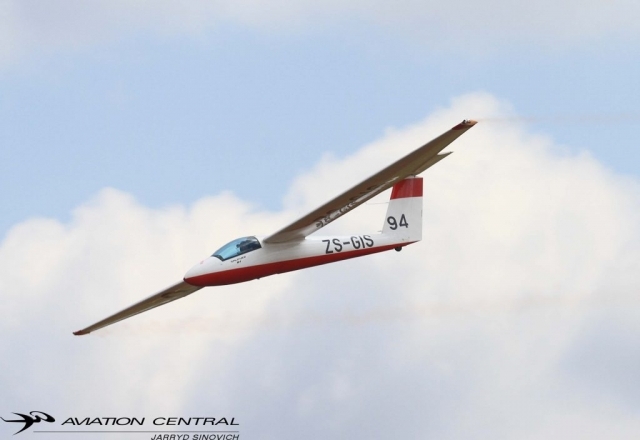 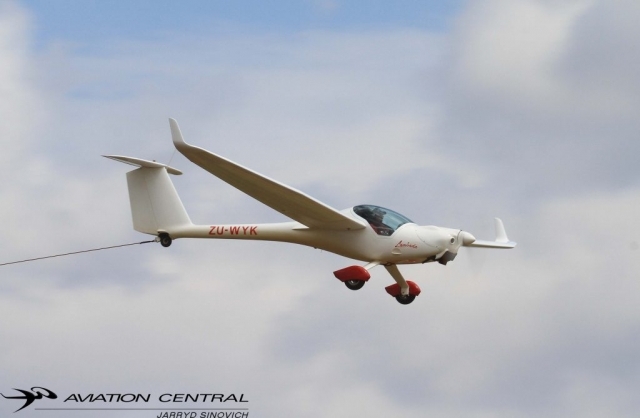 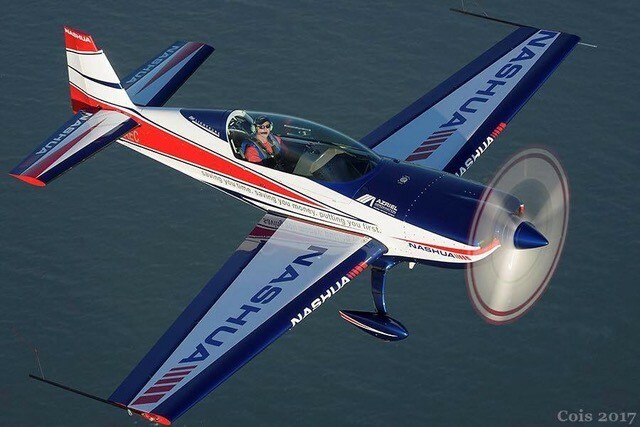 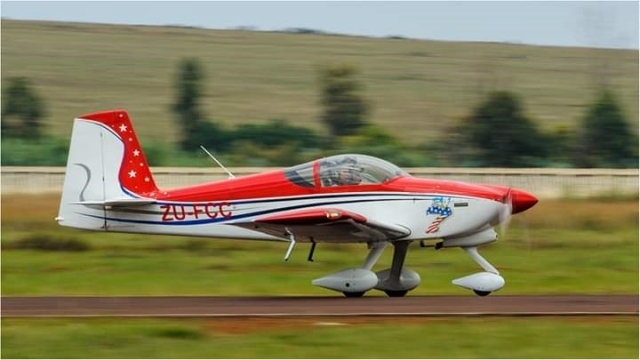 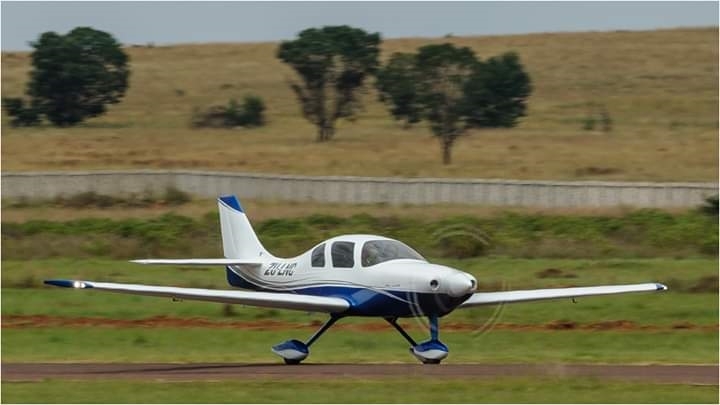 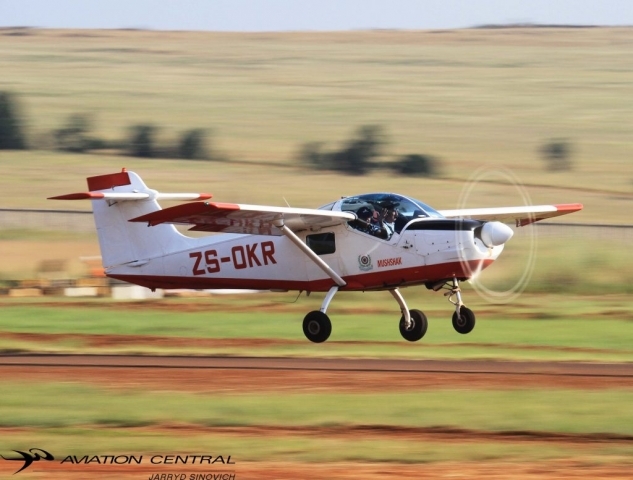 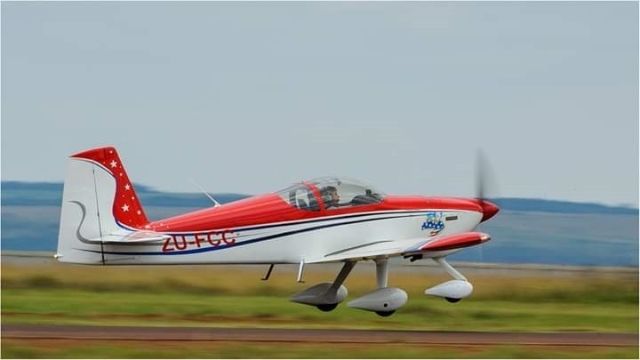 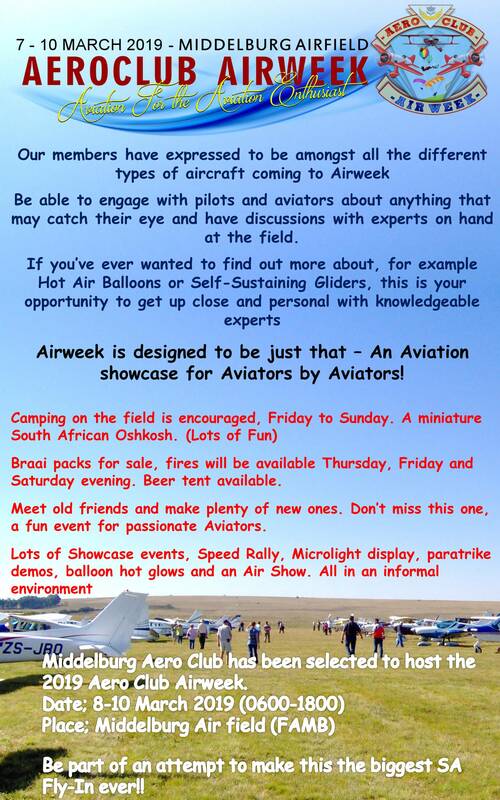 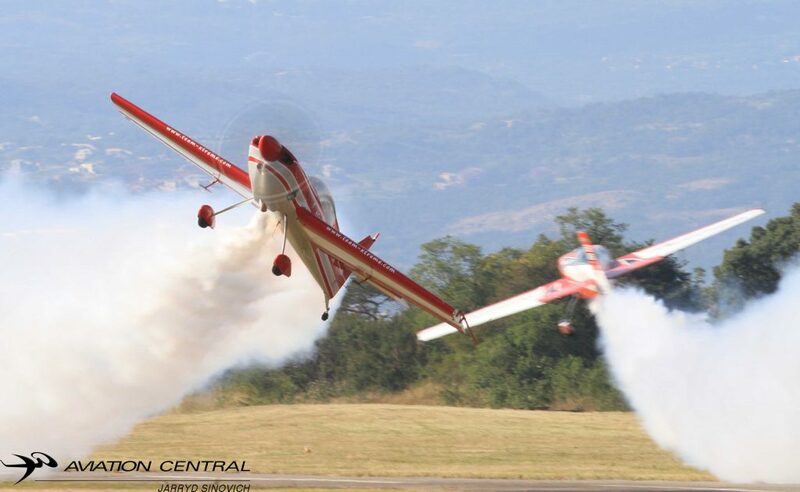 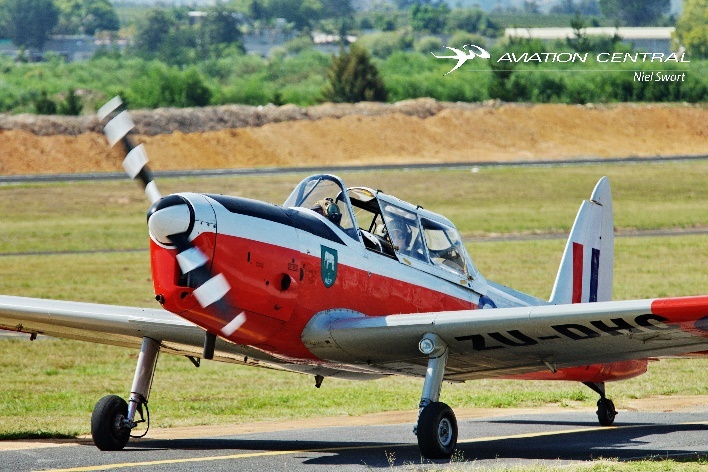 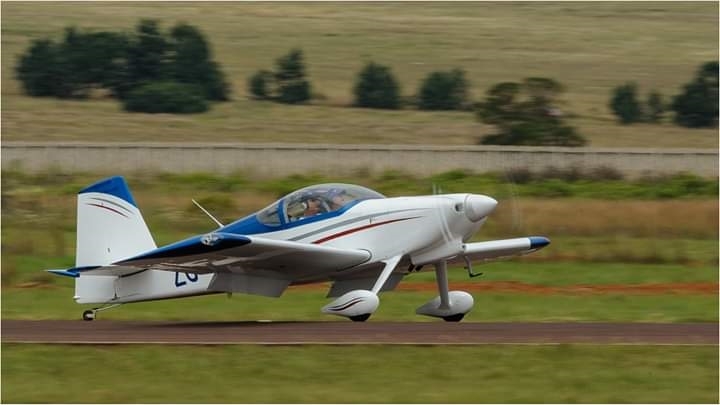 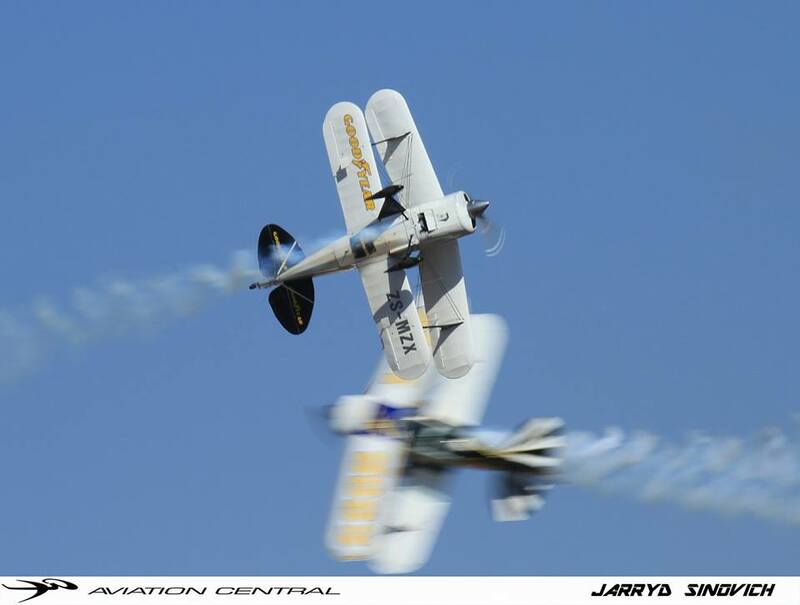 This year the organisers put together a major show with the Aero Club of South Africa having their Airweek and the highly anticipated Airshow. 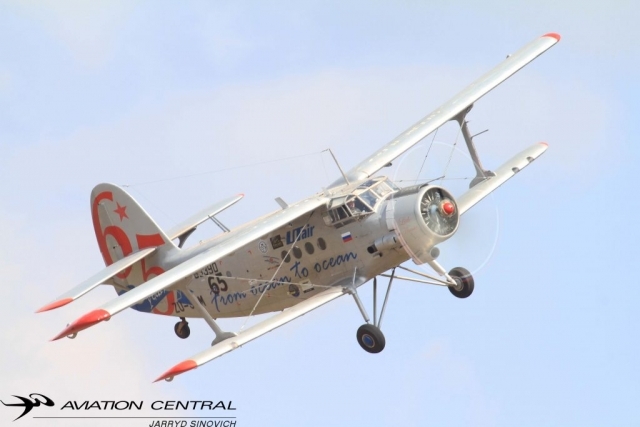 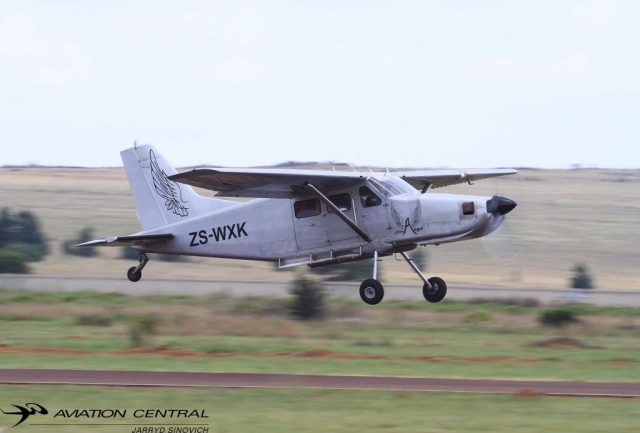 Our team arrived at Middelburg on Thursday the 7th March, thanks to our aviation family Airshow friends “Just Love Mission” Little Annie the sole surving Antonov two on the Airshow circuit. 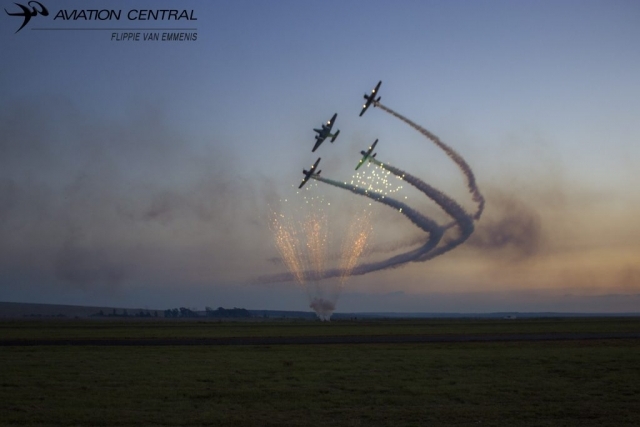 We were extremely honored to be invited days before the show by Richard and Irene Lovett, organisers of past present and now future airshows at Middelburg Airfield. 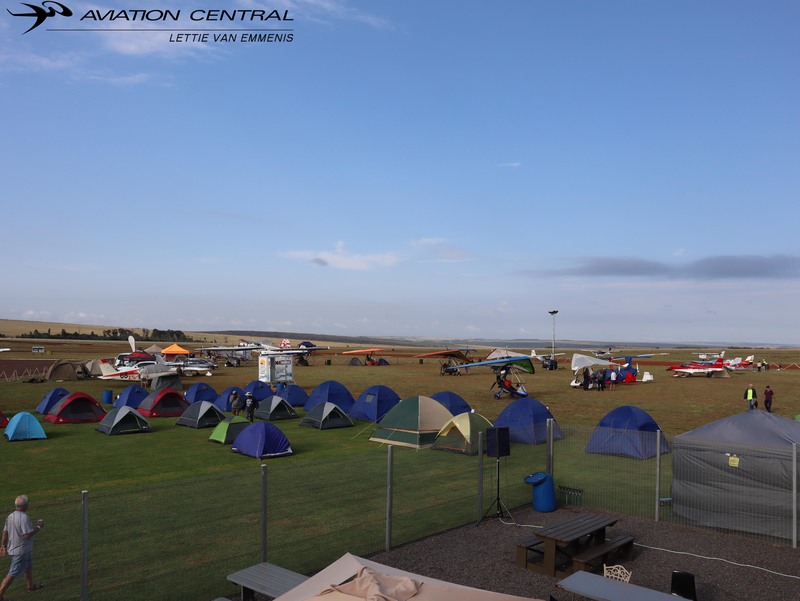 Our media liaison officer Mark Mansfield organized all our accommodation, once again treated to the hospitality of the Lovett Family. 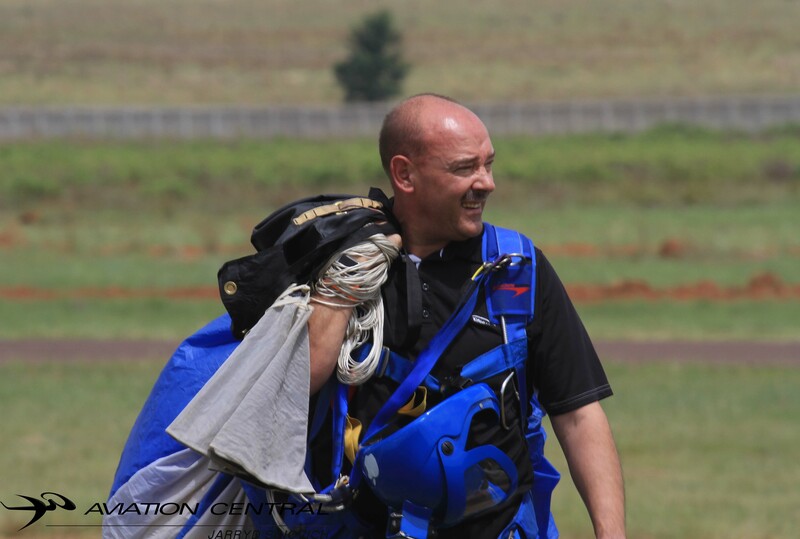 Mark also kept us up to date before and after the show with all necessary news updates. 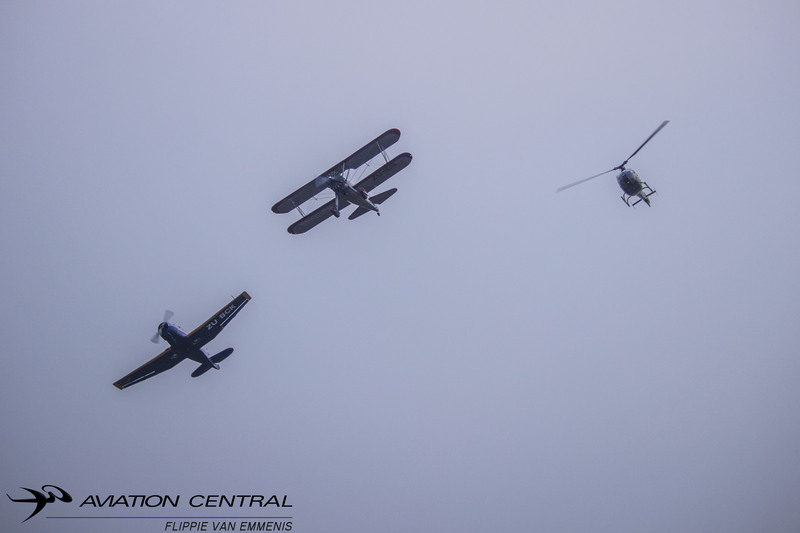 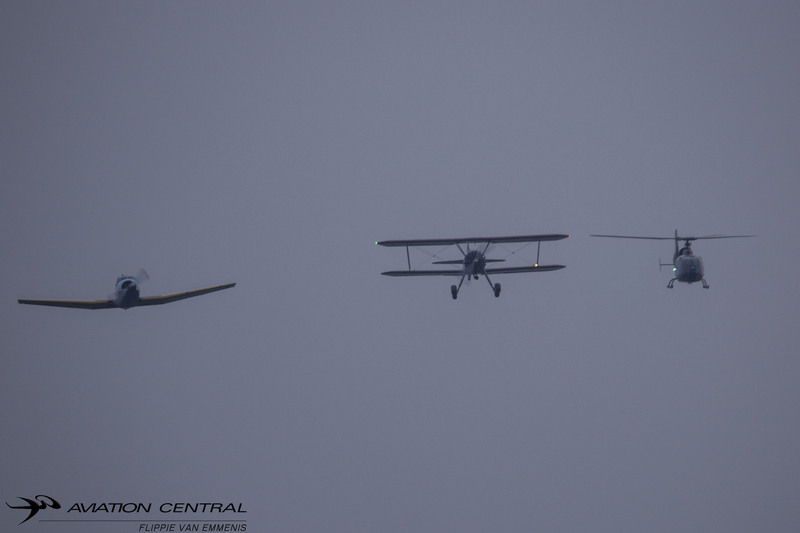 Friday evening, we were treated to some early evening flying from Riaan Prinsloo, Ivan Van der Schaar and Juba Joubert in a Yak18T, Boeing Stearman and an Aerospatiale Gazelle in formation. 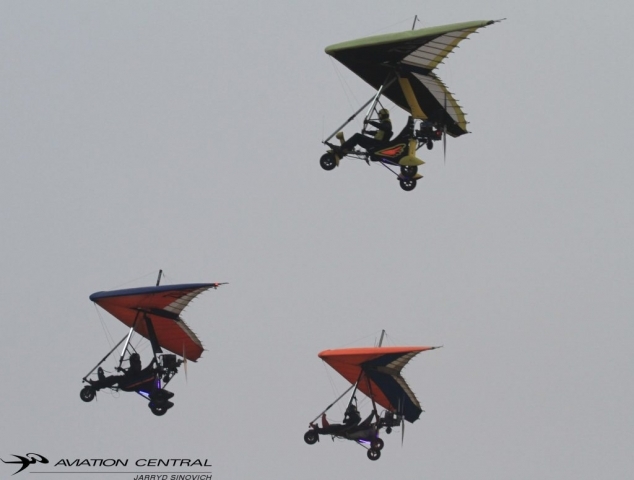 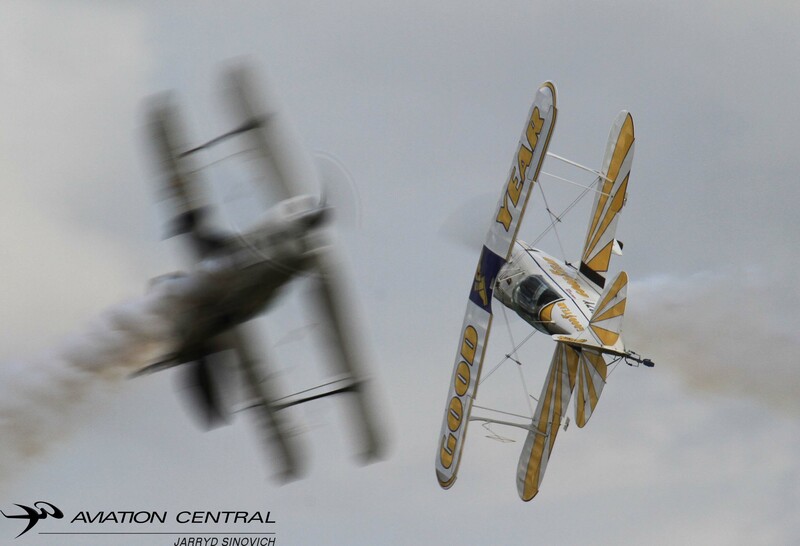 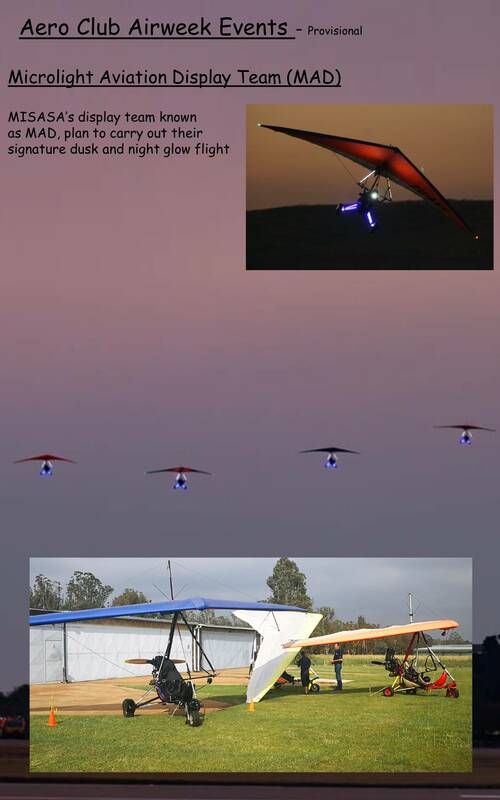 The Grasslands based Misasa Aerial Display Team-MAD microlights showed off their Led lights in close formation. 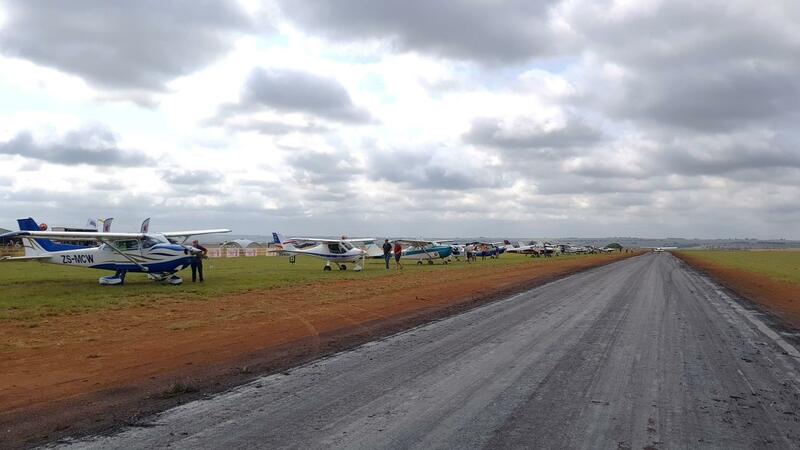 A number of aircraft flew in between Thursday and Saturday of the event. 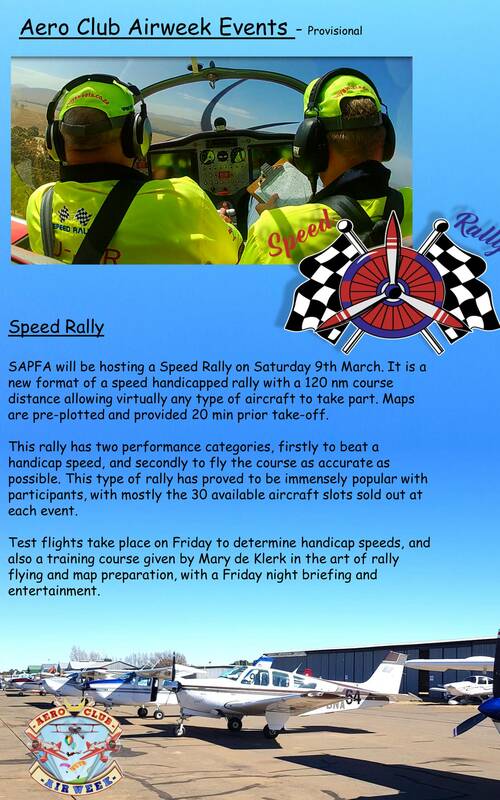 Saturday morning the now exciting Speed Rally took place with some of the SAPFA members flying the speed navigation rally, which is similar to the fun rally’s we usually attend. Except that the rally is given a pre-determined handicap speed, based on a selected power setting to each aircraft. On show day, Hot Air balloons filled the morning sky above Middelburg. 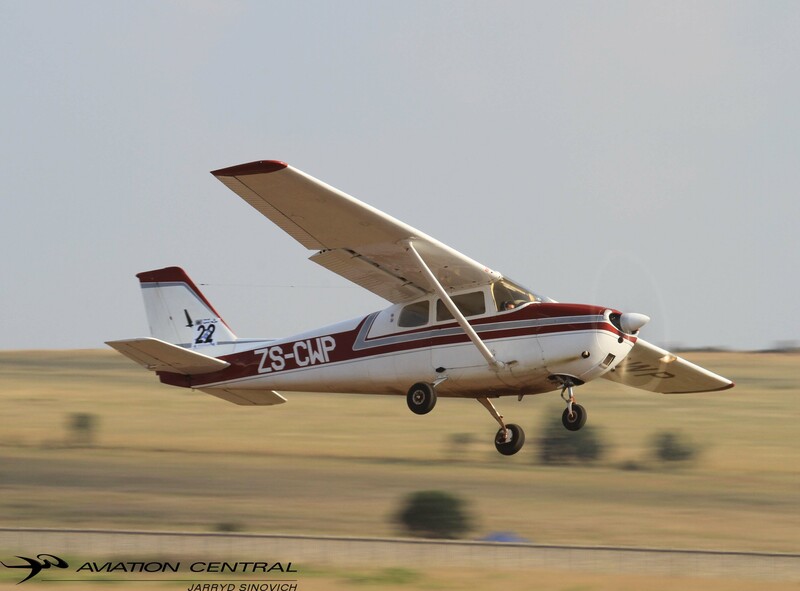 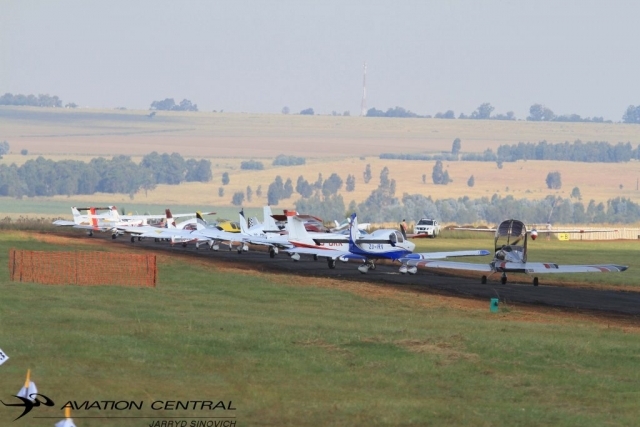 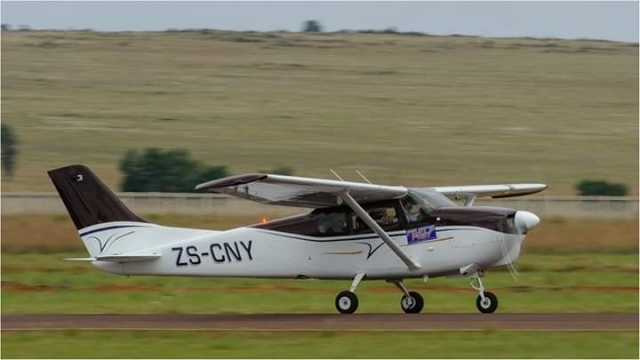 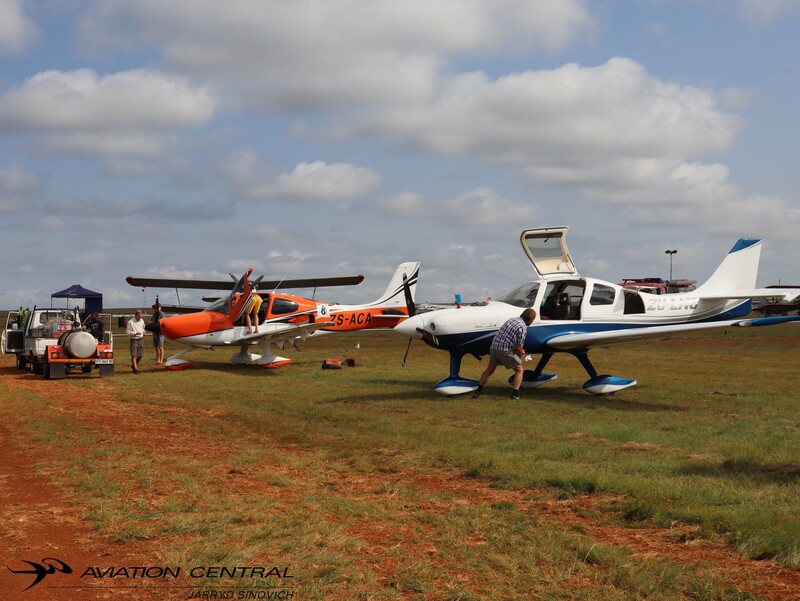 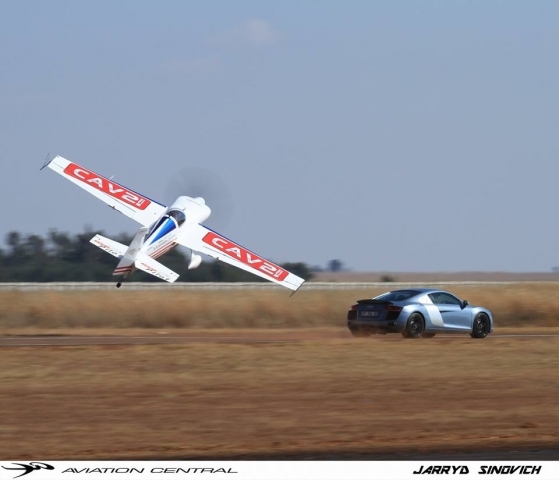 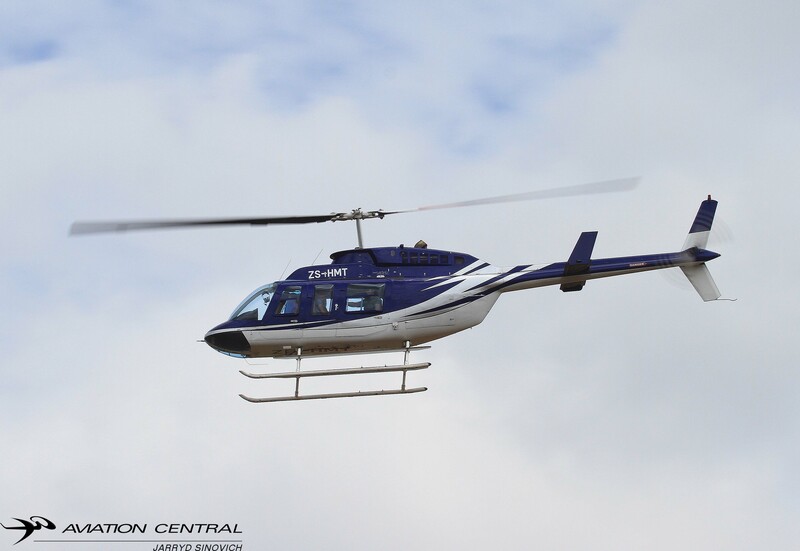 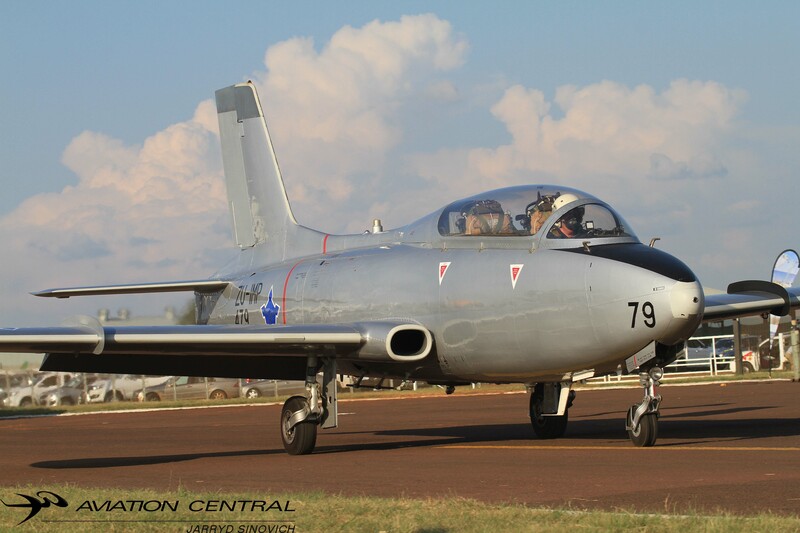 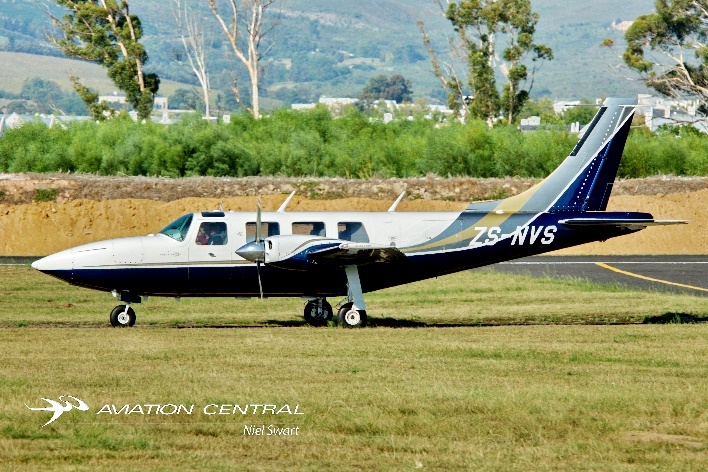 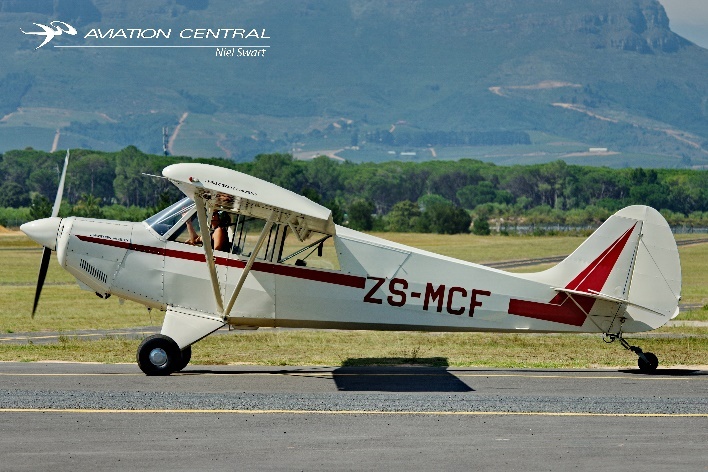 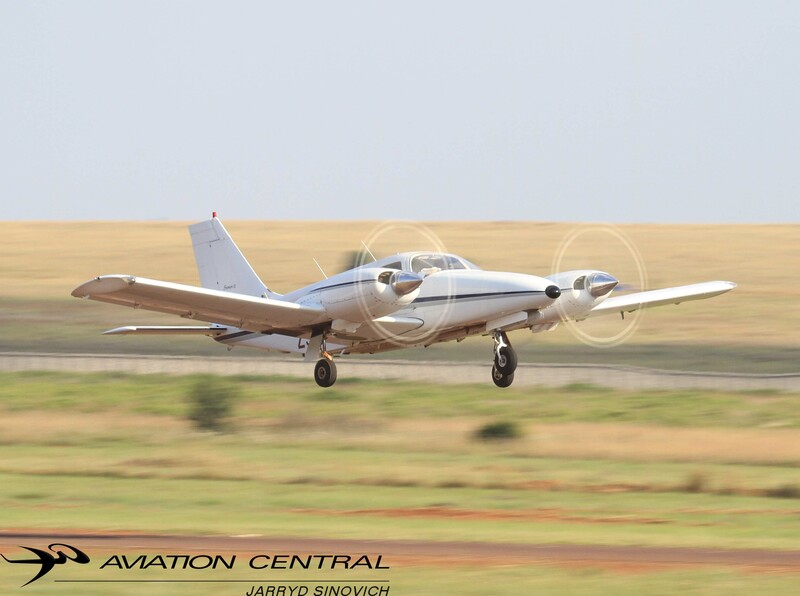 While some of the participating show aircraft made their way in from neighboring Gauteng airports and elsewhere. 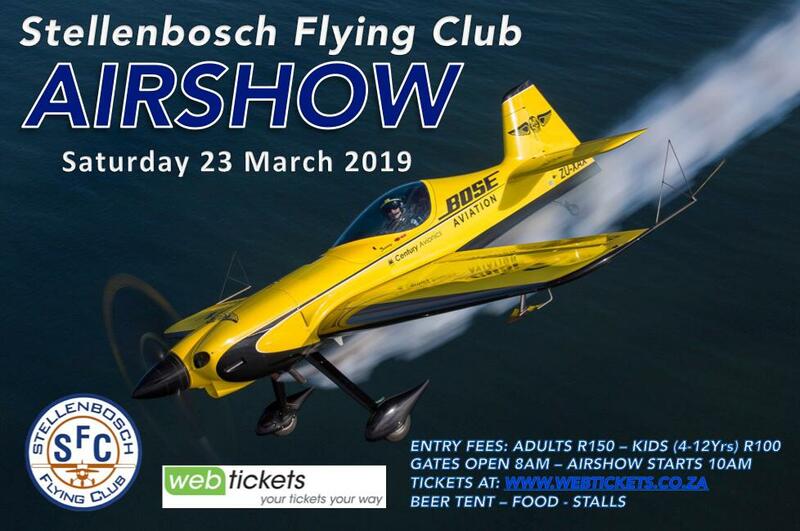 A new plan at some of the airshows in South Africa this year is to have an afternoon show instead of the entire day having a full program with many repeats. 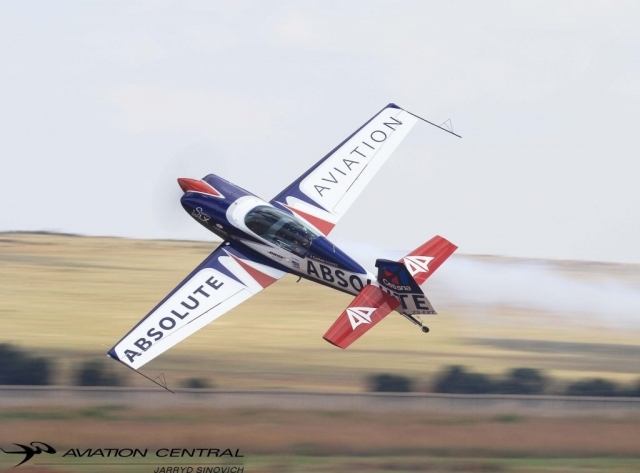 This show had no repeats and a full program with no gaps in between. 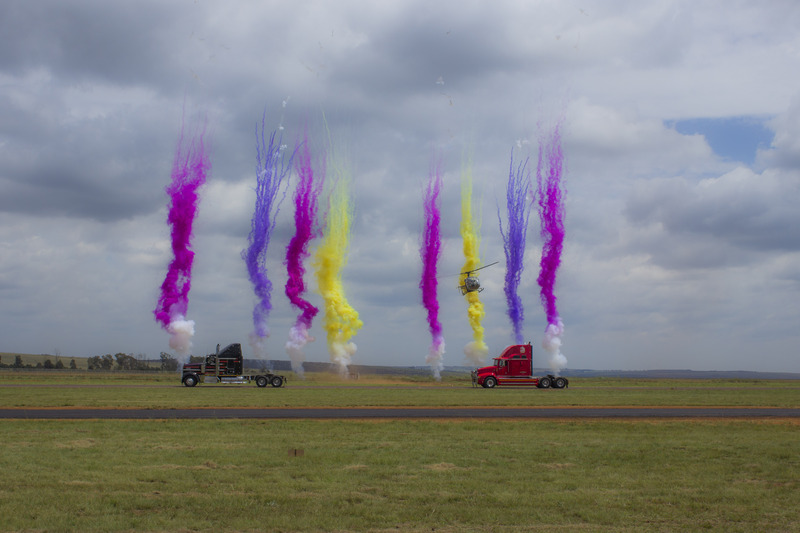 A cavalcade of Trucks opened the show with Juba Joubert flying the Alouettes II above the line of trucks while Capital Sounds provided as always, the vibe to the Airshow circuits thanks to Brian Emmenis and his great team who put together sound and information on each act in the slot of the event. 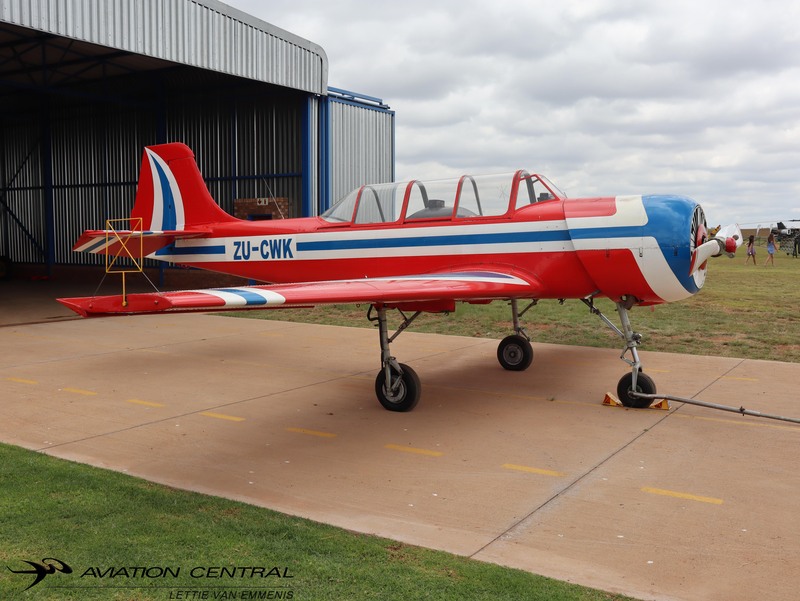 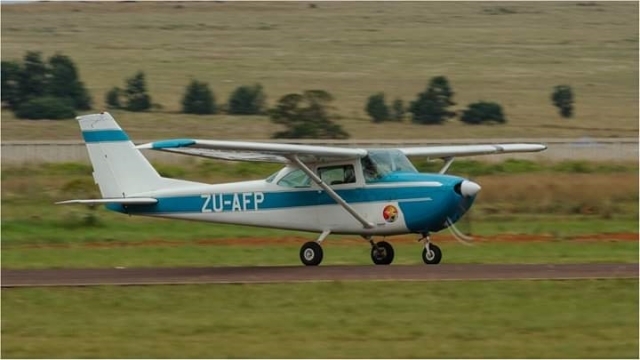 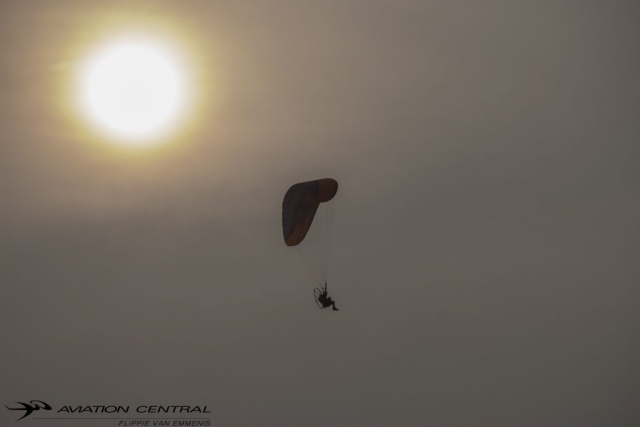 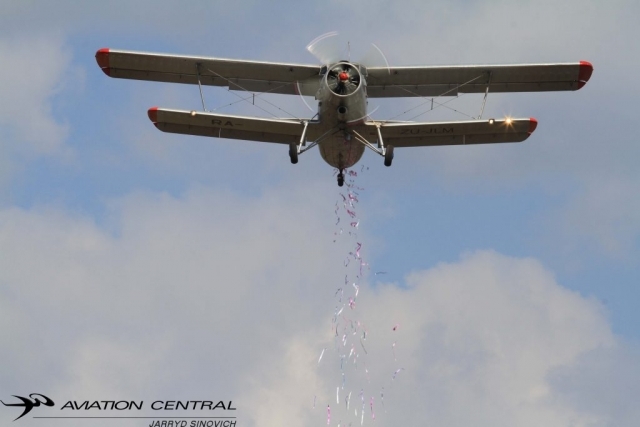 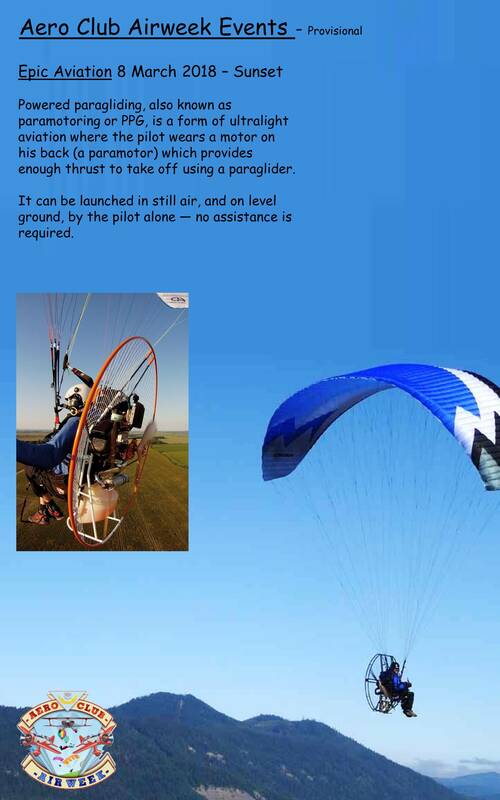 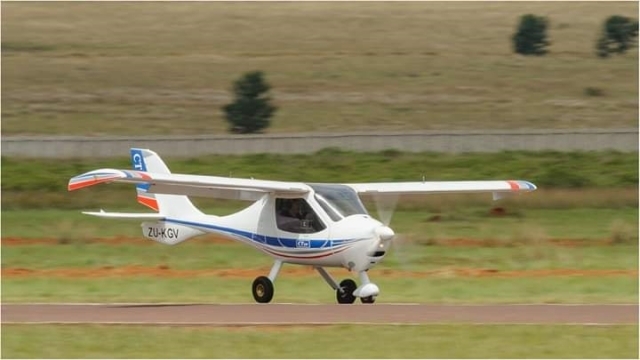 The first of the processdings began with an Atlas Angel formally an Ex South Africa Airforce (SAAF) Kudu, used as a jump ship for the “Skydive Tandem Johannesburg” Delmas based parachute members and other members from neighboring parachute clubs. 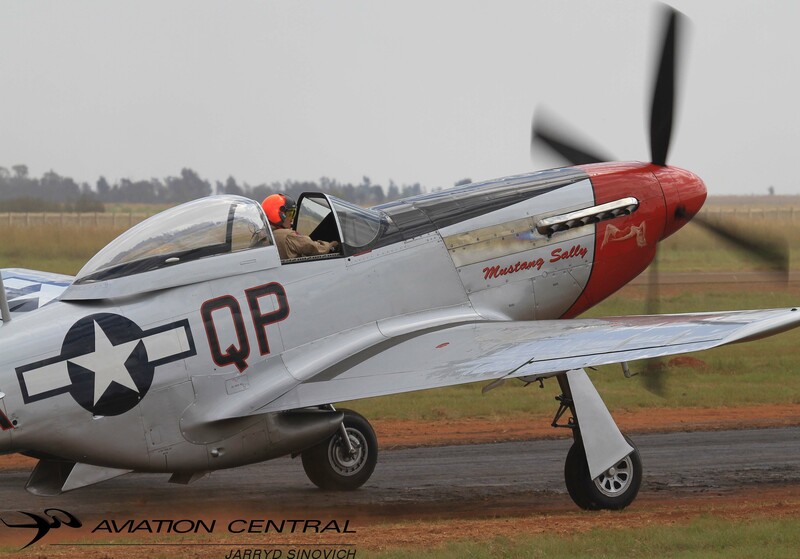 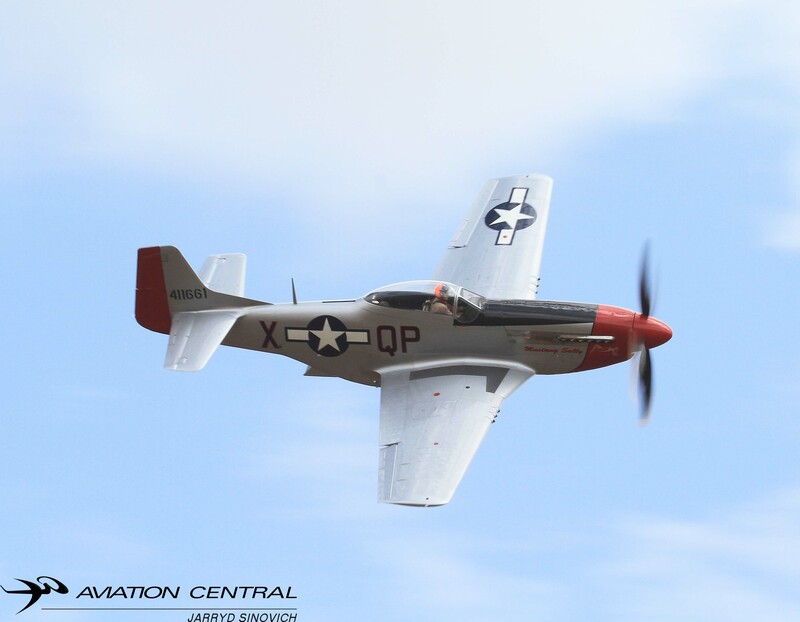 Menno Parsons made a welcome back display in his P51 Mustang Sally, as the P51 had to have a major engine overhaul and was absent from airshows for a year. It was also a first to have a P51D at Middelburg Airshow. 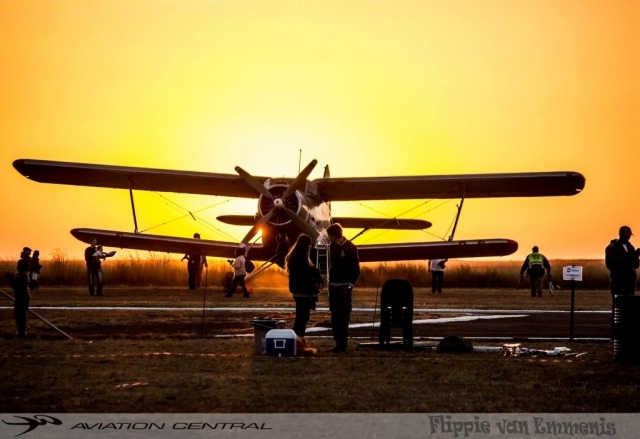 The Just Love Mission Antonov 2 “Little Annie” with Jon-Marc Hill and Col Keith “Fulcrum” Fryer flew a fantastic display in the world’s biggest piston bi-plane. “Little Annie also raced a truck and decided to drop a number of marshmallows over the crowds of Middelburg. 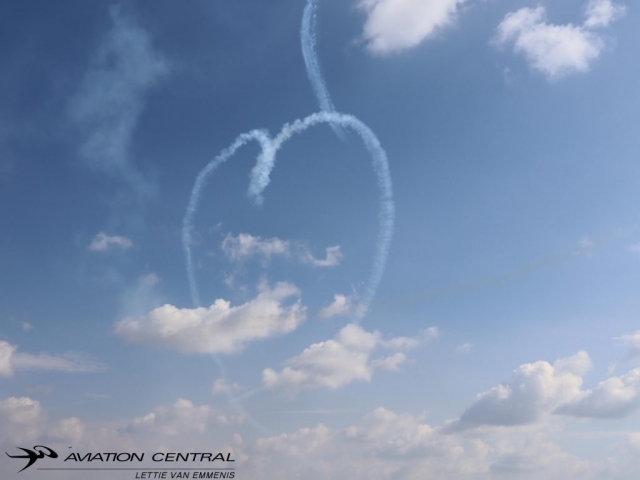 They’re surely know how to sweeten things up! The Puma Flying Lions led by Scully Levin, Arnie Menageli and Sean Thakwray flew a three-ship display with the roar of the T6 Harvard. 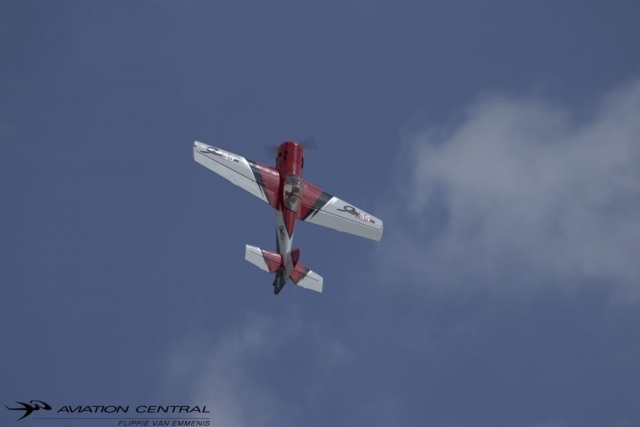 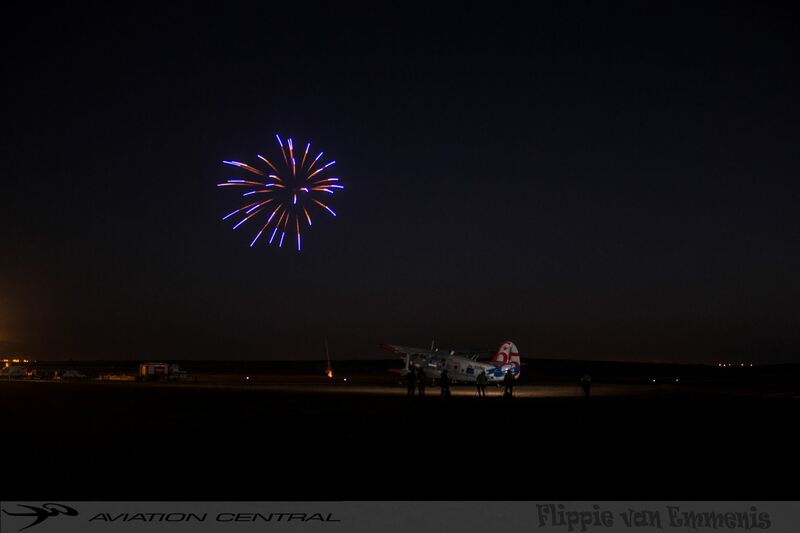 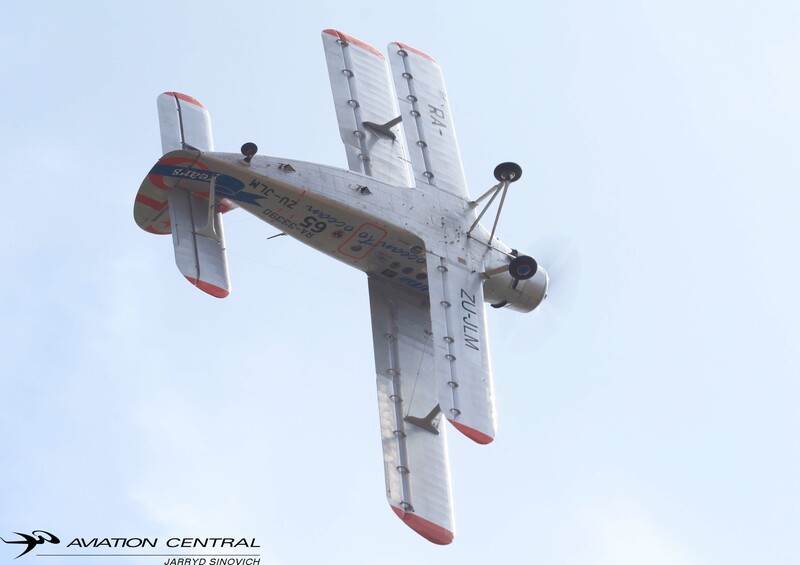 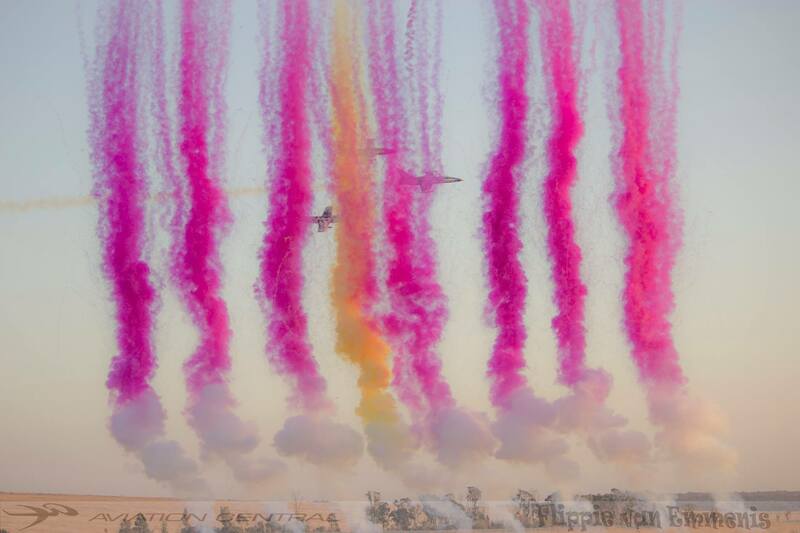 The Cows Pitts Specials had a synchro display with two aircraft displaying the colors of a good cause to the masses. 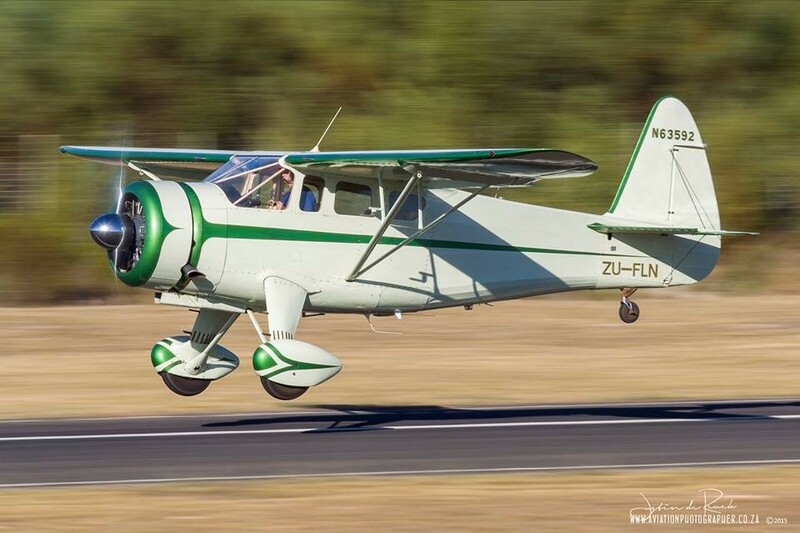 Captain Flippie Vermulen brought his Springbok Classic Air Beech 18, and showed off the classic early day propliner. 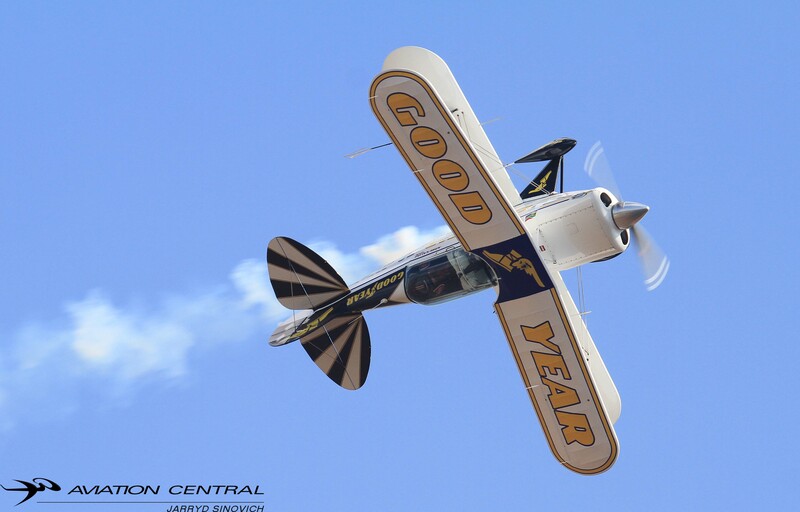 Dennis Spence had his team of the Goodyear Eagles with a full four ship display of all his Pitts S2Bs flown by Glen “Gringo” Warden, Nigel Hopkins, Johan Von Solms and Jason Beamish. Nigel and Jason also flew the high energy aerobatic display of Team Extreme with Jason Beamish showing off his brand new Extra 330 at its first of many airshows to come. Pierre Gouws led the Raptor RVs with Nigel Hopkins, Trevor Warner and Ryan Beaton. 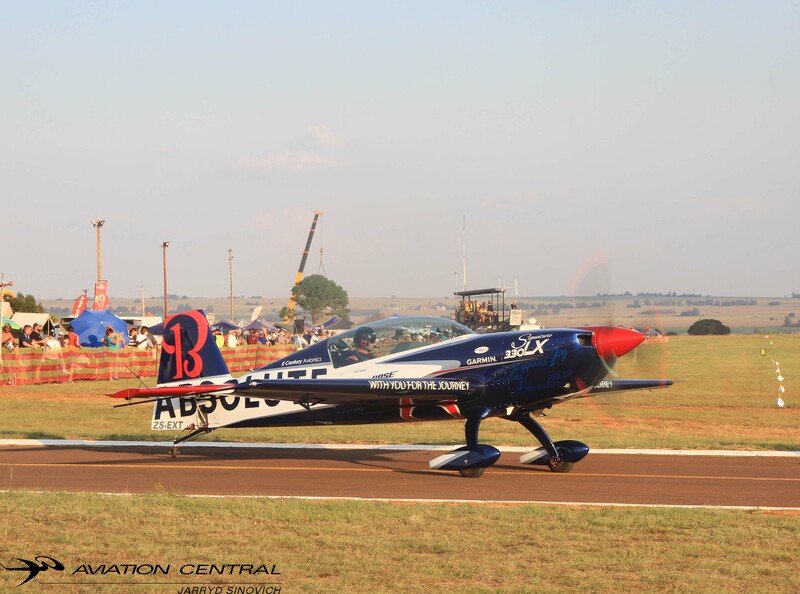 The main attraction of airshows has to always be the jets, this year we got to see Richard Lovetts L39ZU-IBN, David Laas Impala Mk1 ZU-IMP and Rand Airport based L29 ZU-AUX. 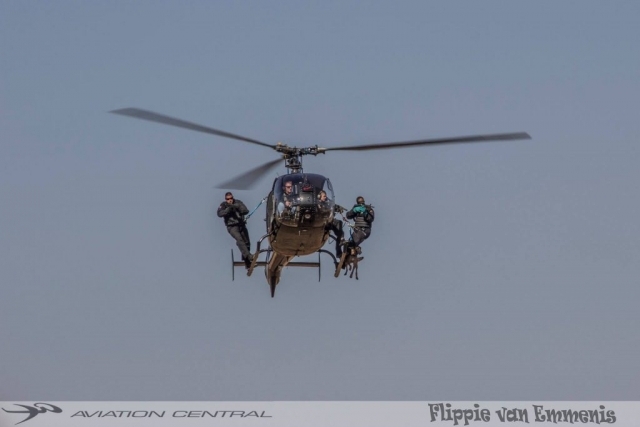 A new display was the hostage scenario where an Atlas Angel was taken hostage from terrorists and an Aerospatiale Gazelle came to the rescue with members of armed reaction forces. 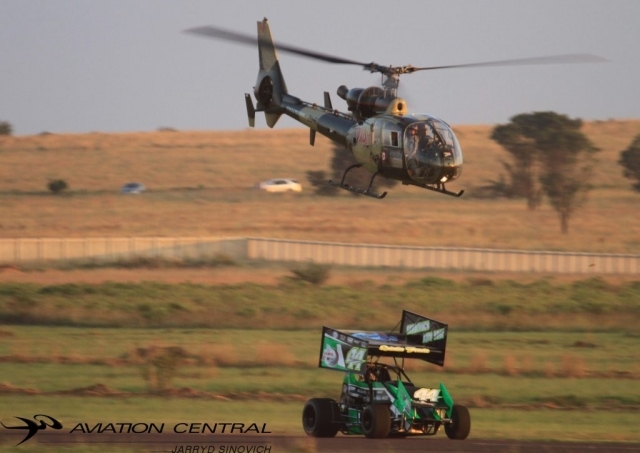 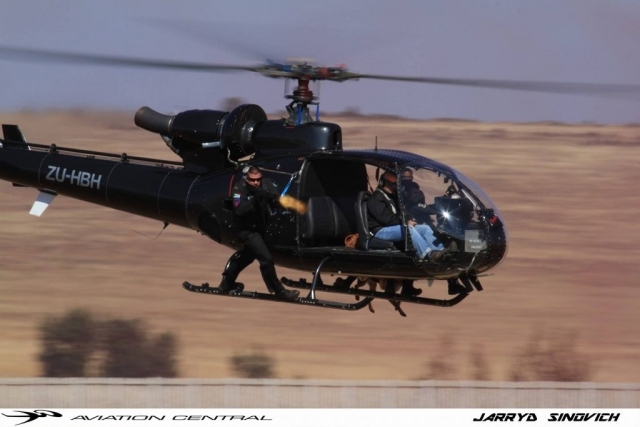 Juba Joubert also flew a solo display in an Aerospatiale Gazelle, his routine is very similar to some of the world’s present attack helicopter routines worldwide. 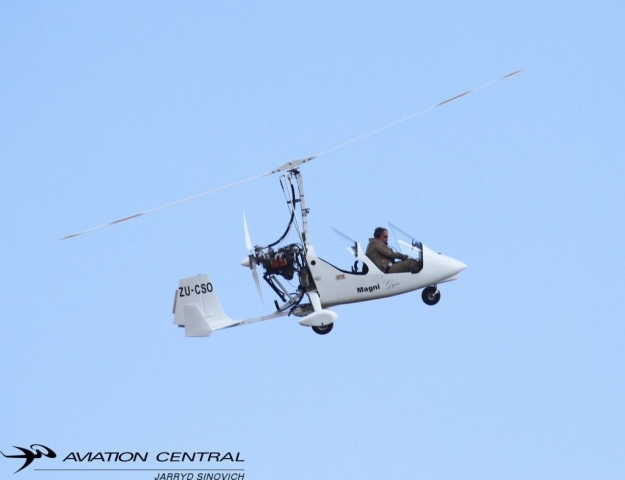 A gyrocopter and 2 Bathawks were put through their paces adding flavor to the ultralight aircraft on display. 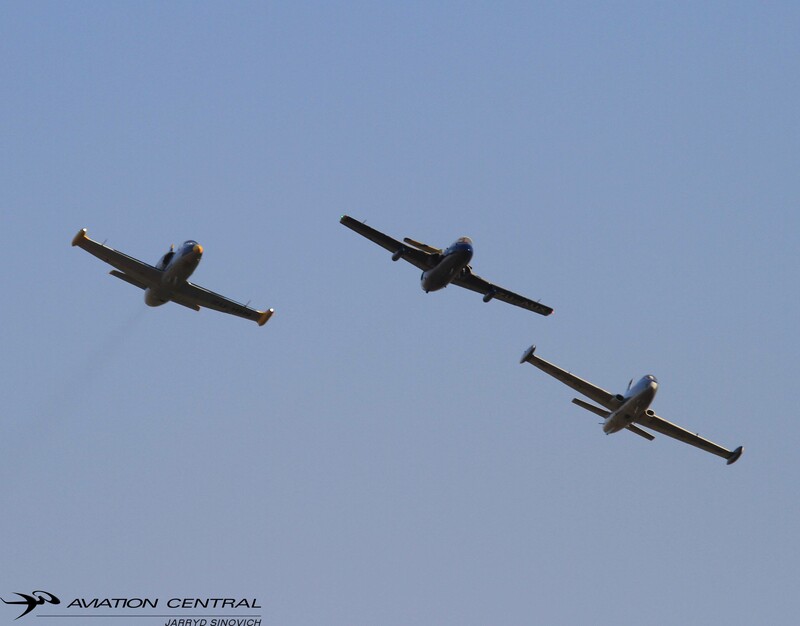 The flying phase of the show was ended by a formation of the Puma Flying Lions led by the Springbok Classic Air Beech 18. 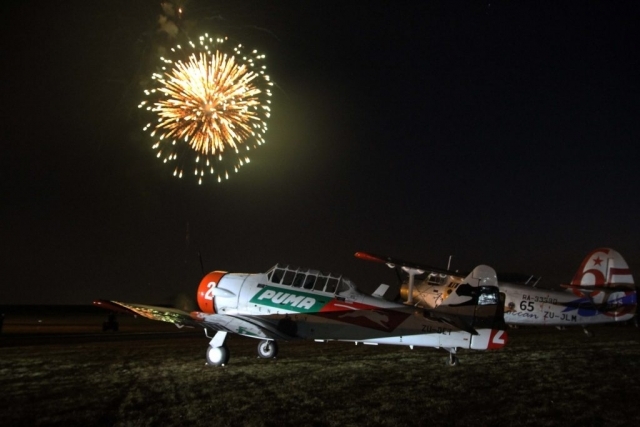 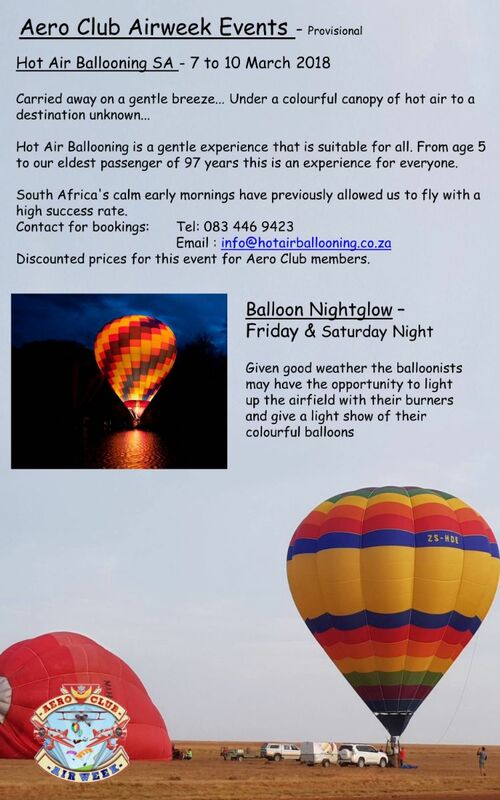 A hot air balloon and fireworks ended the show, where all invited guests moved into the Lovetts Hanger for Gala evening and Price giving for the Speed Rally. 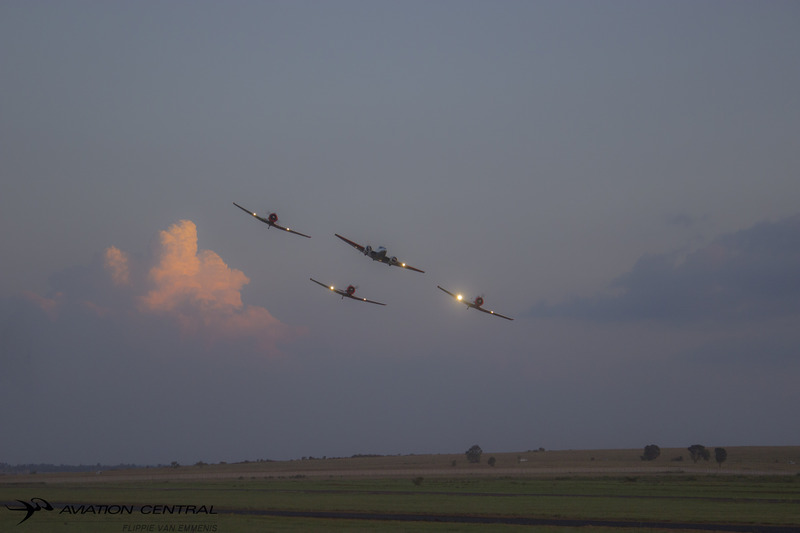 The most scrumptious supper was awarded to us and many others. 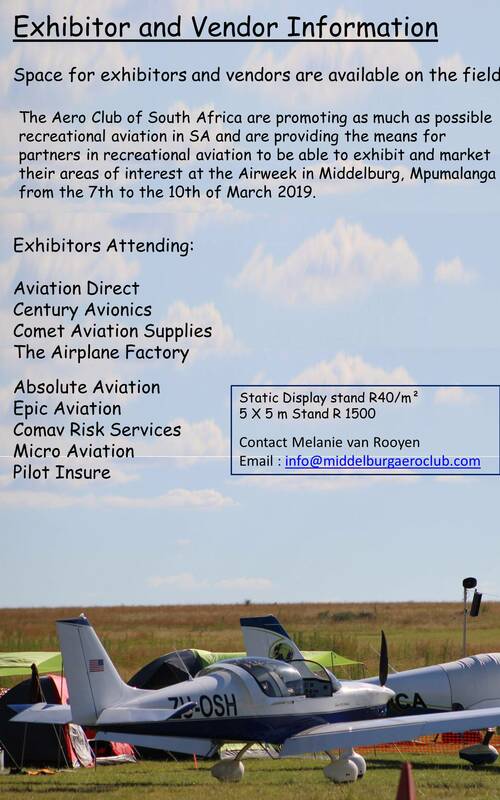 To all the sponsors, who made the show possible we thank you. 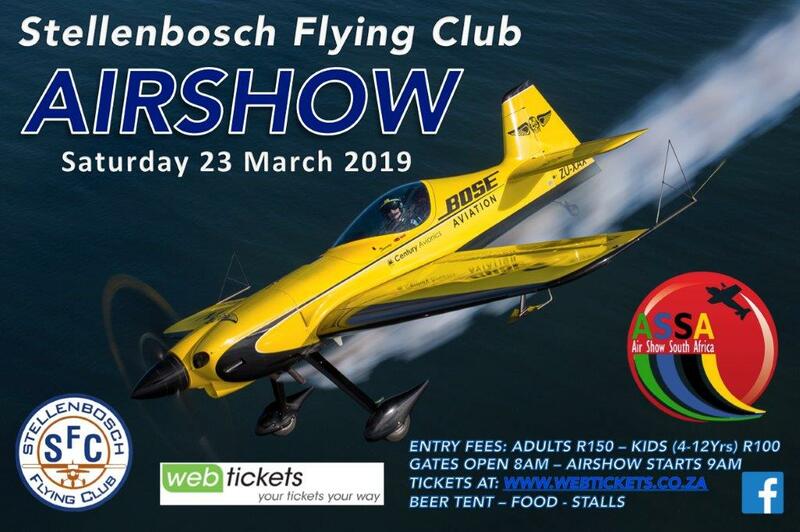 But to the Middelburg Aero Club and to Irene and Richard Lovett we congratulate you on a fantastic event you have once again pulled off. 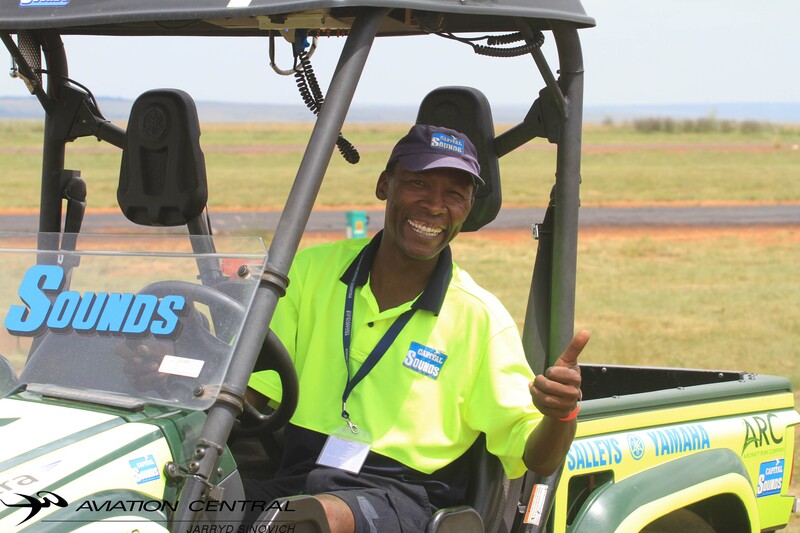 Us as a team get highly emotional as your hospitality, your organization and there is so much more we can say. 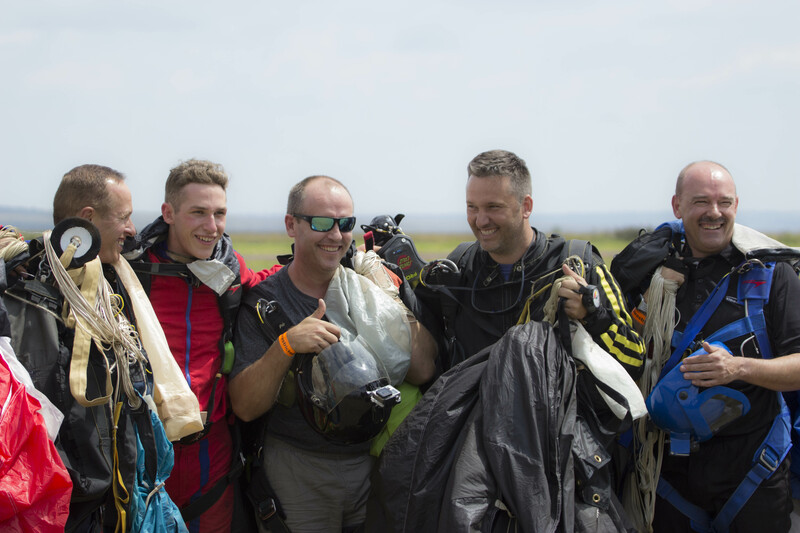 You guys are the best of the best. 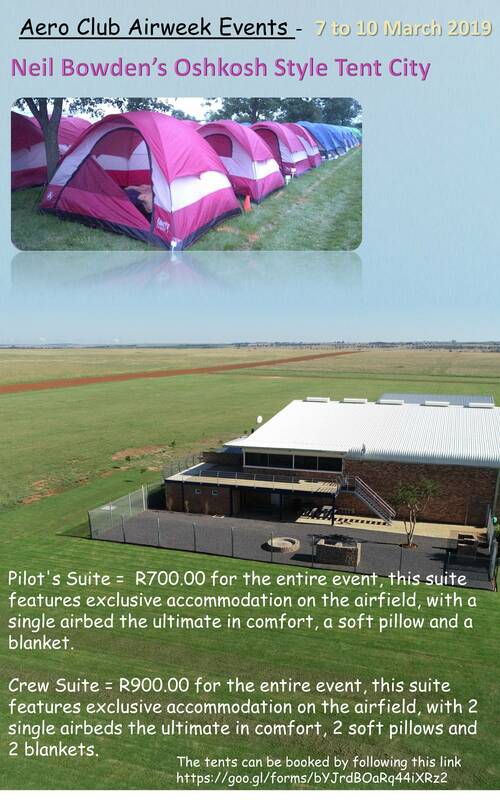 We thank you, we cannot wait for Aero Club 100 next year once again to be held at Middelburg Airfield. 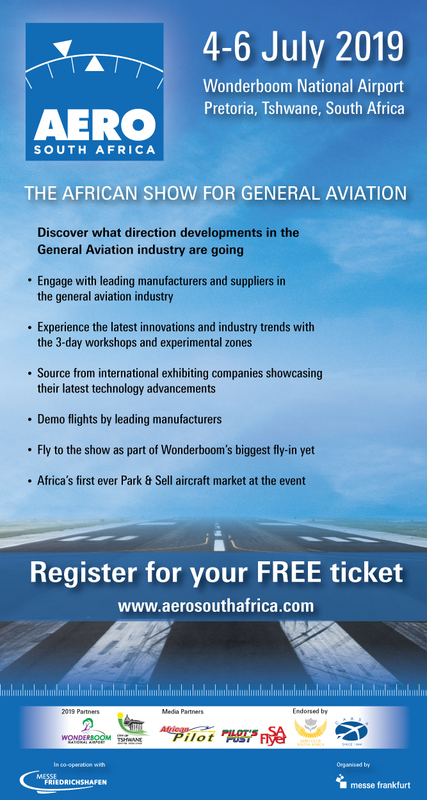 At what we have been told, it’s going to be massive. 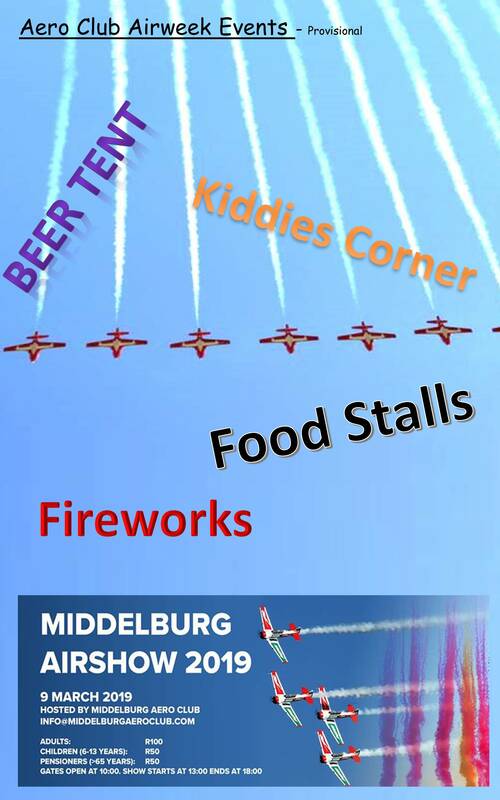 Within days of the announcement, the first 28 places were snapped up by competitors having taken part in the previous events, not leaving any room for new entrants, and it was decided to extend the field from the original maximum of 30 to 35, with an opportunity for the local Middelburg club members to take part. 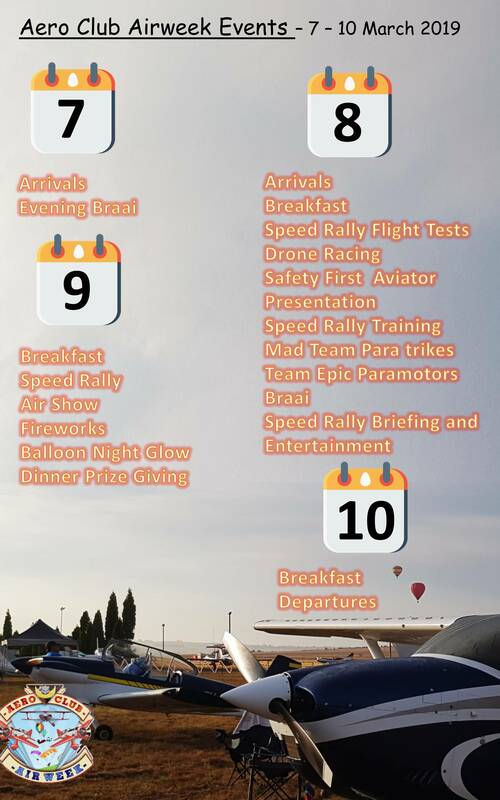 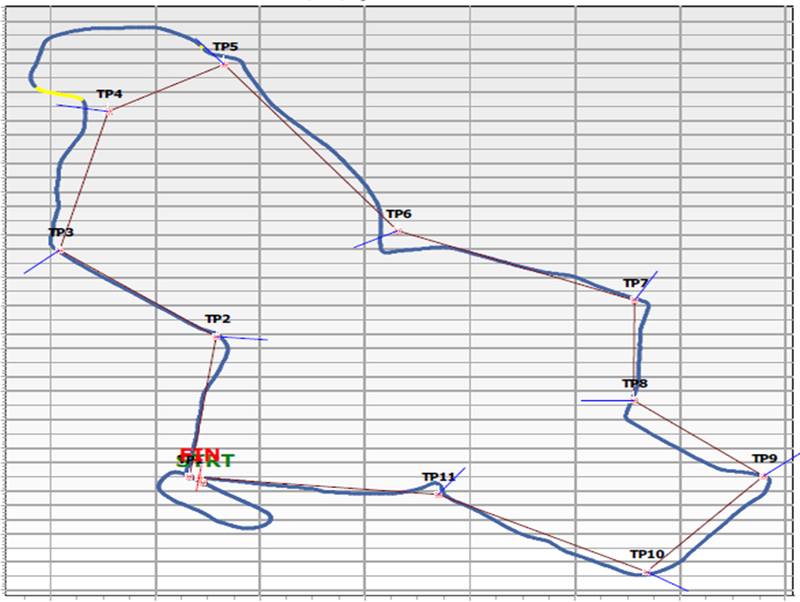 This event is one that is flown at full speed under handicap conditions, the course is around 120 nm long, has 11 or so turning points, with each turning point identified with a correct photograph. 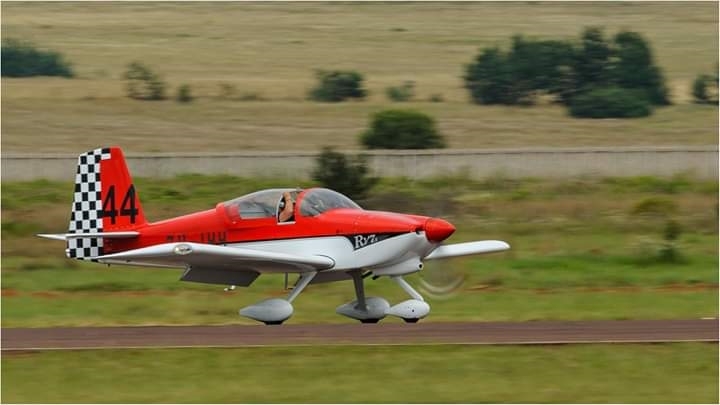 Friday saw a fairly full day of test flights with some repeat test flights to reconfirm handicaps, with conditions mostly favourable although the cloud base was low in the morning. 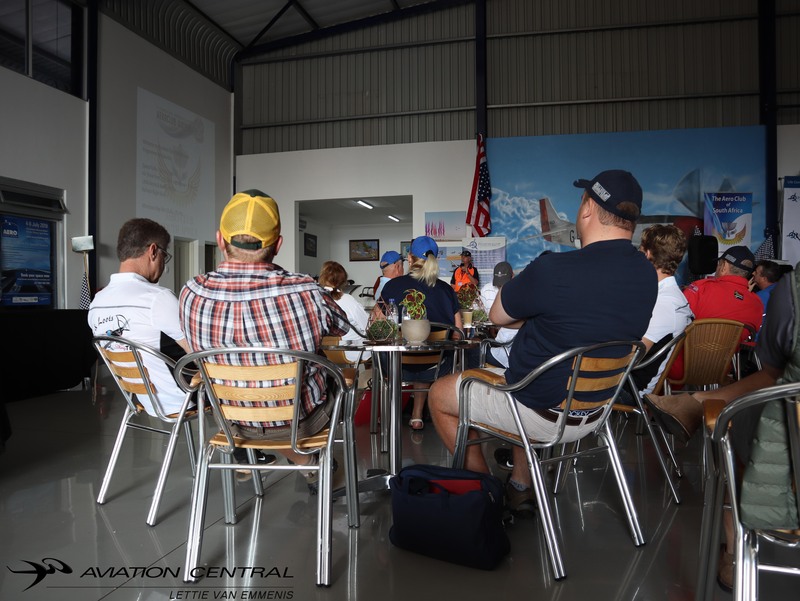 After the Safety Aviator Presentations which started just after 2 pm, Mary de Klerk had arranged to hold a training session on how to fly a Speed Rally, which was very well attended, and included a practical map preparation session on an example map, sharing the tips and tricks of how to follow the map features and timing points. 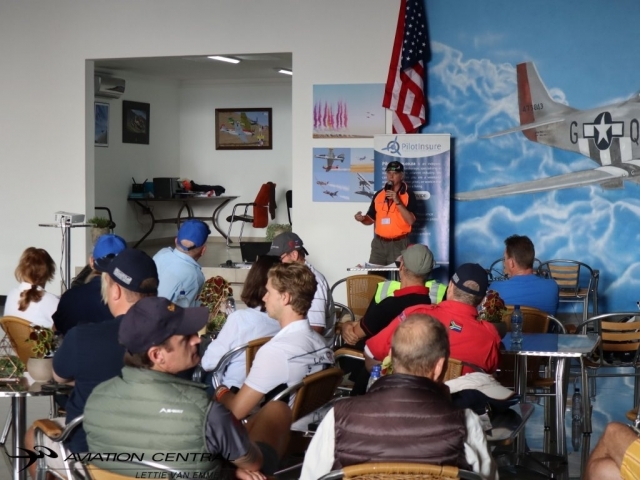 Thereafter at 6h30, Jonty Esser as the Race Master introduced Rob Jonkers who took to the stage and provided a briefing on what to expect for the next day in terms of the planned route, how many turnpoints, distance, departure and arrivals protocol, and also how the scoring system would world work with expected weather conditions, which looked as if it would be good. 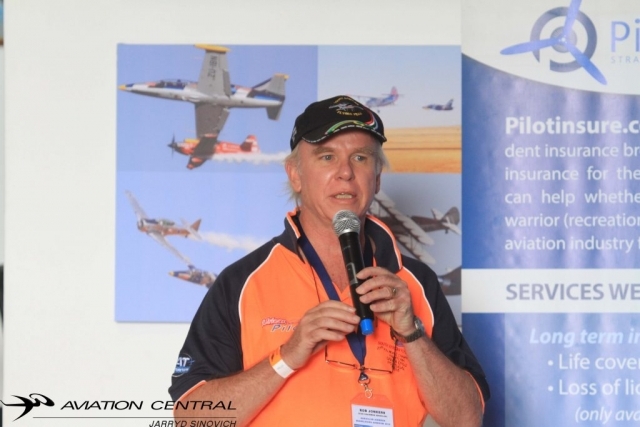 Then all the competitors were treated to a briefing on Steroids on Friday night with the Speed Rally Race Master Jonty Esser having set up a show for the teams, with a real life lights, camera, action sequence, where each team were introduced with their team theme song, handed their race numbers. 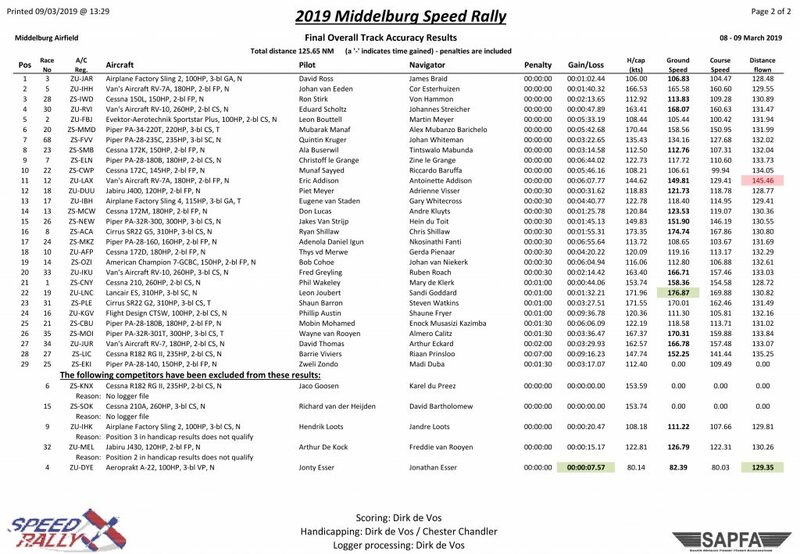 Jonty also introduced the teams to the Speed Rally website where a Speed Rally ranking system was created, with team profiles and their leaderboard position. The evening ended with a braai hosted by the Middelburg Aero Club, before retiring for the night, some were camping under the wing or in Neil Bowden’s tent area. 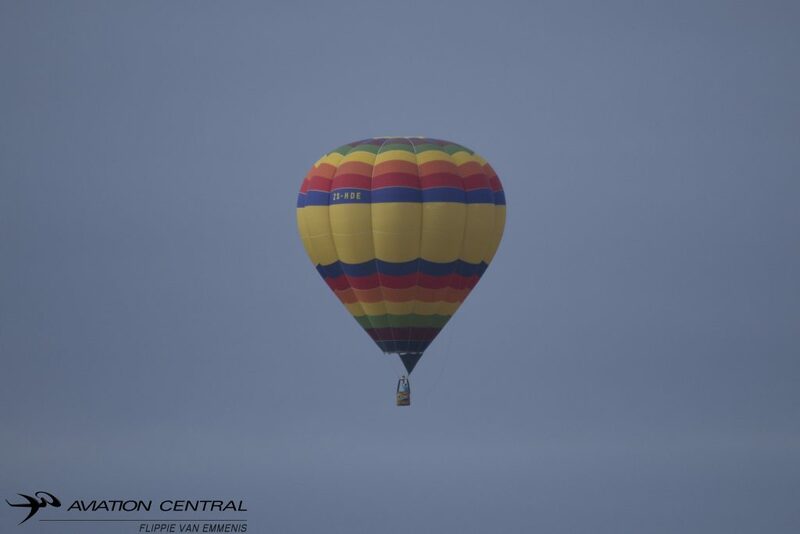 Saturday morning saw low cloud and some fog, although it started to lift and clear fairly soon, giving a go ahead to start the rally. 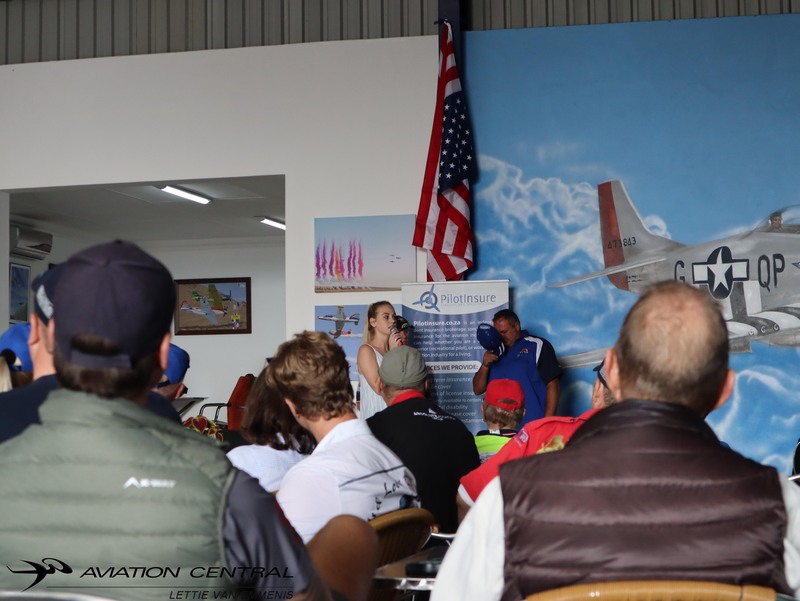 The briefing started at 8h30, which was a shortened version just to cover the basics of the route, radio procedures and weather. With the briefing over, teams prepared their aircraft, with marshals assisting in parking sequence, while the organisers got the papers ready. 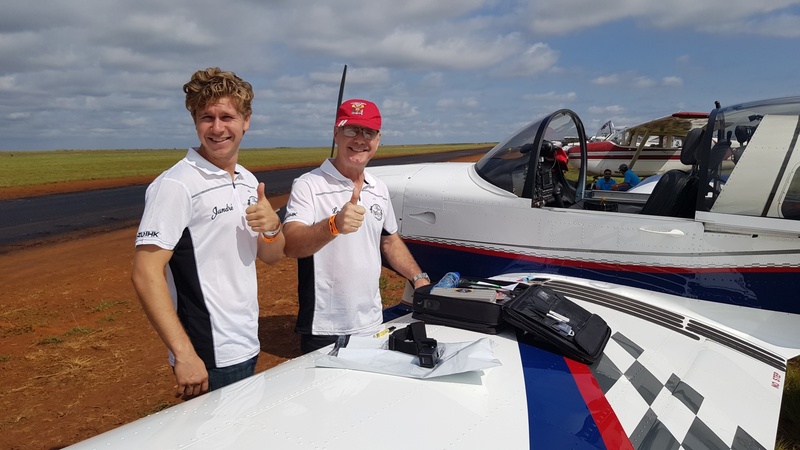 Each team would then receive an envelope with a map, turnpoint photos, a minute marker and a GPS logger to record their track. 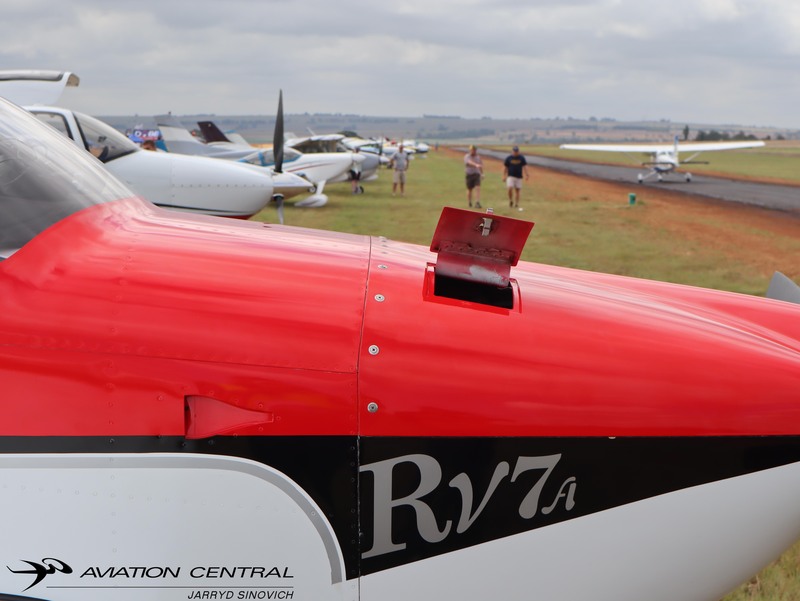 Aircraft were then also scrutineered with all portable electronic devices sealed up in bags, and although no onboard systems were disabled, it relied on an honour code to not utilise onboard GPS as a Navigation aid, however the course is designed as such that GPS would be of minimal benefit. 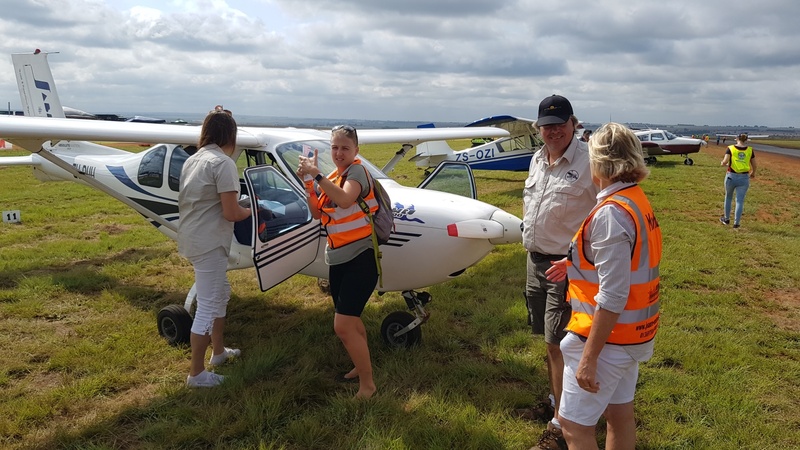 Scrutineers Chareen, Lizelle, Charlene, Jean, Conrad, Frans and David were on hand to seal up all portable GPS capable devices, and also handing out papers at the allotted time, and also checking the fuel tanks were full. 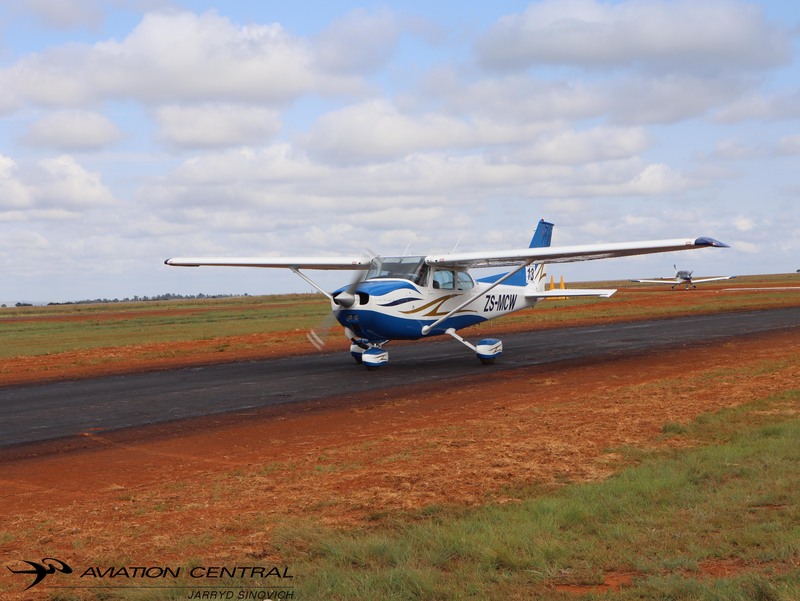 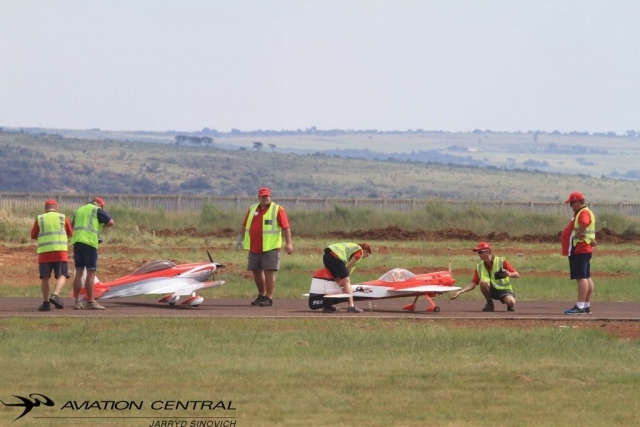 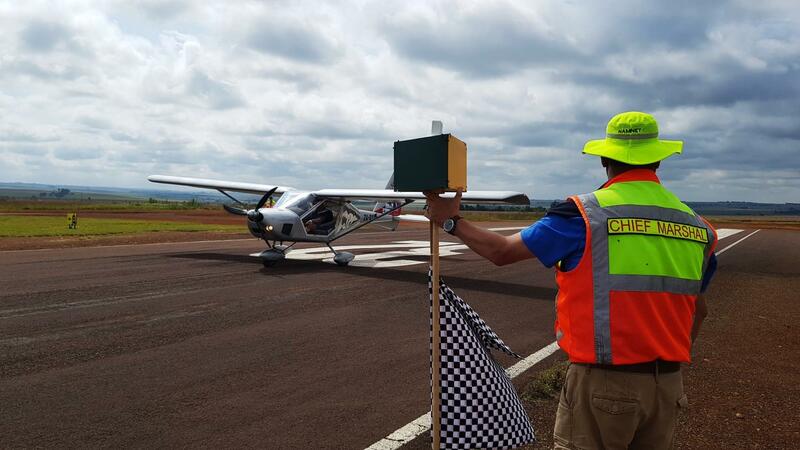 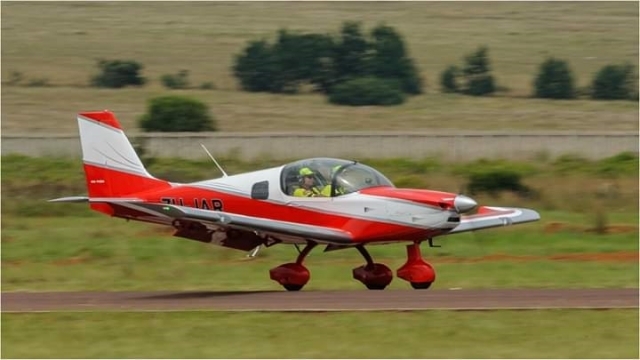 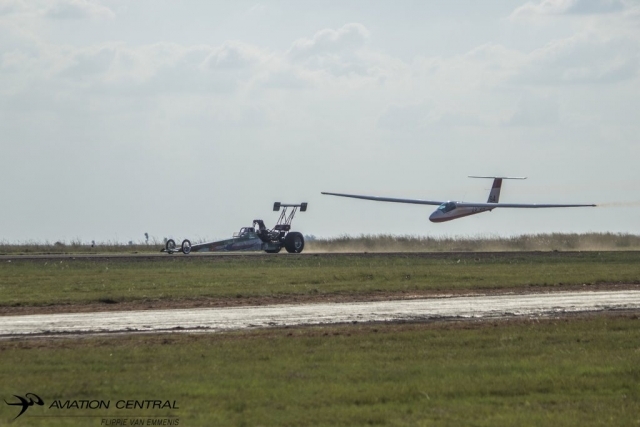 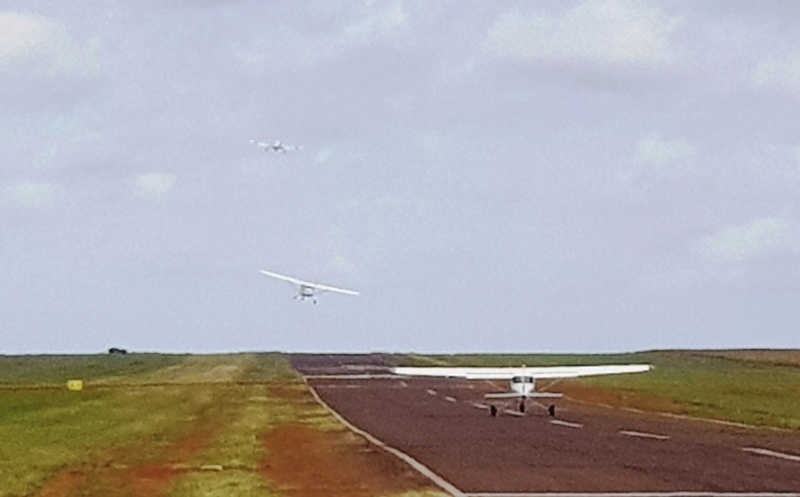 To assist the teams at getting their take-off roll accurate, a starting colour panel was used, which was set up next to the start line on the runway by Chief Marshal Hans Potgieter and Mark Clulow, which would release them at their allotted time slot. 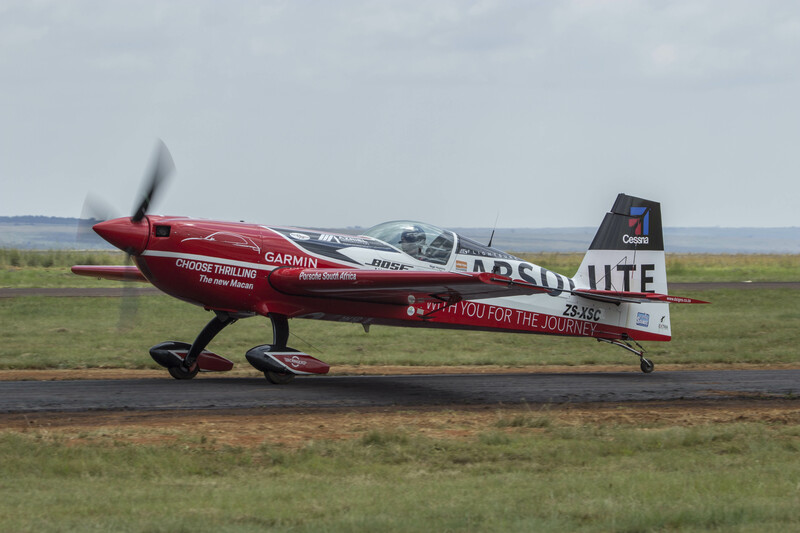 Each team then received their envelopes with their loggers at their 20 minutes prior take-off time, and then taxi to the starting line within 10 minutes of take-off time. 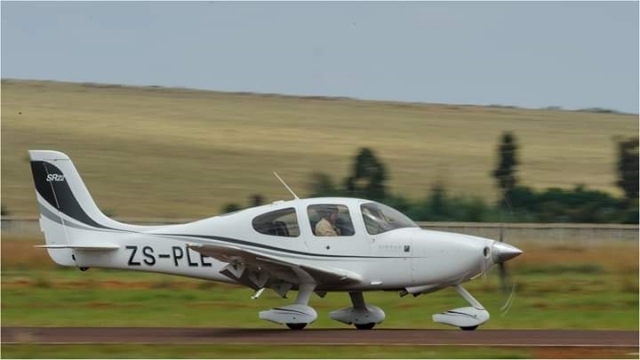 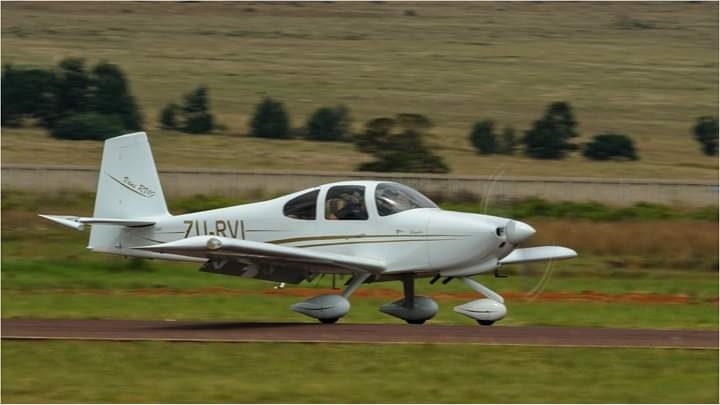 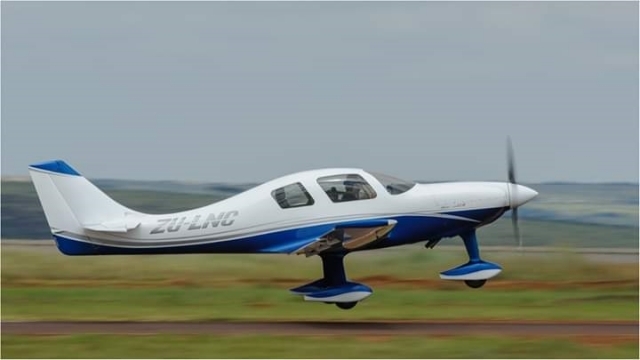 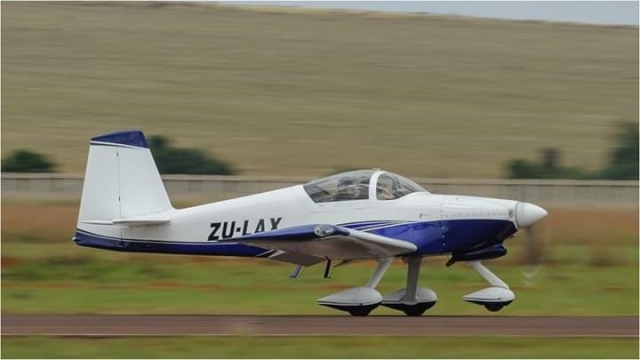 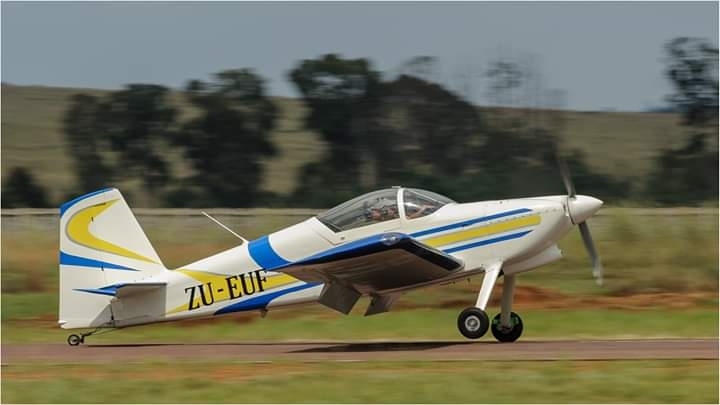 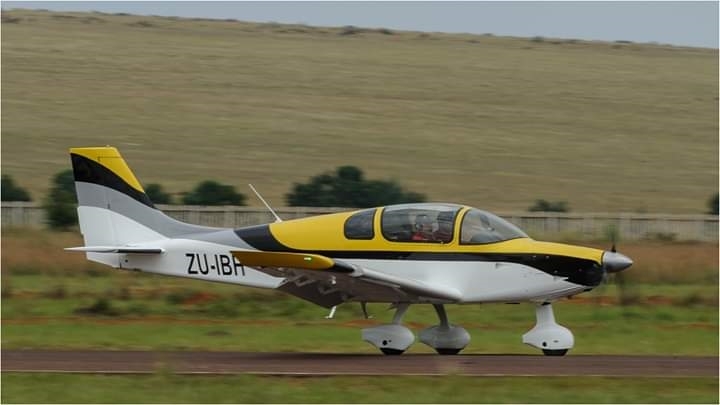 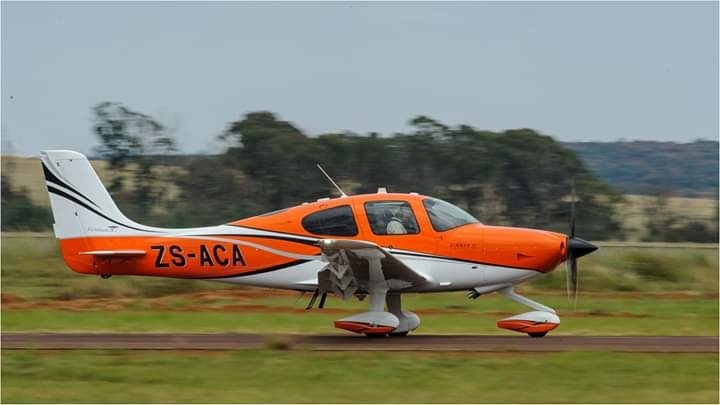 1st take-off was at 09h55 for the slowest aircraft and last take-off at 10h50, with planned arrival at 11h30, the fast Cirrus ZS-ACA only needing 40 minutes to complete the course. 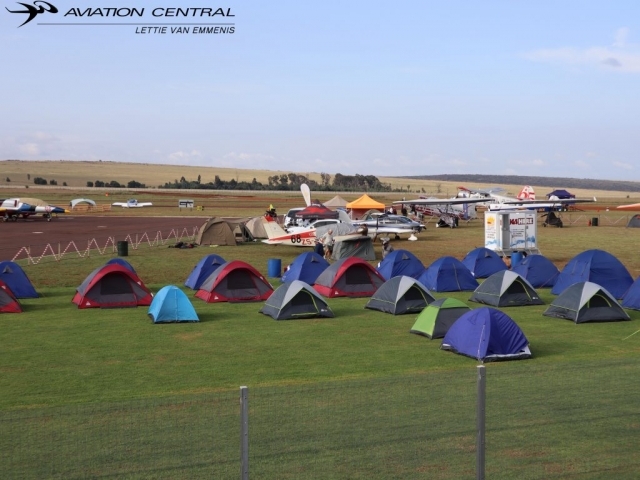 With all the competitors off towards the north, the route had a mix of easy and challenging turnpoints to contend with to give competitors a chance to always be aware of where they were, but some turnpoints were a challenge find, especially if the colour of the surrounding ground features had changes since the photos were taken. 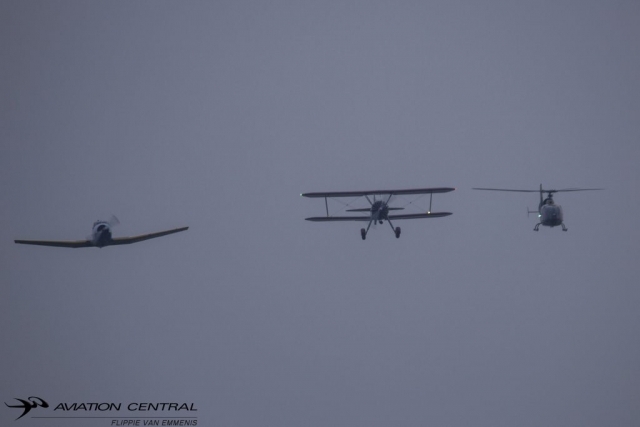 Although Turnpoint 2 was essentially along the road going past the airfield, it was still difficult to find apparently given how many were searching for it. 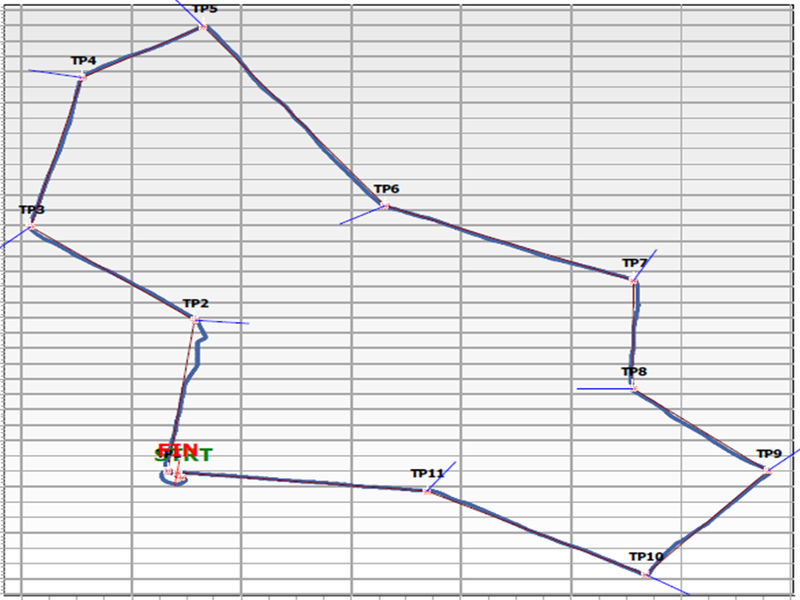 Quite a few competitors cut the corners on turnpoints including Phil & Mary who during her training session warned everybody to “go round the TP”. After all teams having returned and safe on the ground, the scoring team got to work to analyse the results, and with the new loggers were able to complete the scores by 1 pm, and everybody were given their score sheets. 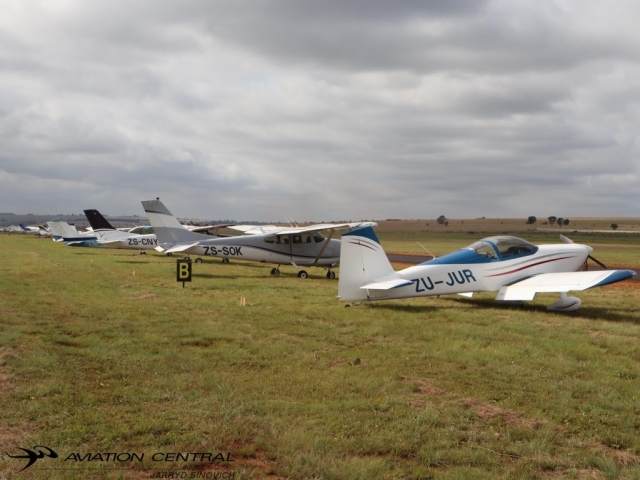 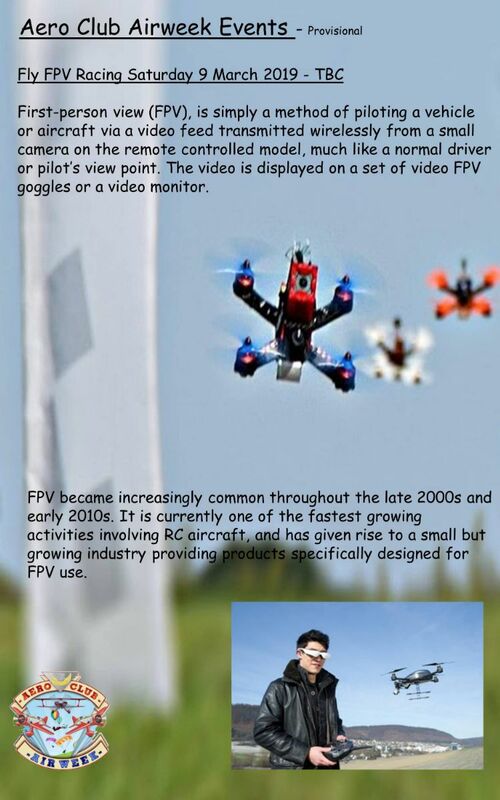 Prize giving would only be in the evening so the teams and officials could enjoy the Airshow for the afternoon. 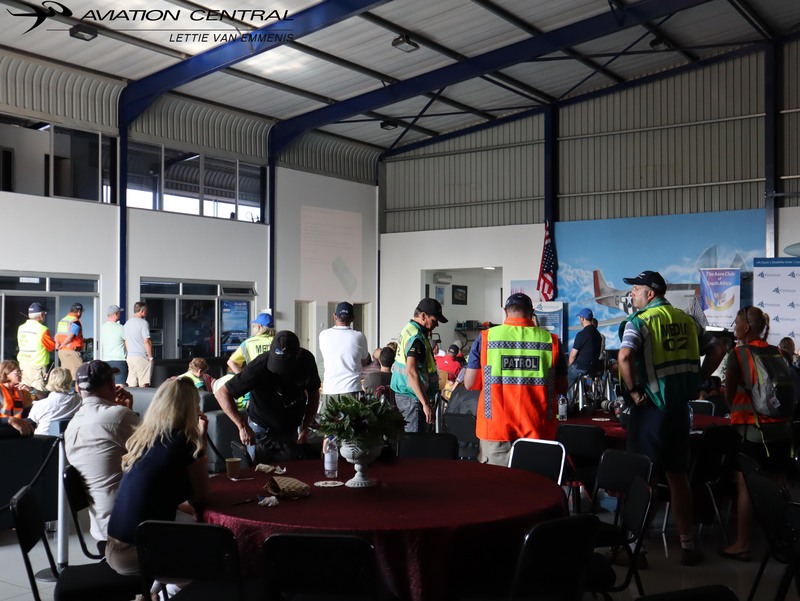 With everybody settling in for the VIP dinner hosted by the Middelburg Aero Club, and opening speeches and starters enjoyed by the guests, the prize giving was coordinated by Jonty Esser acting as the MC for this time slot, with firstly aircraft judging certificates handed out by EAA’s Sean Cronin, and thereafter a showing of a number of interesting flight tracks given by Rob Jonkers, which for this rally turned out overall to be very good, with only one competitor having had some navigation trouble, and for sure the overall standard is improving, with all aircraft over the line within 7 minutes. 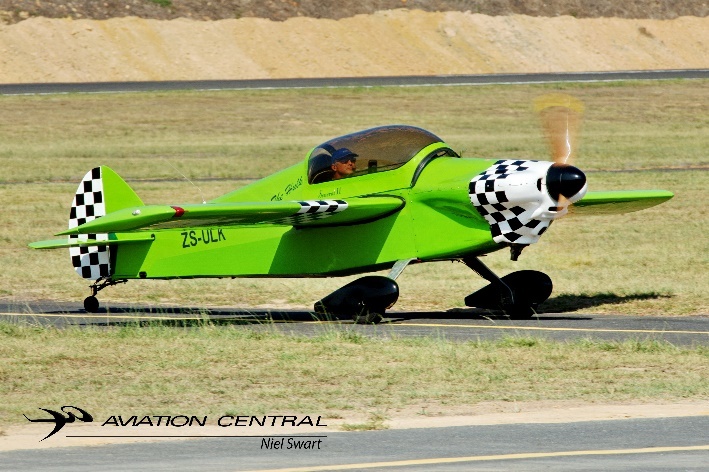 As the teams were visible approaching the field, first in view was Jonty Esser in the slowest aircraft a Foxbat being chased down by Phil Wakeley in a C210, who crossed the line within 8 seconds of each other. Some other interesting facts were that the full field also completed the course with an average of 7 nm overflown and the best performance against handicap time was 25 seconds. 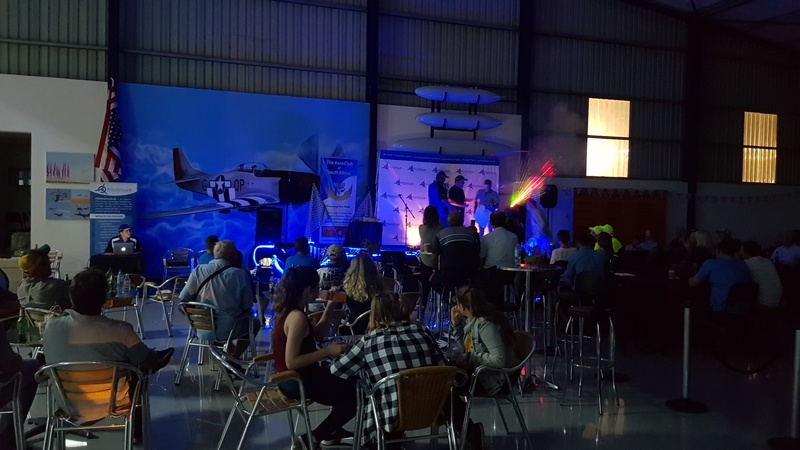 After this the Speed Rally promo video was shown, and then the prize giving, which was hosted by Frans Smit from Pilot Insure who was this Speed Rally’s main sponsor. 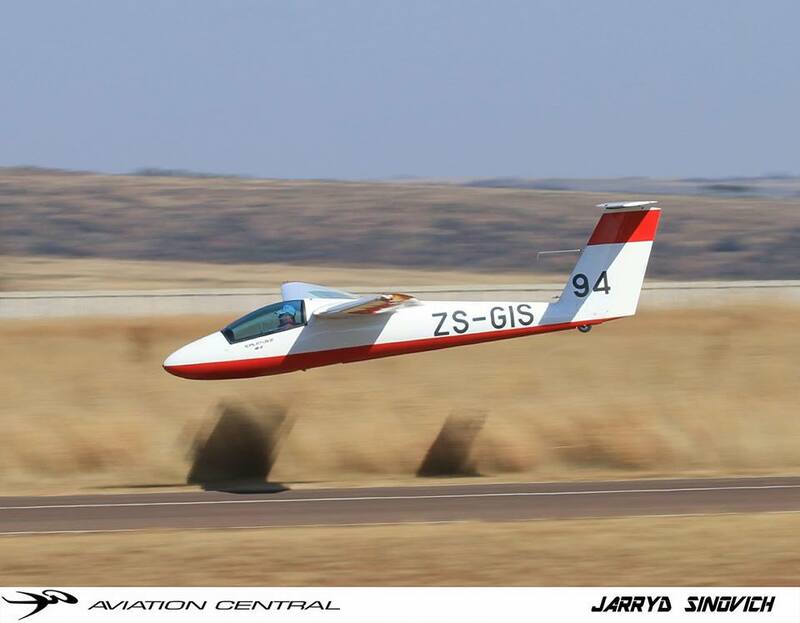 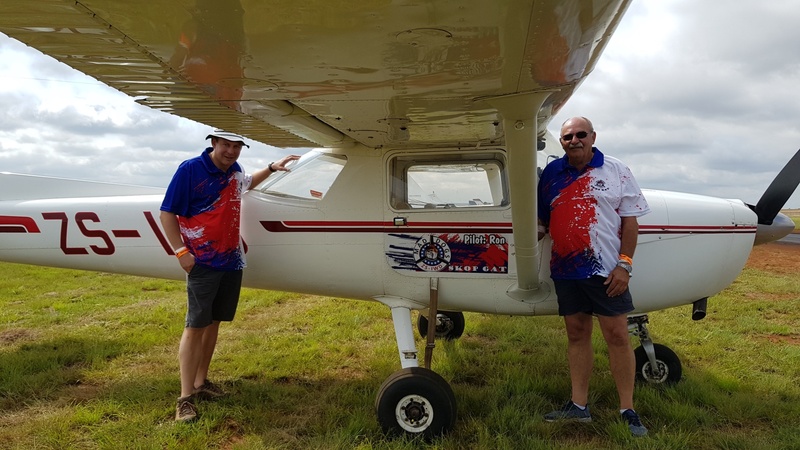 First a Hard Luck certificate was handed out to Jaco Goosen whose C182 fell into a subterranean aardvark tunnel and damaged the horizontal stabilizer, then Jonty handed over the Club Trophy to Richardt Lovett and the Middelburg team. 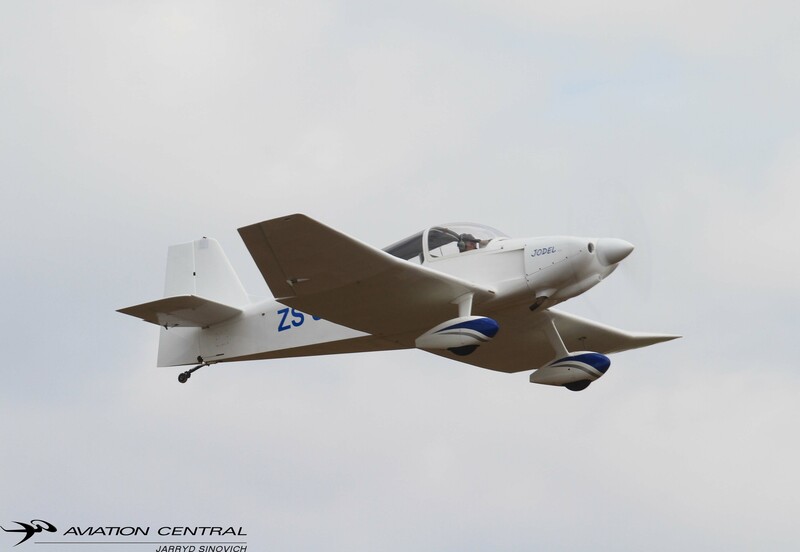 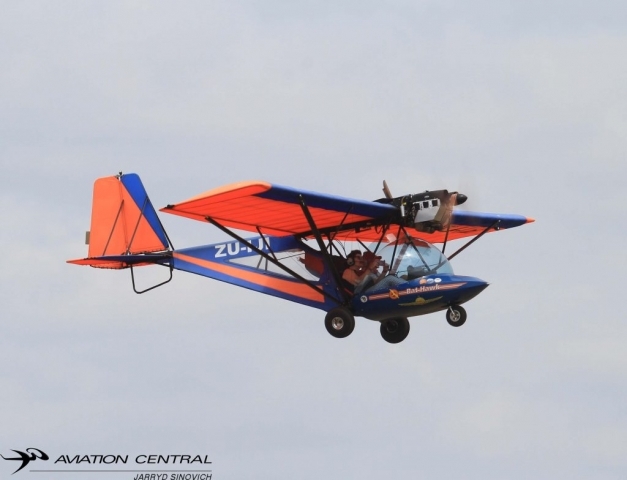 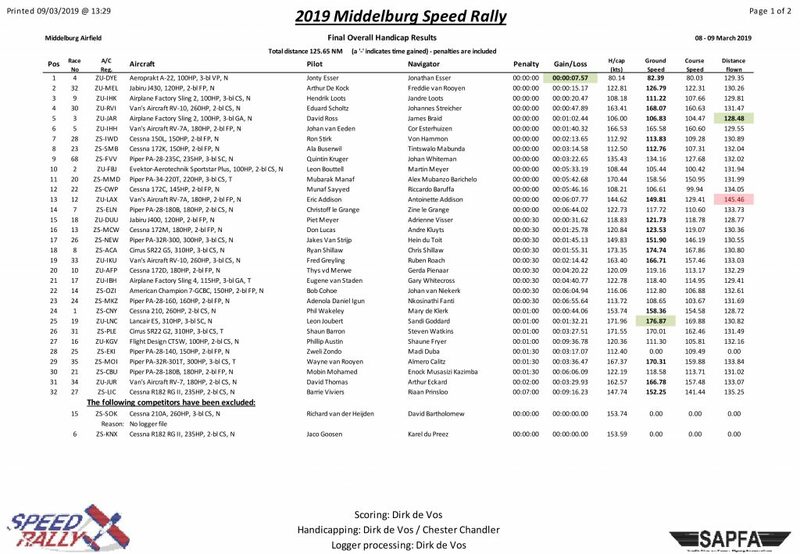 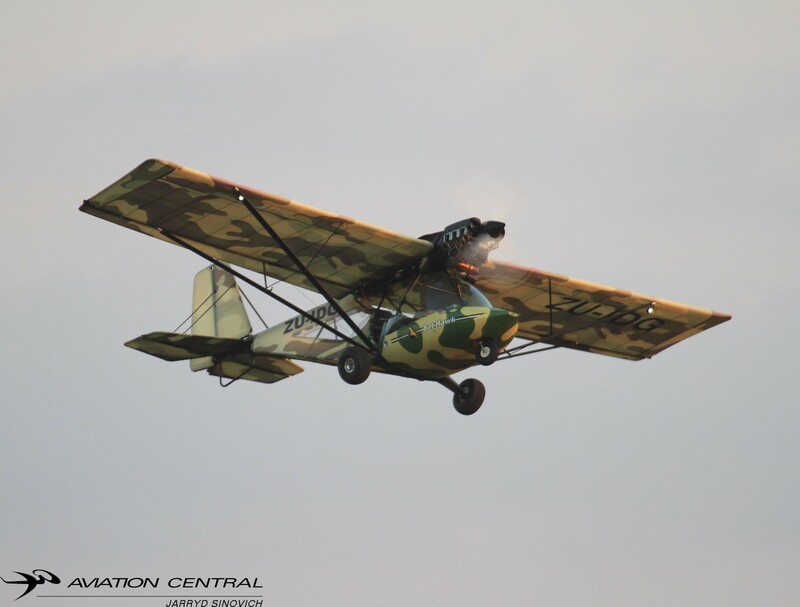 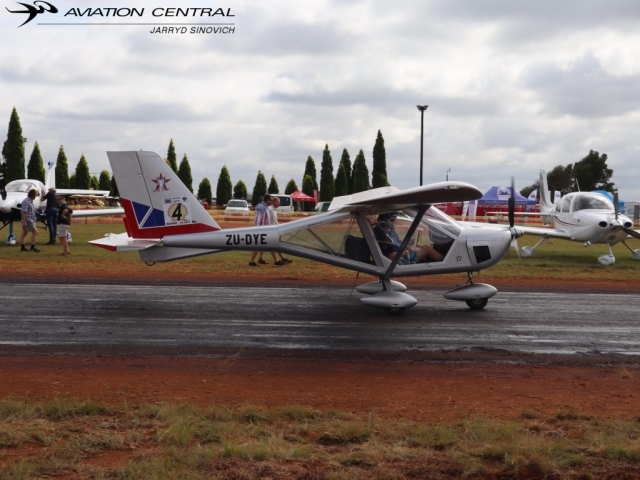 The overall winners in the best handicap speed were the team of Jonty Esser and Jonathan Esser in a Foxbat ZU-DYE, in second place was Arthur de Kock and Freddie van Rooyen in their Jabiru J430 ZU-MEL, and in third place Hendrik Loots and Jandre Loots in their Sling 2 ZU-IHK. 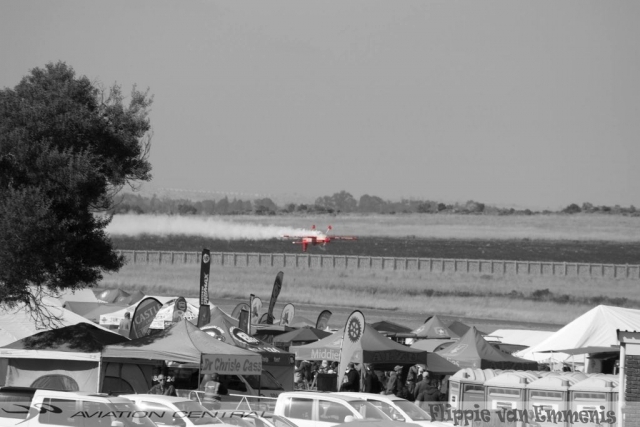 The first fourteen placings were the only crews who managed a clean penalty free round. 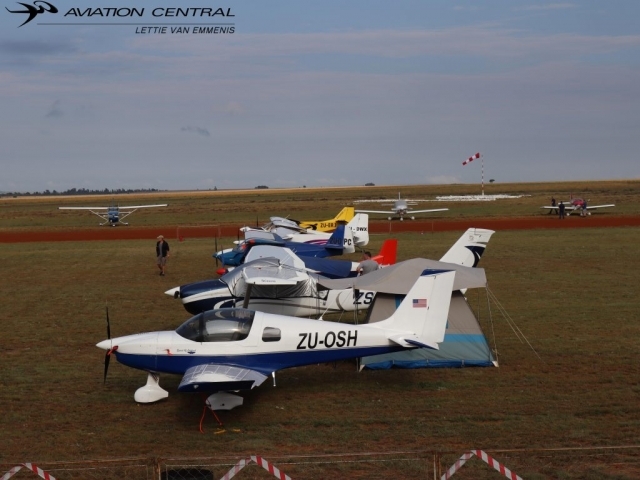 The winners in the accuracy category were the team of David Ross and James Braid in their Sling 2 ZU-JAR, in second place was Johan van Eeden and Cor Esterhuizen in their RV7 ZU-IHH, and in third place the skopgat team of Ron Stirk and Von Hamman in their C150 ZS-IWD. 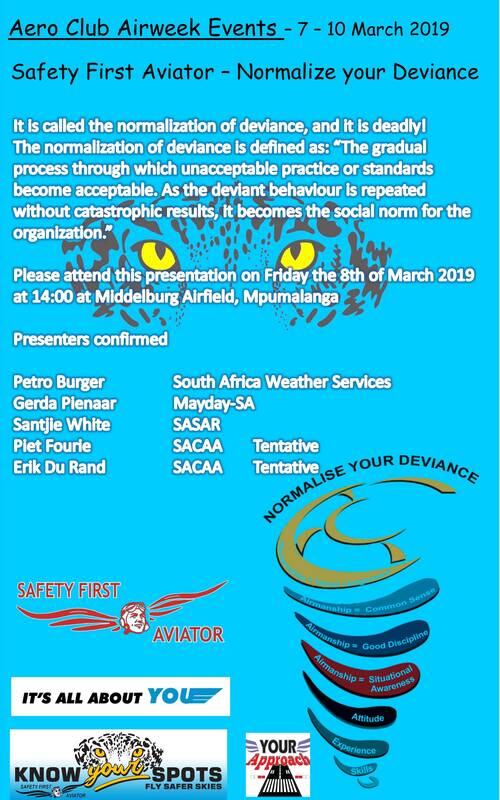 Many thanks to the Middelburg Aero Club for hosting this fantastic event, the SAPFA team of Hans Potgieter with the ground marshals, Nigel Musgrave as the Safety Officer, Dirk and Louna de Vos and Mark Clulow doing the scoring with our handicapping guru Chester Chandler, Chareen Shillaw, Lizelle Kruger handing out competition papers to the crews, Jonty & Lizelle for putting together an awesome Friday evening launch event. Also thanks to Mary de Klerk for the time made available to do the training course held on Friday, it for sure helped the teams to gain an understanding of what to expect. Also to the sponsors Pilot Insure, who was the main sponsor of the event, Flightline Weekly for sponsoring the race numbers, also to Pilot’s Post for sponsoring the team of Phil Wakeley and Mary de Klerk, and provided three key reasons for this, the first one being that the Speed Rally as a brand is seen as the future of competitive flying, second being that the Speed Rally brand will add value to our brand, third being that they believe that Phil and Mary are the perfect ambassadors for Pilot’s Post and they will carry our flag high. All day commentary by the legendary air show commentator Brian Emmenis and his expert CAPITAL SOUNDS team. 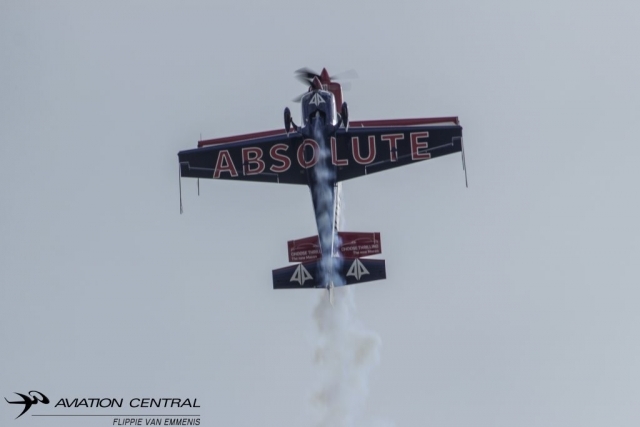 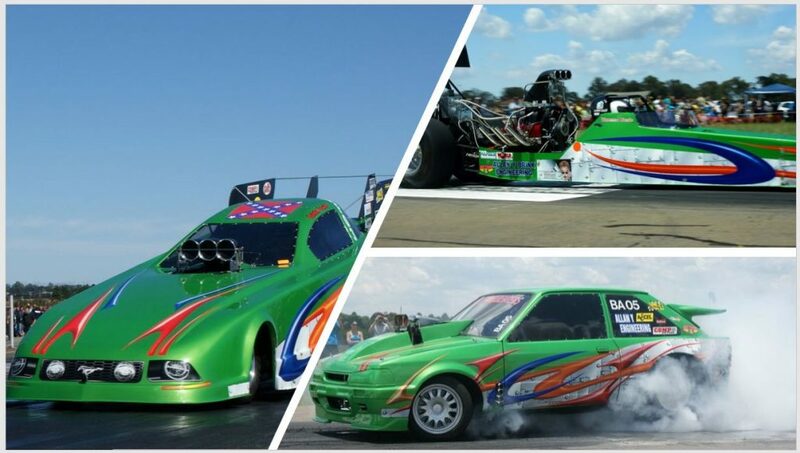 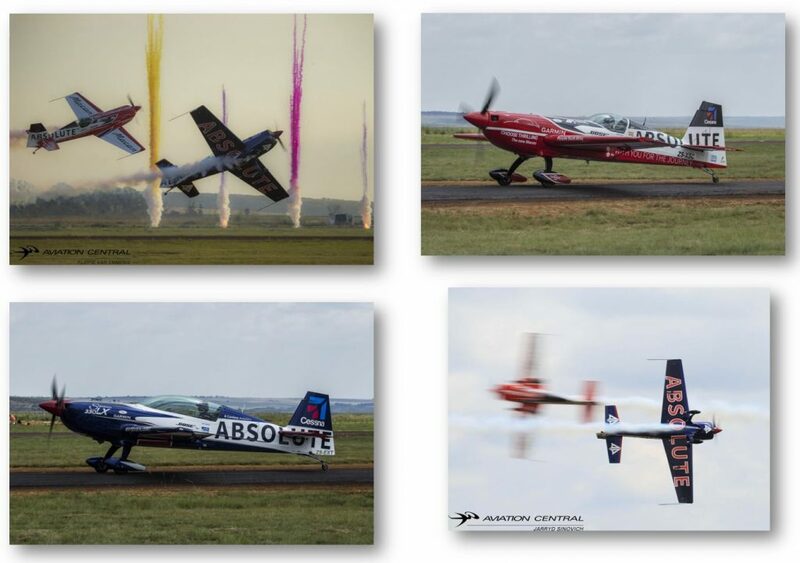 Some of the provisional entries on the list for the Aero Club Airweek 2019 that is scheduled for this week that ends with a Stunning High Energy Middelburg Airshow 2019 that will future Fireworks and Dragster Cars racing against Aircraft and Choppers. 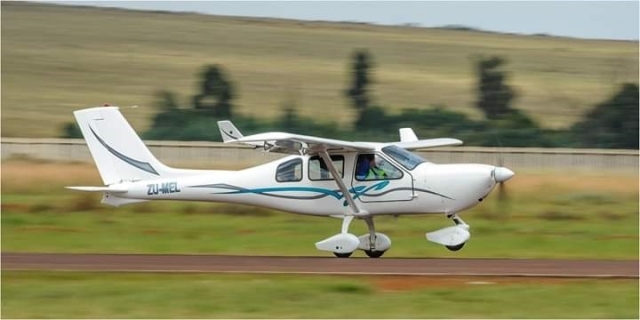 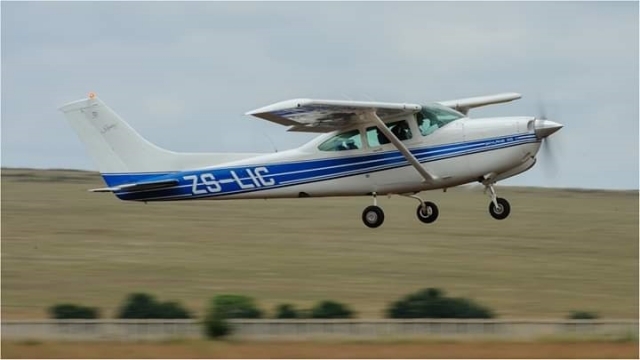 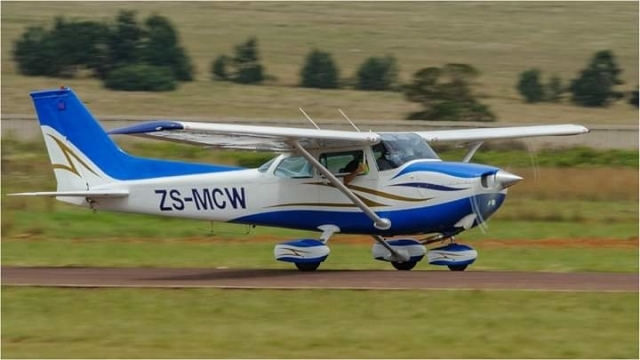 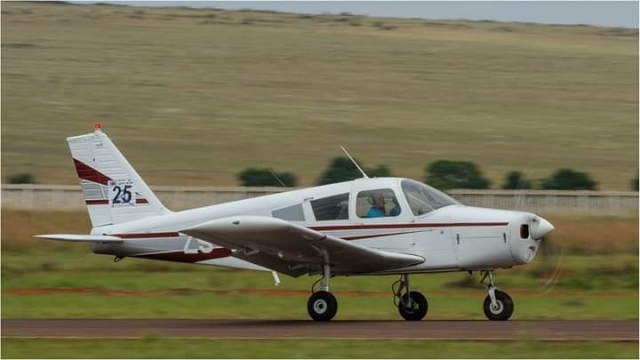 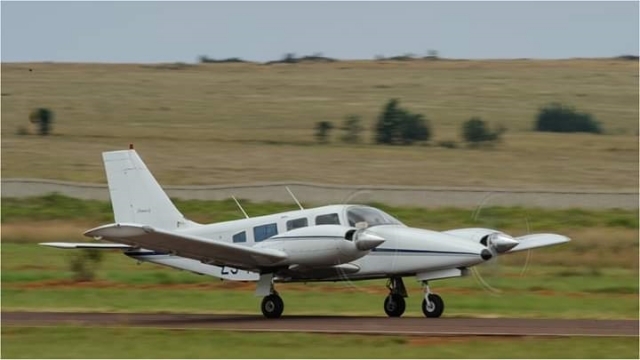 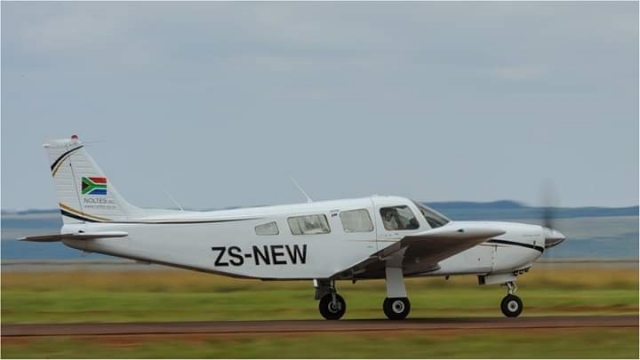 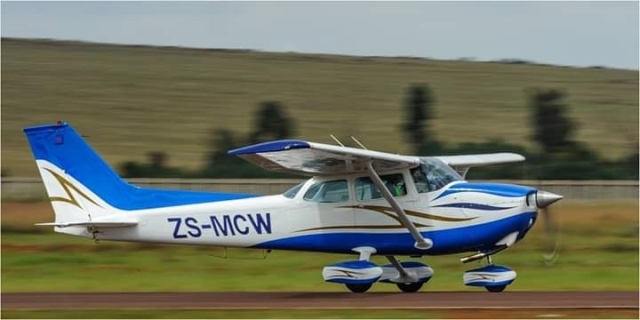 The Commercial Aviation Association of Southern Africa (CAASA) is proud to announce the results of its composite index of aviation activity for the 4th quarter of 2018. The CAASA Aviation Activity Index (CAAI) is based on 25 different indicators and provides an objective & balanced gauge of economic activity in the commercial aviation industry. 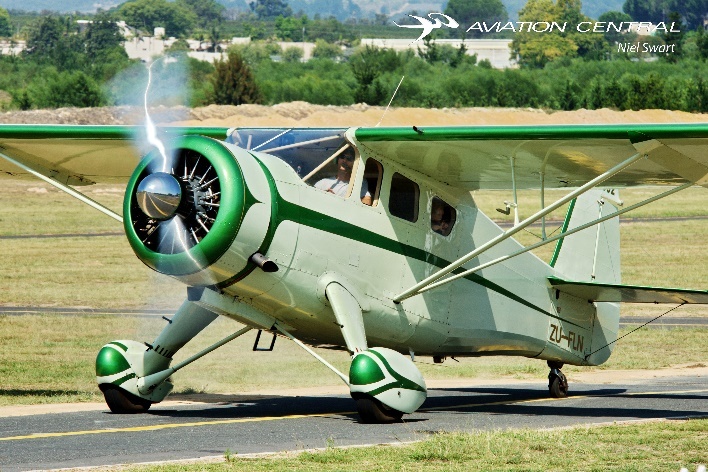 Due to the short-term volatility inherent in purchasing and selling aircraft, where units are small, but the currency values are very high, the CAAI includes a trend that is based on a 4-quarter moving average, as illustrated by the graph. 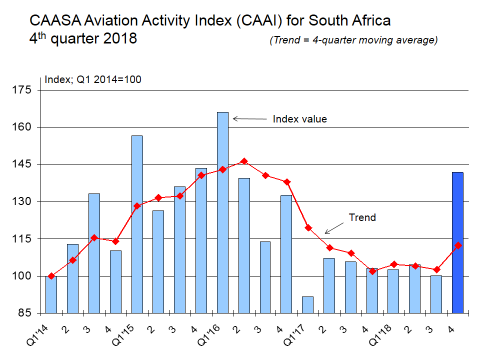 The CAAI index value recorded a sharp increase in the 4th quarter of 2018 to a level of 142, which represents an increase of 42% over the base period for the Index (the 1st quarter of 2014). 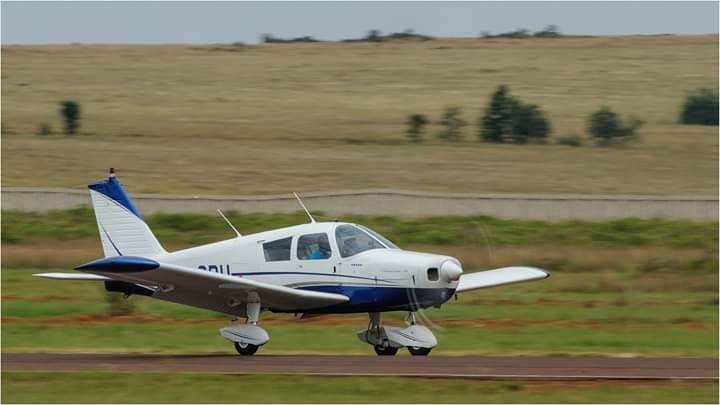 In the process, the index value seems to have recovered to the average level that was recorded between mid-2014 and the end of 2016, after which a declining trend commenced that saw the index slip back to a level of 100. 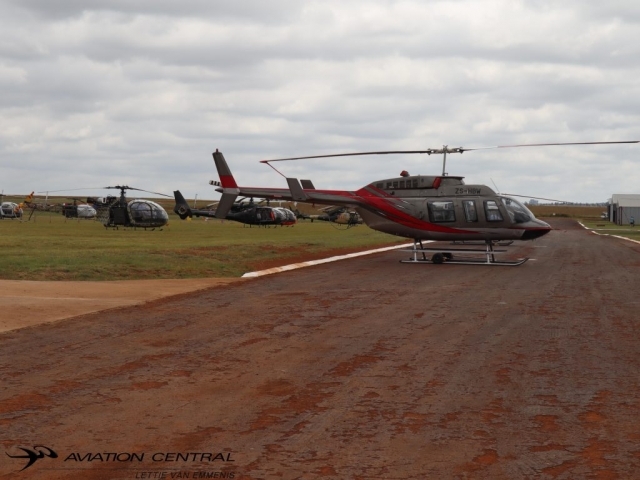 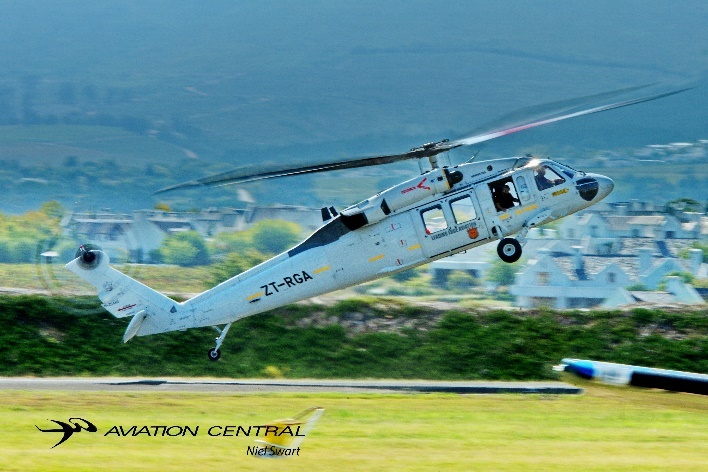 A strong rise in the value of helicopter exports represented the main reason for the welcome recovery of the CAAI. 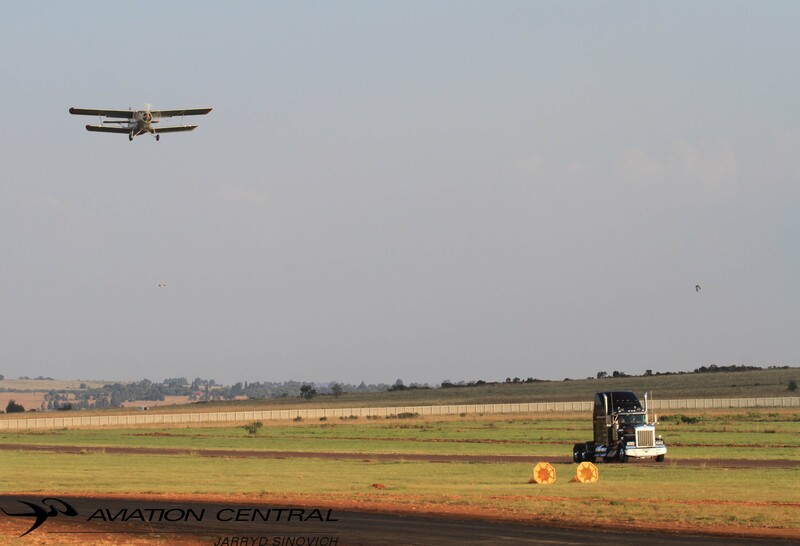 Both categories (mass of below 2 tonnes and mass above 2 tonnes) recorded record high export values. 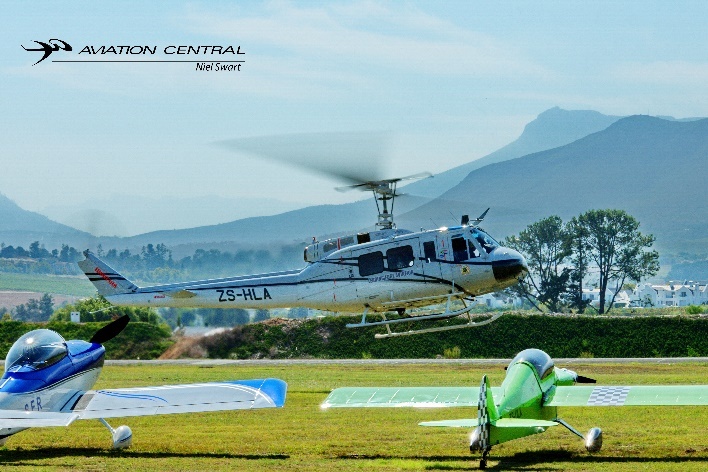 A second contributing factor to the stellar performance of the CAAI during the 4th quarter of 2018 was strong growth in import values for aeroplanes and helicopters. An encouraging feature of the latest CAAI is the broad-based nature of recovery of commercial aviation activity, with a total of 16 of the 25 different indicators recording gains over the 4th quarter of 2017. 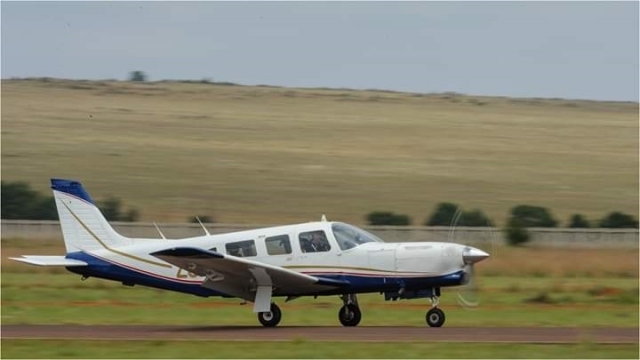 The declining trend in air traffic movements (ATMs) at two ACSA airports, namely Port Elizabeth and East London, is a point of concern, particularly due to the abundance of tourism facilities in their surrounding areas. 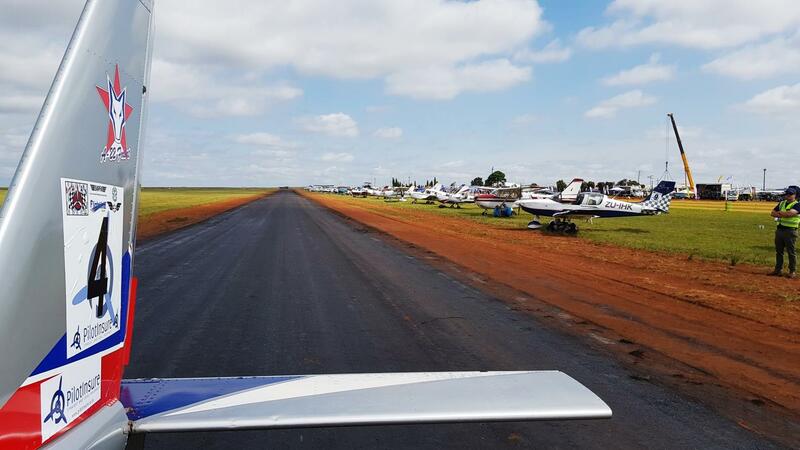 Combined with low growth in ATMs at the larger ACSA airports, it is clear that inbound tourism from overseas has not yet recovered from the ill-conceived stricter visa regulations that were implemented during Mr Malusi Gigaba’s term of office as Home Affairs Minister. 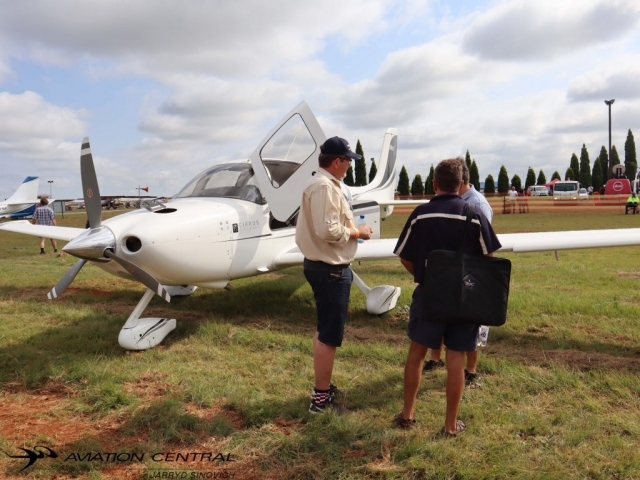 Care should nevertheless be taken with the interpretation of the CAAI results. 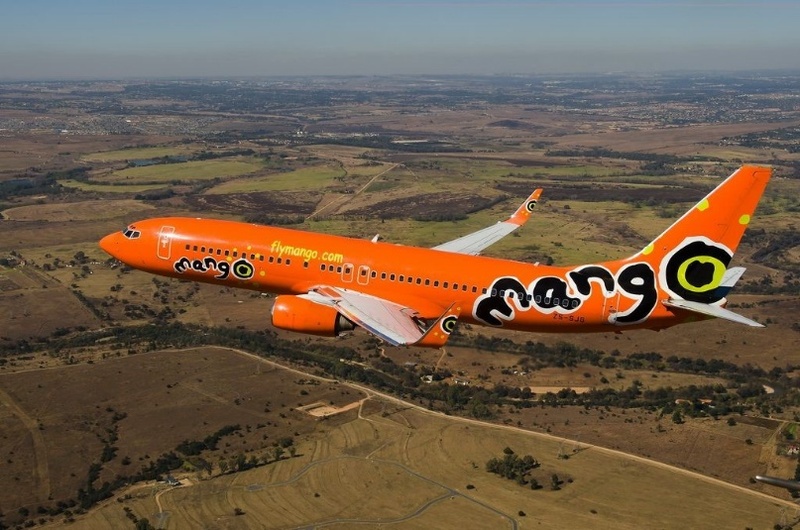 Commercial aviation activity in South Africa has suffered the same fate as several other sectors of the economy over the past two years, namely insufficient demand, flowing from lethargic economic growth and low levels of business and consumer confidence. Other reasons for the generally subdued levels of activity in commercial aviation since 2017 include high interest rates, higher fuel prices (until recently), and the effect of a volatile and undervalued currency. Combined with the lingering threat of land expropriation without compensation (EWC), this has not been conducive to investment in new productive capacity – a problem that exists in most of the country’s economic sectors, as confirmed by a consistent declining trend in real capital formation. 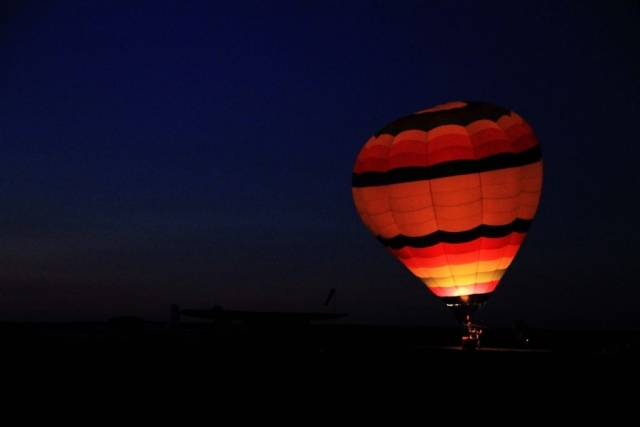 Hopefully, the reforms aimed at improving growth that have been promised by the country’s new president, will start to bear fruit after the May elections. 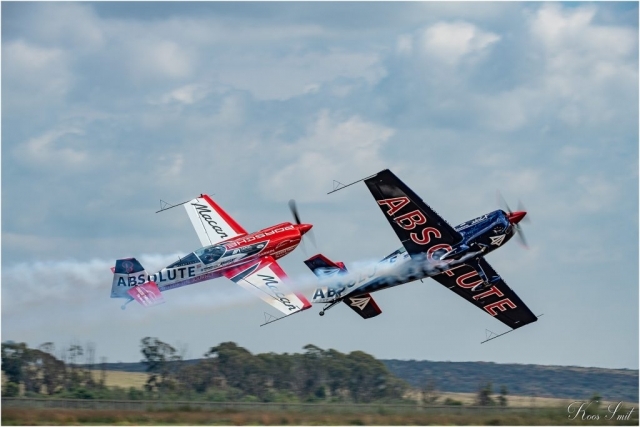 The best performing indicators in Q4 2018 are listed in the table. 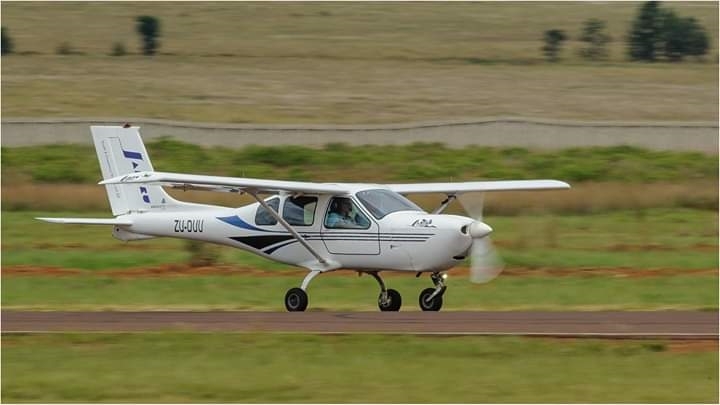 Firstly, the recognition of the indispensable role that commercial aviation plays in facilitating the rapid transport of decision-makers in all spheres of society. 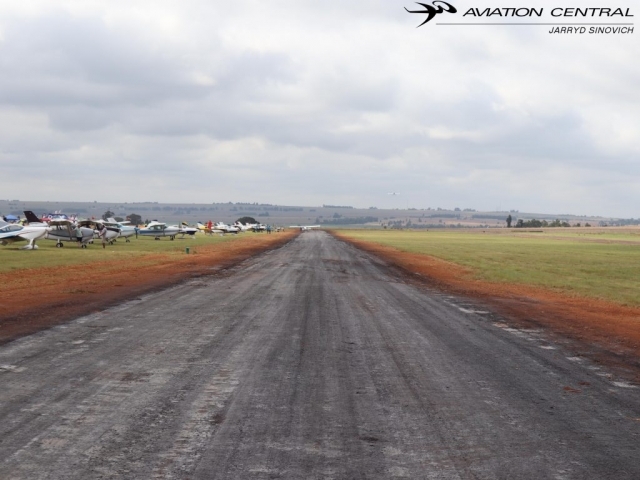 Secondly, individual data sets reflecting one or more areas of commercial aviation activity often contradict each other, particularly as a result of the capital intensive nature of the industry’s asset base. 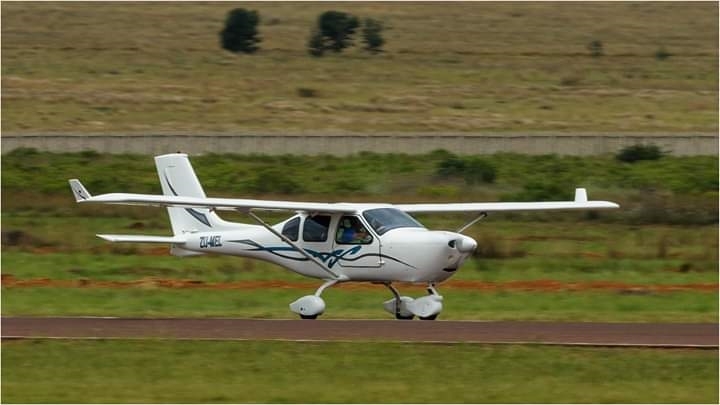 Thirdly, CAASA has identified a need amongst its members and other stakeholders in aviation to contribute to the knowledge base of conditions in the aviation industry by forging a number of key indicators into a composite index, weighted in terms of their perceived contribution to the general trend in commercial aviation. 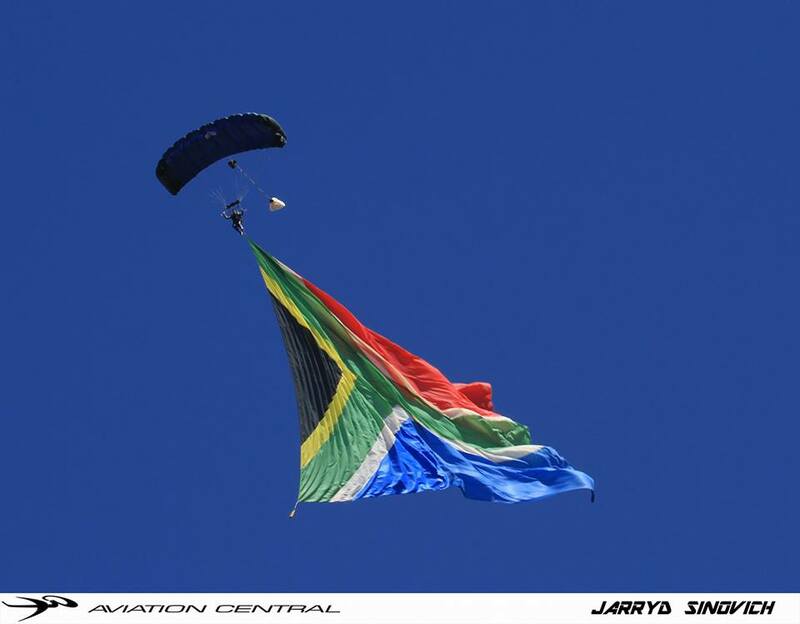 The SA National Defence Force (SANDF) would like to extend its sincerest gratitude to the residents of the Mother City and the surrounding areas in the Western Cape for their rousing welcome and support throughout the planning and execution stages of this year’s Armed Forces Day event. 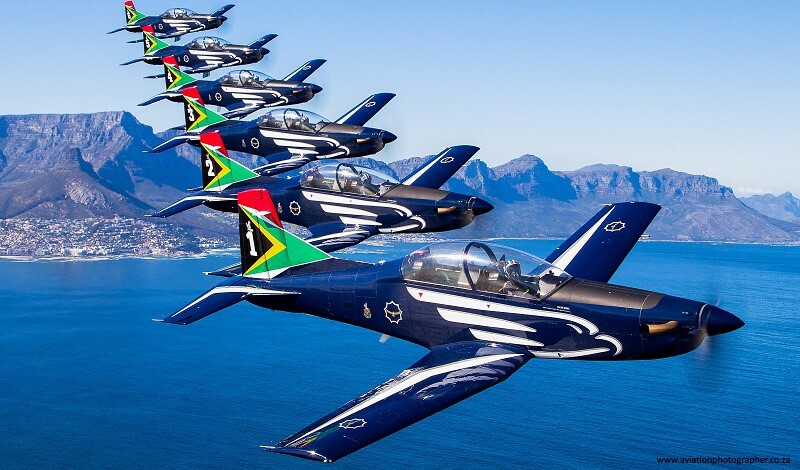 What the SANDF has achieved in Cape Town would not have been possible had it not been for the authorities and people of this marvellous city. 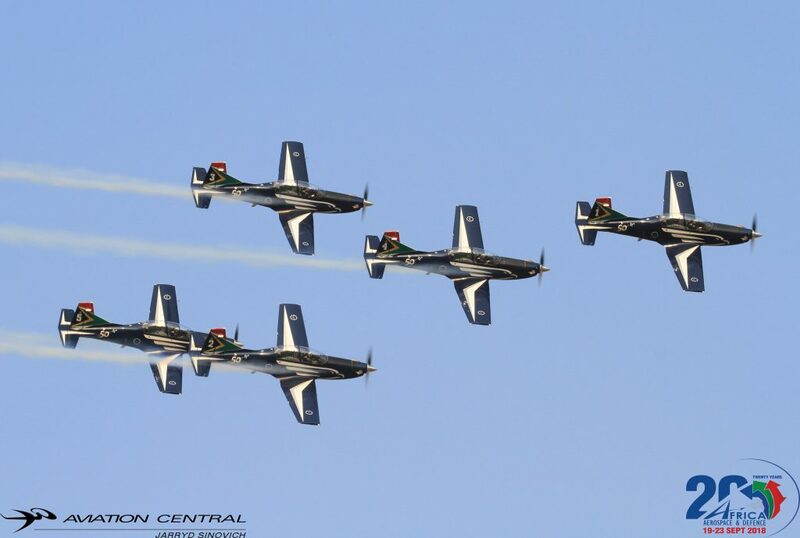 It was through their support that the SANDF successfully managed to commemorate the sinking of SS Mendi, honour its heroes and heroines in the largest military parade in Cape Town since 1994 and conduct real-time mission readiness training to showcase the readiness of the SANDF. 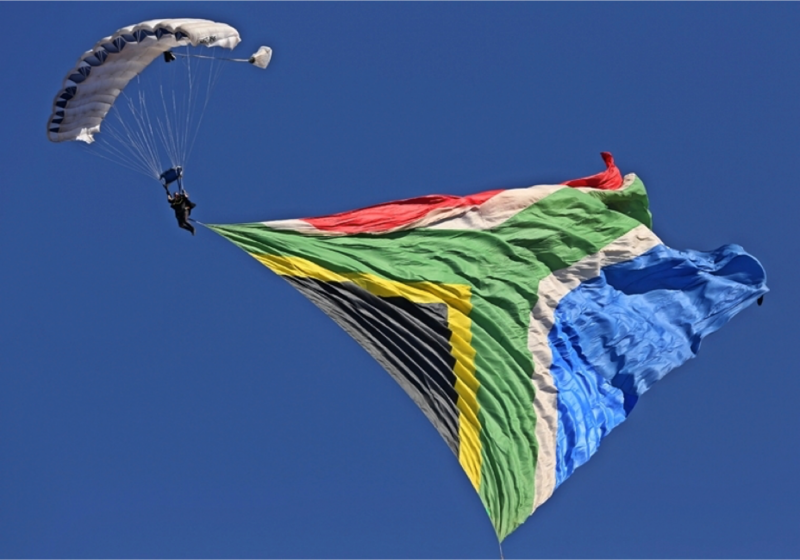 As we mark 25 years since the establishment of the SANDF as a defence force for the people, we are reaffirming our commitment towards the maintenance of a diverse national defence force that serves not a select few within the population of South Africa but the entire citizenry, united in their diversity. 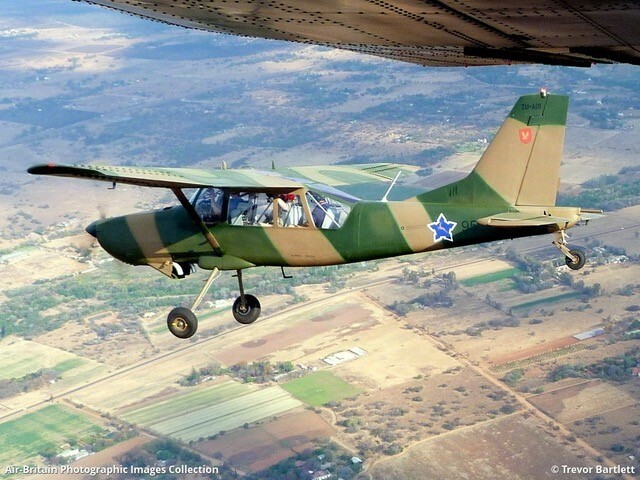 We reaffirm our constitutional pledge to never allow horrific events of yesteryear to happen again with tanks and Casspirs rolling into our people’s residential areas and causing untold mayhem, killing and terrorising our people. We understand our position in a constitutional setting and have pledged total commitment towards remaining apolitical and steer away from the charged political domain interrogated in our public discourse. 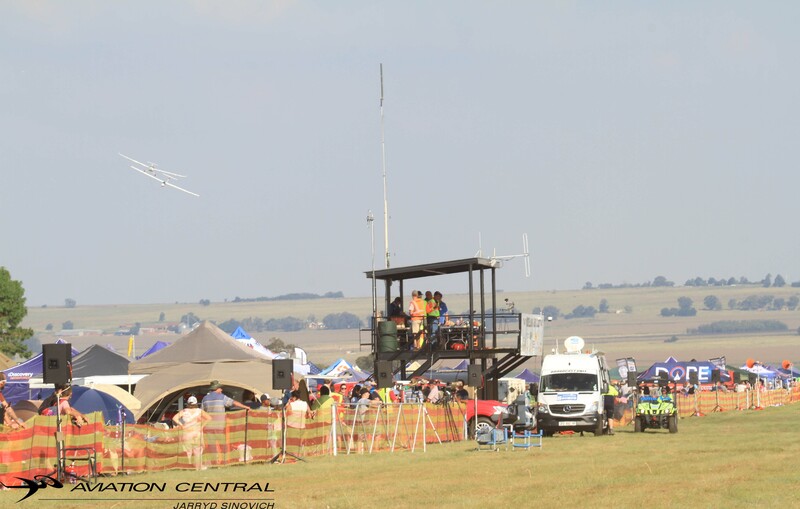 As the SANDF, we serve the people of South Africa and shall under no circumstance harm their interests and constitutional aspirations. 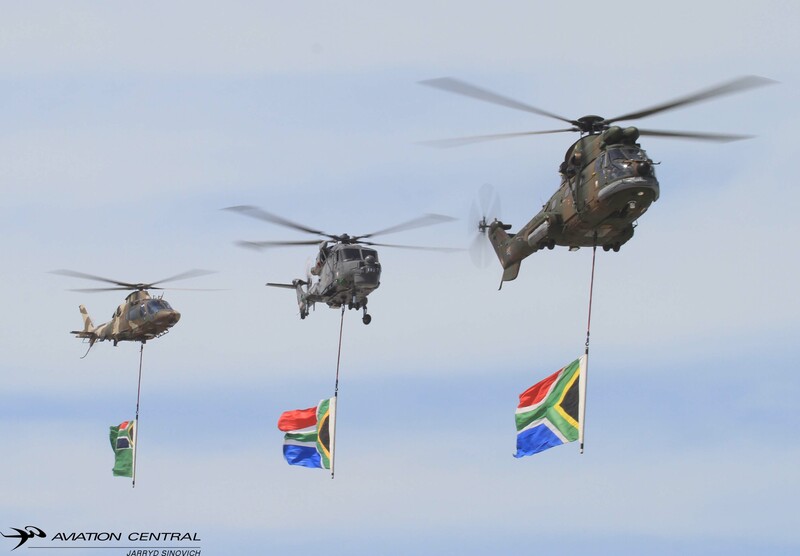 The SANDF is a constitutional creation that sources its existence, structure and functions from our world-renowned Constitution, Act 108 of 1996, and will always strive to defend our democracy and a unified South African nation. 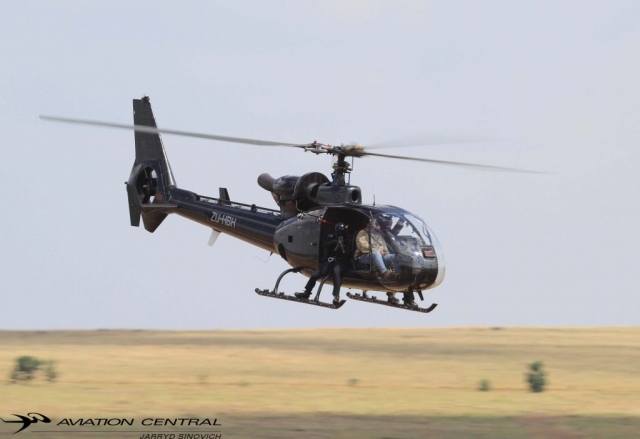 Revered American civil rights leader, Dr Martin Luther King Jr once advised that: “Those who love peace must learn to organise as effectively as those who love war,” and as the defence force of a peace loving nation we heed those wise words and always ensure that our troops are thoroughly prepared for any eventuality regardless of the shape of the battlefield, hence our force readiness operation conducted in Cape Town through the Night Shoot and Capability Demonstration. 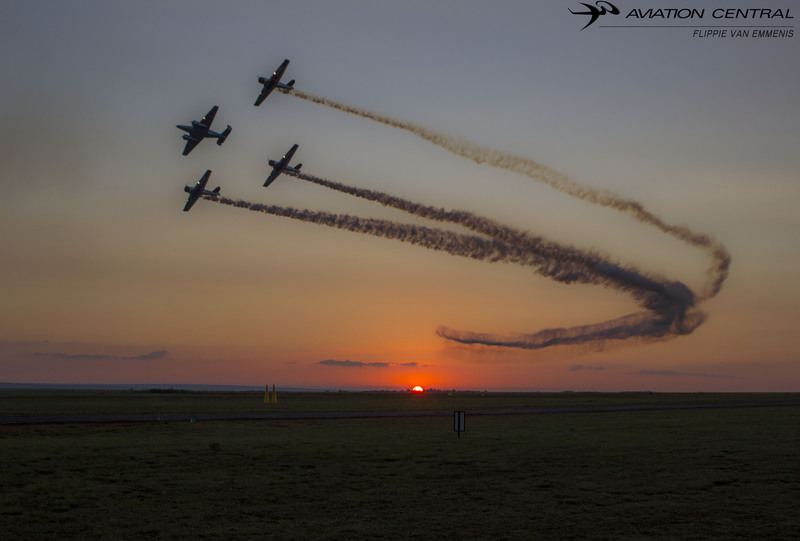 AFD 2019 provided us with an opportunity to flex our military muscle and also test our logistical readiness to sustain a force engaged in a domestic operation with elements transported from across the length and breadth of our country. 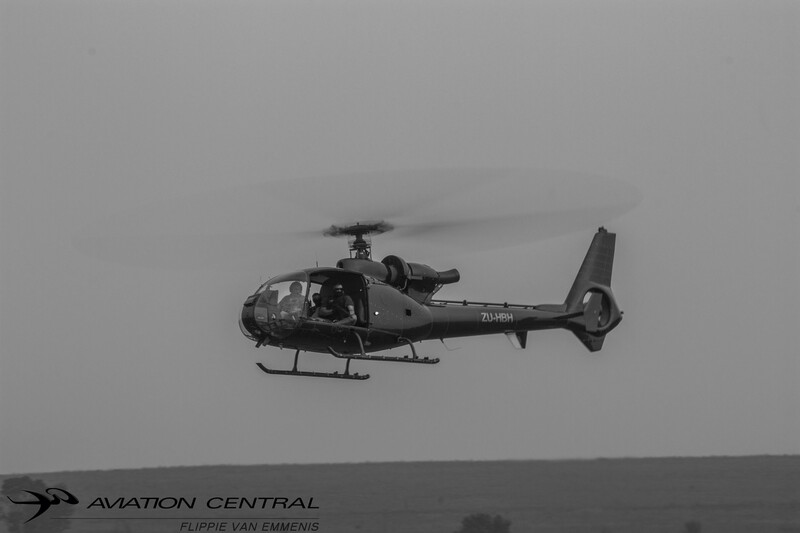 It is through these force preparation exercises allow us to play such a valuable role on our continent in Peacekeeping Operations. These exercises allow us to silence the bone-ravaging guns of the M23 in the DRC and bring lasting peace in Burundi and other conflict ridden areas across our vast continent. 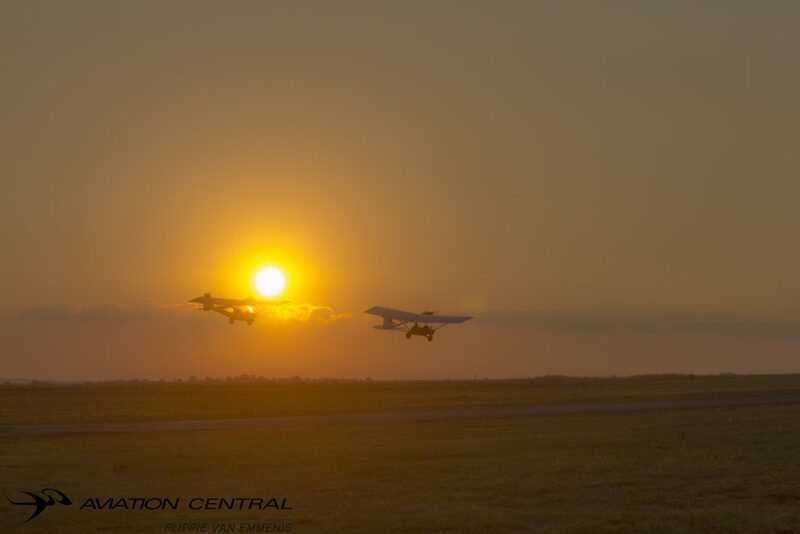 The Cape Town terrain also allowed us to test the operational readiness of our technical service corps who shown their rapid reaction capability recovering a Kwêvoël Samil 100 from the sand at Sunrise Beach during the massively attended Capability Demonstration. 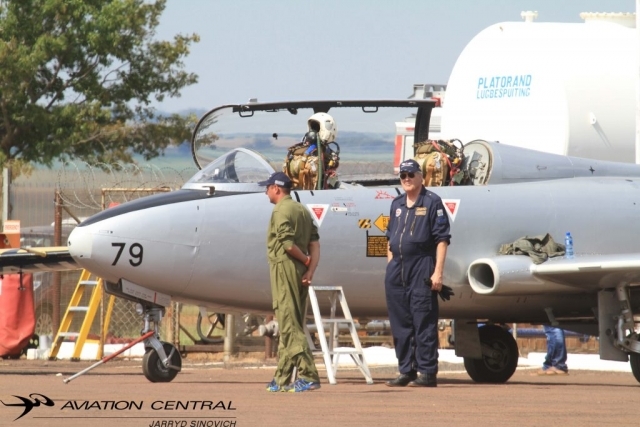 Unfortunately, no matter how great a job the SANDF does, there are some sectors within society – those who are conceited and undermine the gains made since the advent of democracy – who will find or even fabricate issues to malign the good name of the SANDF. One such example was an instance where an apartheid era image of a Ratel Infantry Fighting Vehicle half-submerged underwater was falsely assigned as an SANDF vehicle with the writer suggesting that it shows the disdain and incompetence of our soldiers, to manage expensive state-of-the-art military hardware. 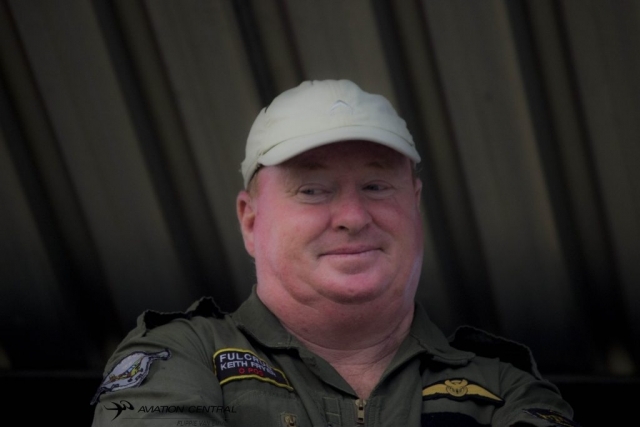 As we all know, that accusation was conceited, misleading and served to propel a narrative that seeks to discredit our defence force without cause. 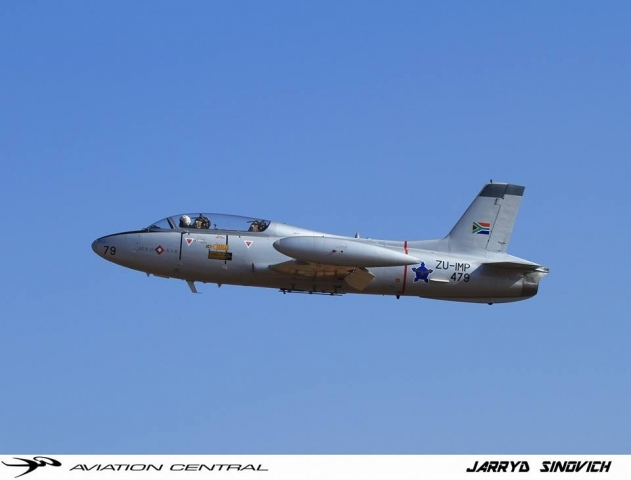 There is a saying that “A picture is worth a thousand words.” But when that picture is a misleading one about the country’s armed forces, there is a great danger that the people might turn against the very same military that was created to defend them, and for this all patriotic South Africans must condemn advocates of such fallacies and divisive innuendos with the contempt they deserve. 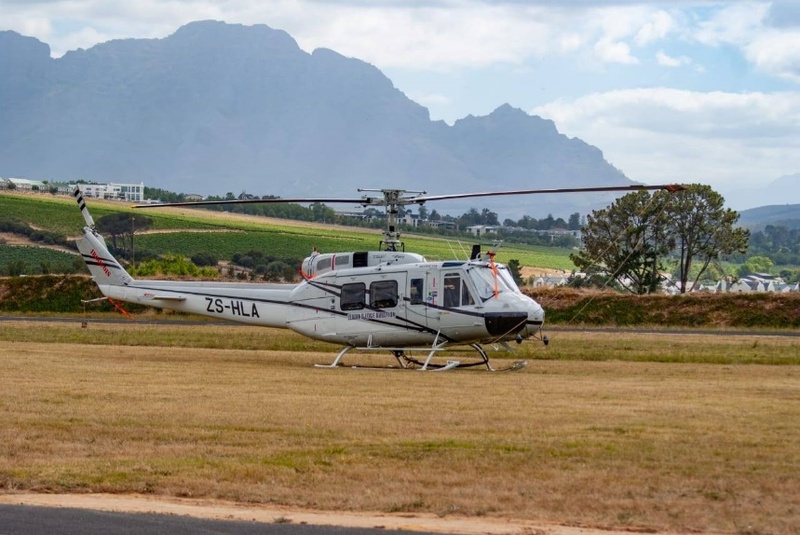 There were also isolated incidents where some residents felt our presence in the Western Cape would harm the marine eco-system and biodiversity. 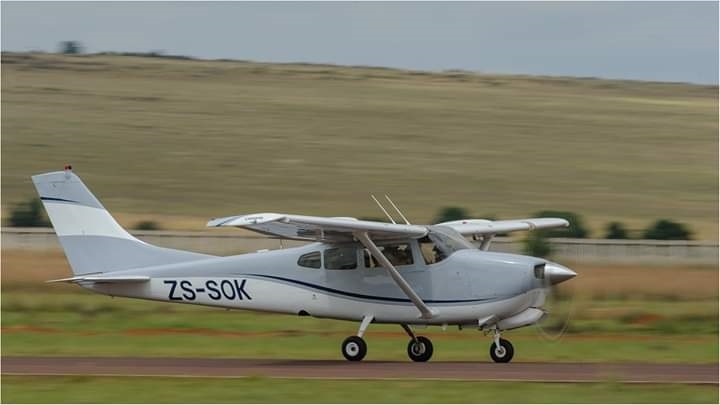 We can ensure the citizens of South Africa and especially Cape Town that as the SANDF we confirmed that the city stakeholders dealing with these stated fields of interest were consulted and all by-laws adhered to with the necessary permissions and remedial measures provided. The SANDF adheres to all laws of the land including environmental health and safety and animal welfare statutes. 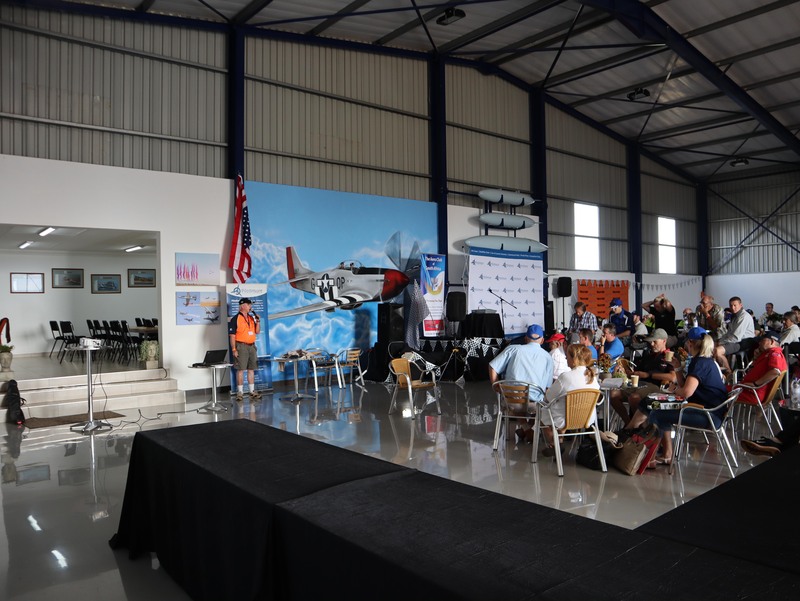 We have done this in all cities we have hosted AFD, especially at the coastal cities of Port Elizabeth and Durban with their vast marine life. The City of Cape Town was not going to be an exception to the norm. 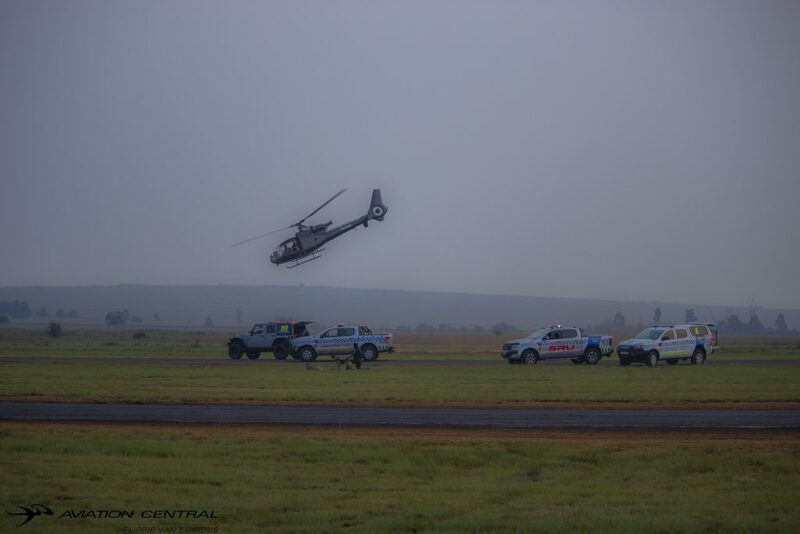 The SANDF adhered to all restrictions from the City of Cape Town and acquired the necessary permissions in as far as all the AFD activities were concerned. We have done in Cape Town what we have done during the previous installations of AFD in Pretoria, Bloemfontein, Potchefstroom, Port Elizabeth, Durban and Kimberley. 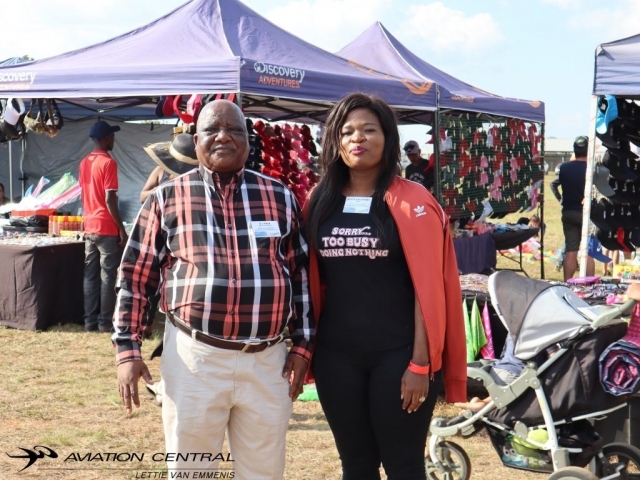 In our quest to stay true to our constitution and what it enjoins us to do, there have always been doomsayers who never wished us well but faltered us even where fairness does not warrant it. It is at times unfortunate when the said criticism is presented in a condescending manner and borders on issues of race and politics – in ‘they and us’ kind of arguments which are a domain we as the armed forces are not empowered or interested in to navigate. The SANDF is an apolitical organisation that is passionate about serving the people and harbours no ambition to be embroiled in political machinations of the day, either with politicians or civilians. 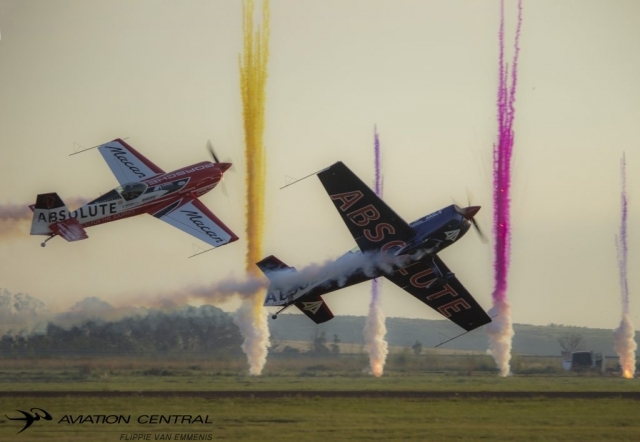 Having said that, we commend the overwhelming support by residents of Cape Town and surrounding areas towards making AFD 2019 a huge success. 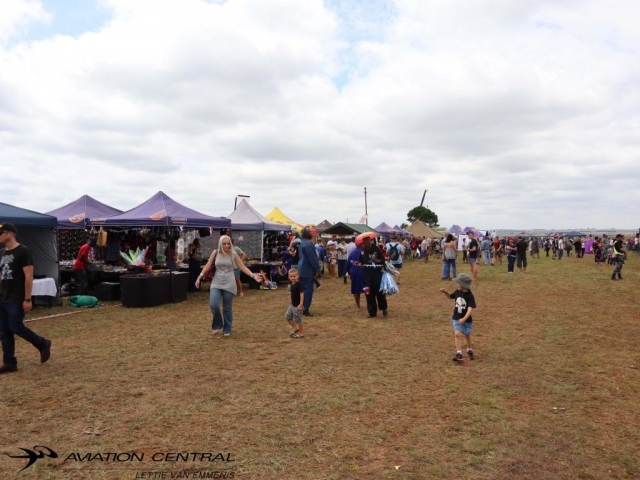 These residents commended the good work that our men and women in uniform do and also praised us for a magnificent display both during the Fan Park activities in Khayelitsha, the Ship Open Days at the Victoria and Alfred Waterfront, the Night Shoot at Sunrise Beach as well as the ultimate parade and Capability Demonstration at Bloubergstrand with the President of the Republic of South Africa and Commander-in-Chief of the SANDF, President Ramaphosa officiating. 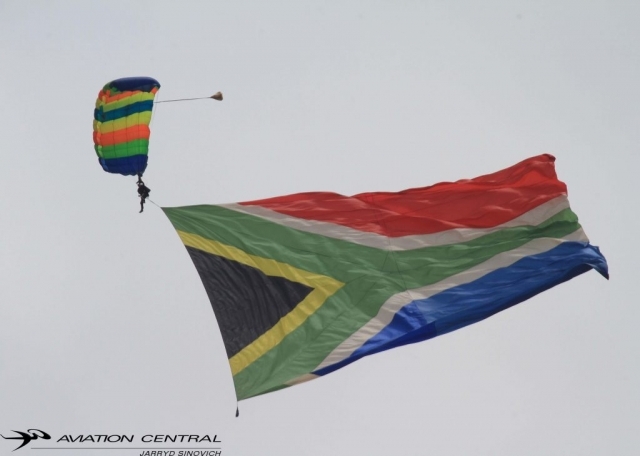 The people of Cape Town came out in their numbers from diverse backgrounds – befitting of a true rainbow nation – to support their national defence force and that is affirmation enough for the great work the SANDF is doing. 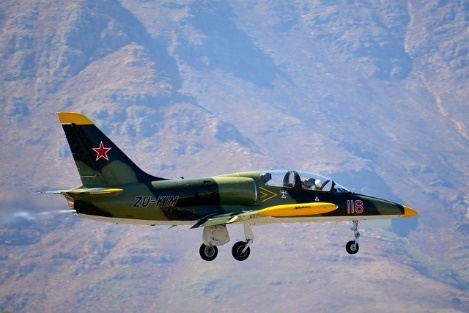 The SANDF’s presence in the Western Cape also served as an economic stimulus as most, if not all services, to sustain AFD 2019 were being locally sourced. Lastly, we appreciate the support given by the community of Malmesbury and all Capetonians in general to the family of our fallen soldier, Corporal Randal Jacques Krynauw from 1 Special Service Battalion, who passed away during an accident on his way to the Mother City for this year’s Armed Forces Day. The SANDF and our principals in government stood side-by-side with his family in their time of need and rendered the level of support in accordance with his ultimate sacrifice. He is a hero that will be added to the roll of honour of our sons and daughters who served their country with pride and a high degree of patriotism. We wish those injured with him a speedy recovery.